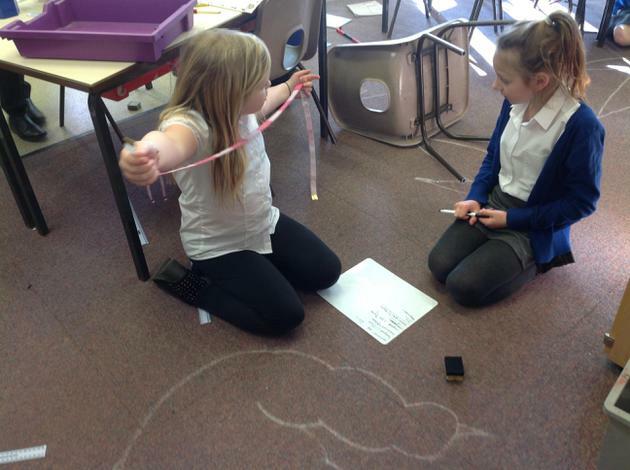 Our afternoon lessons this week have focused on PSHE and Music. 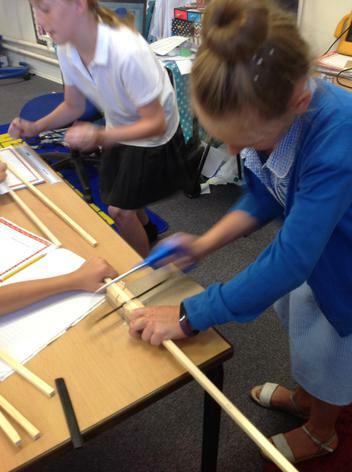 We used our voices, body percussion and instruments to create our own 'machine' music. 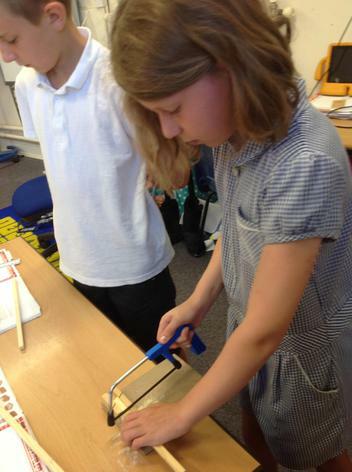 Here we are re-creating sounds made by trains. 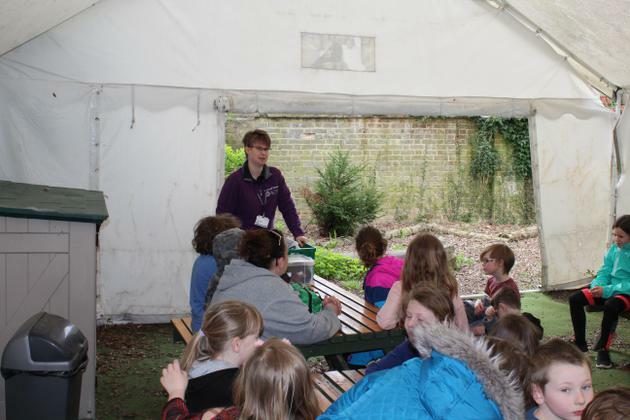 On Friday, we went on our end of year trip to Cadbury world! 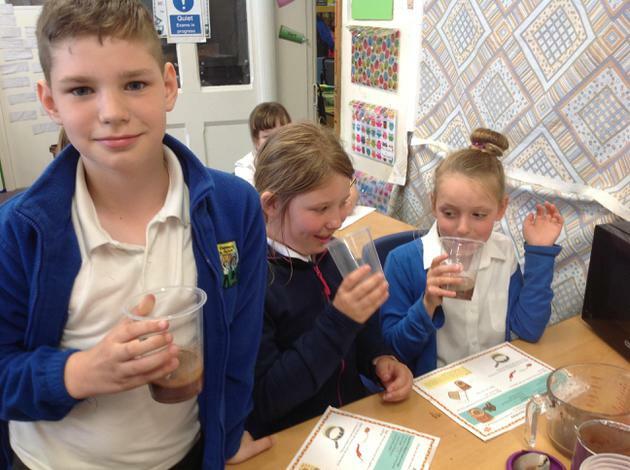 First we walked through the Aztec jungle and learnt where chocolate first came from and how it developed over time. 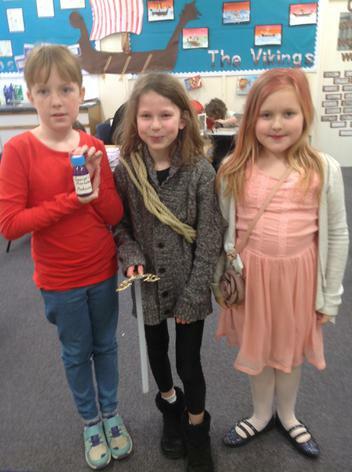 We also learnt about the history of Cadburys and saw a replica of the first ever Cadburys shop. 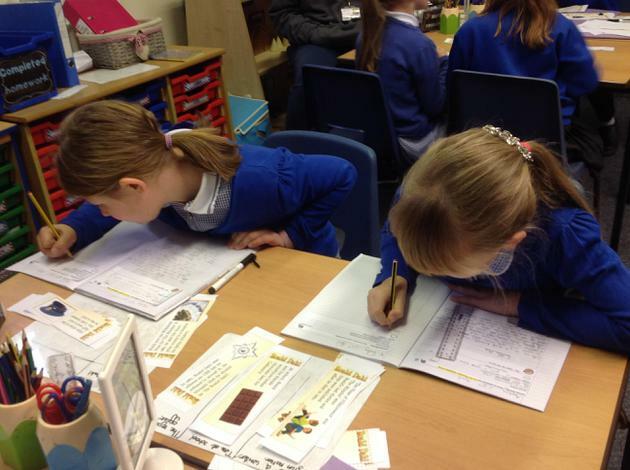 We enjoyed learning about the different products and had a go at writing with chocolate. 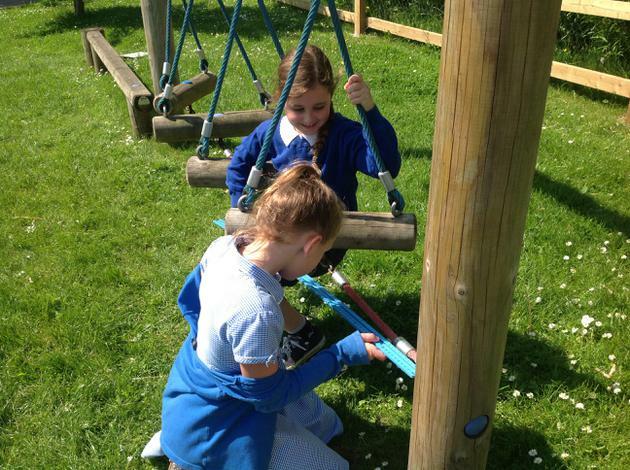 Then we got a ride on the Cadabra ride! 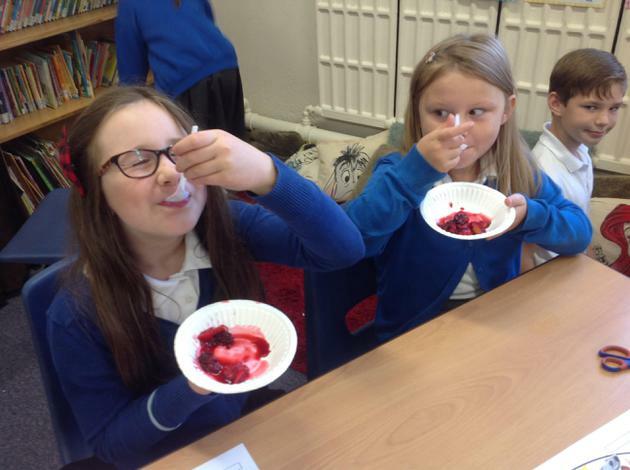 But one of the best parts was definitely the taste testing! 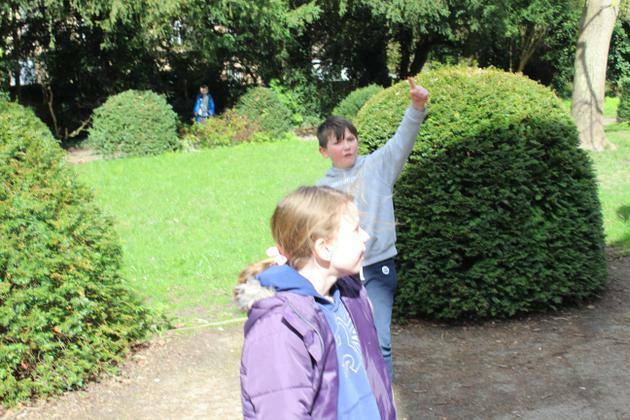 We then ended our day with some games, poses and a trip to the 4d cinema. 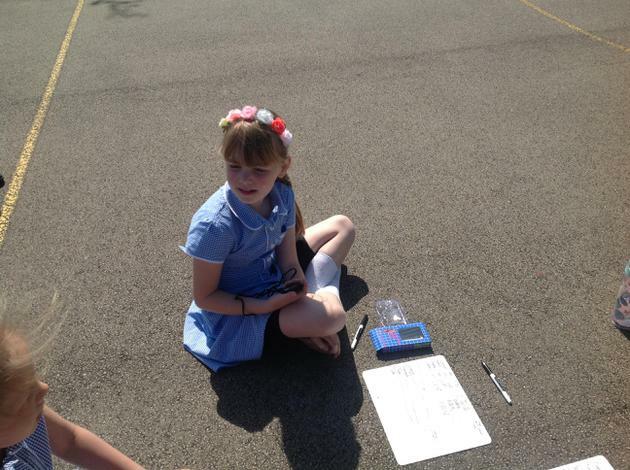 This week in Maths, we have been handling data! 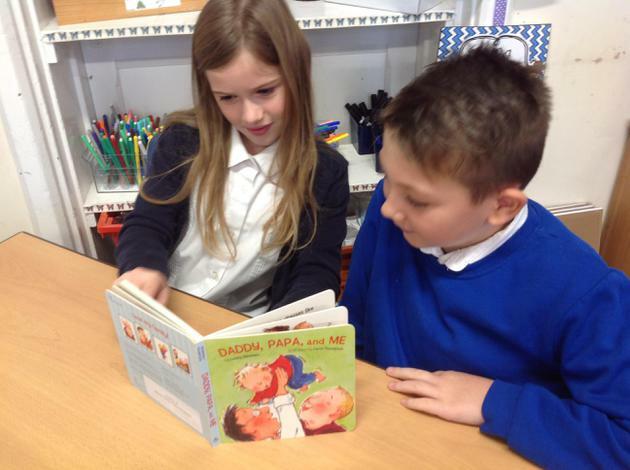 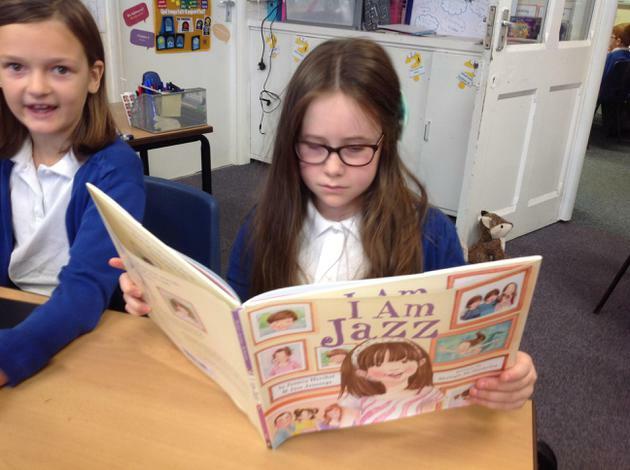 First we went around the class and asked everybody what their favourite Roald Dahl book was. 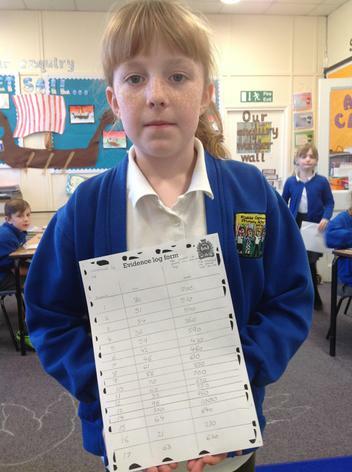 We displayed this information in different charts. 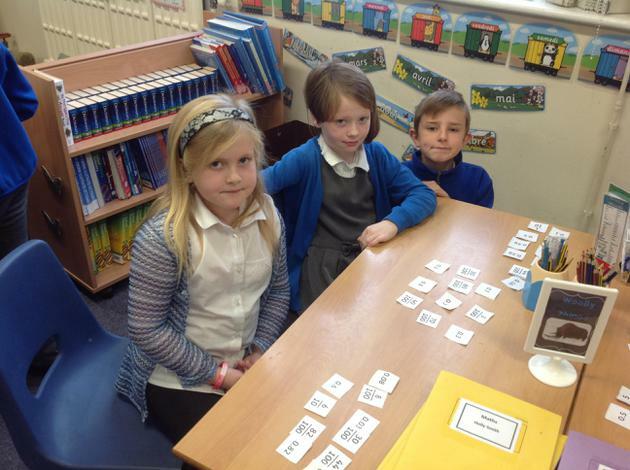 Finally we created bar charts to show the information. 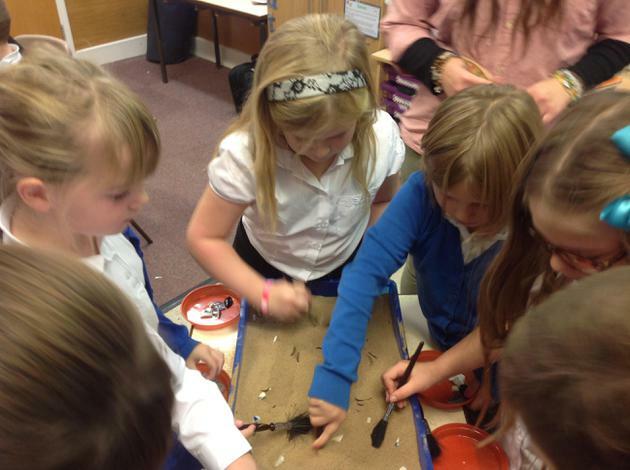 We were also lucky enough to watch the ducklings swim this week! 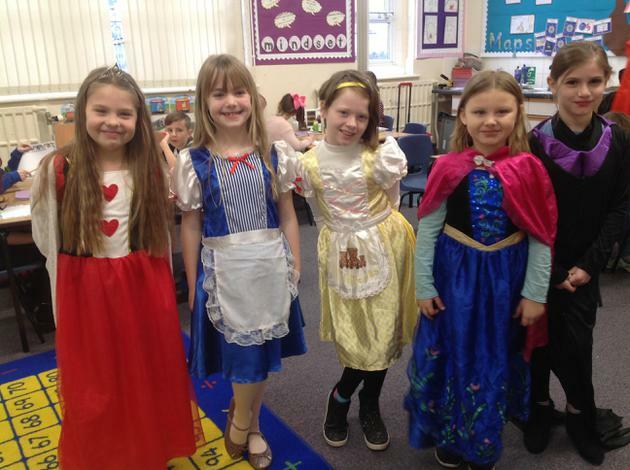 One of our favourite weeks of the year is finally here! 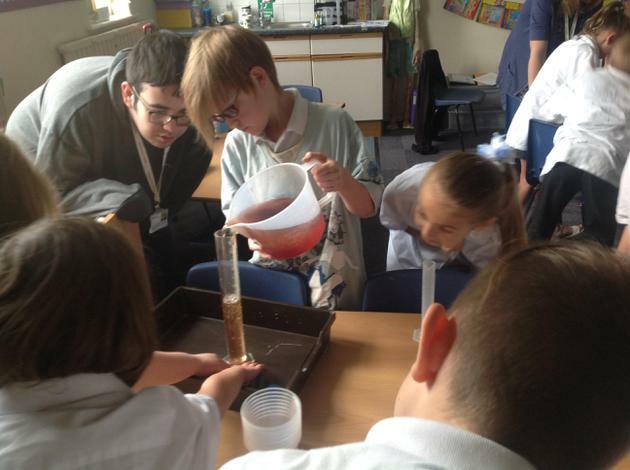 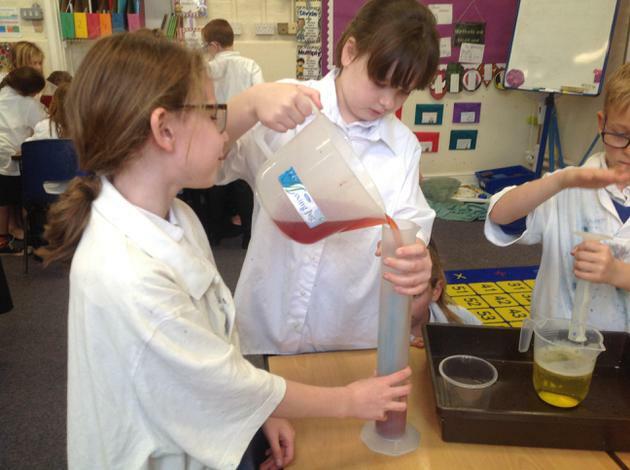 We've jumped straight in with lots of different Science experiments- all linked to the story 'The Twits' by Roald Dahl! 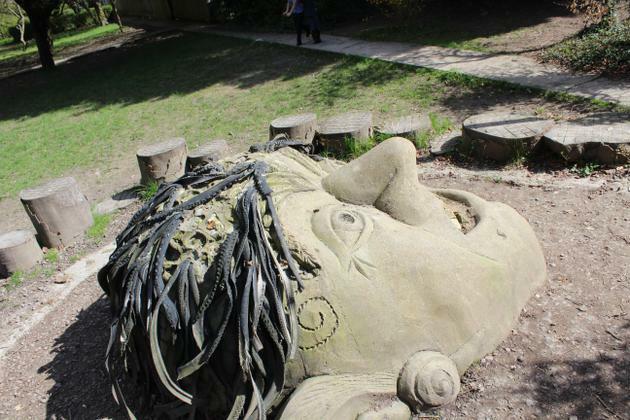 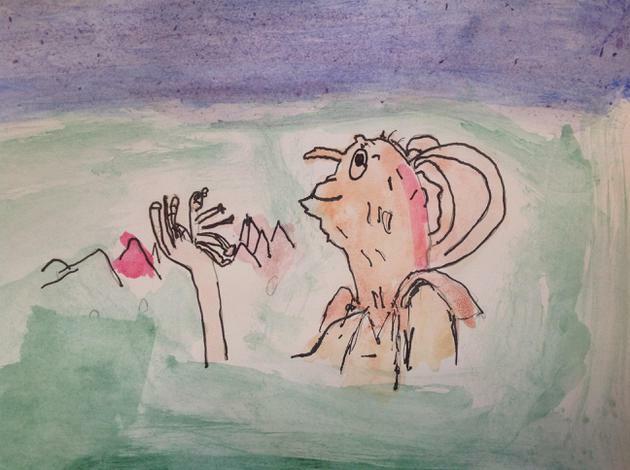 First, we considered the hygiene of Mr Twit and his beard. 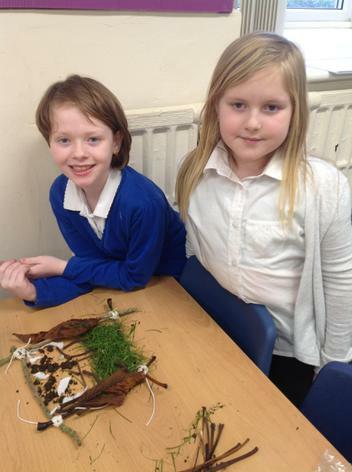 We thought about all of the food that would be decaying and wondered whether it would decay quicker in hot or cold conditions. 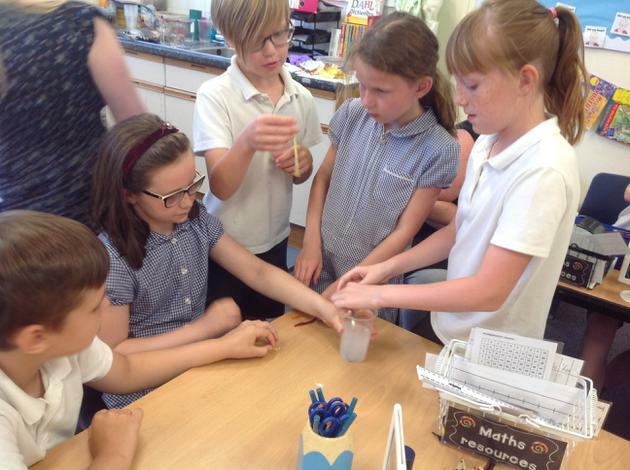 Then we set up an experiment. 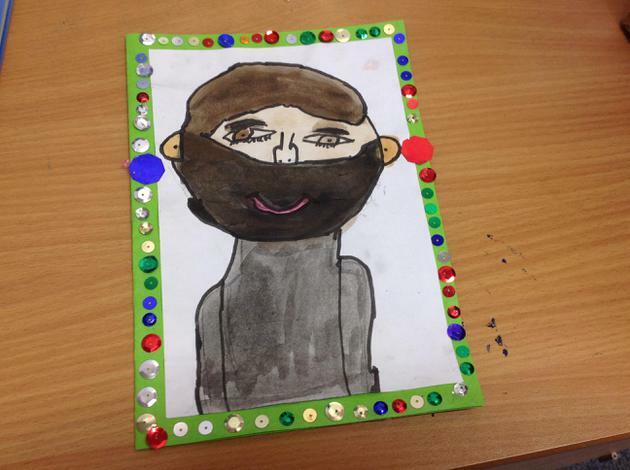 We also wrote a letter to Mr Twit to offer some advice about how he could improve his hygiene. 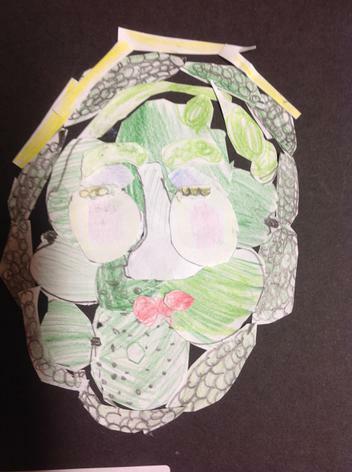 On Tuesday, we read parts of the story where Mr Twit started playing tricks on Mrs Twit. 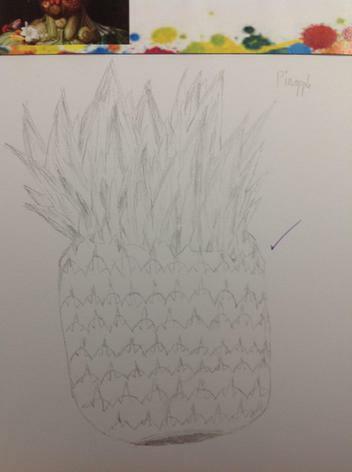 He told us he could even make gummy bears grow. 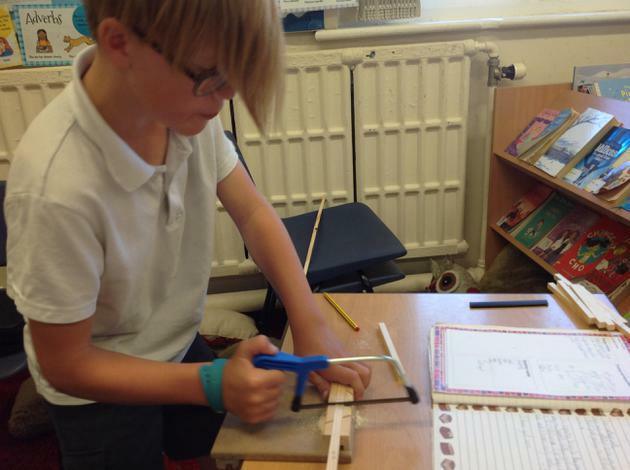 We didn't believe him but thought of different ideas how he could do it. 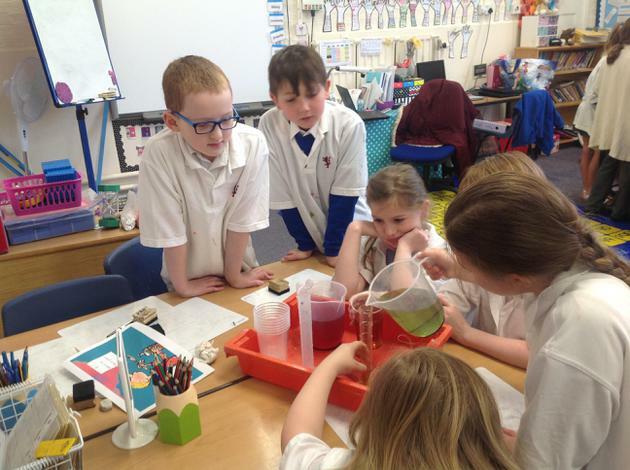 Our favourite idea was to plant the gummy bear and water it... but we decided to put it in water instead. 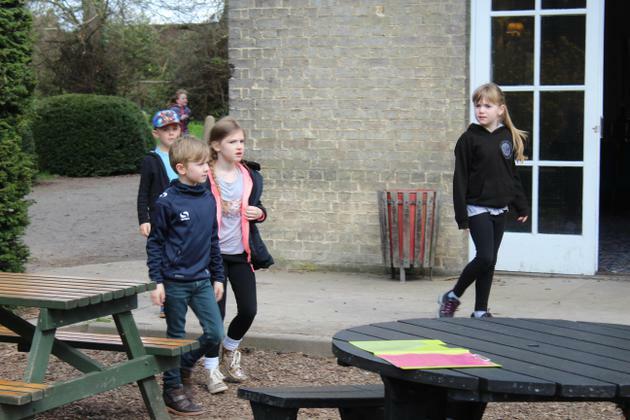 On Tuesday afternoon, we were lucky enough to have our first visit. 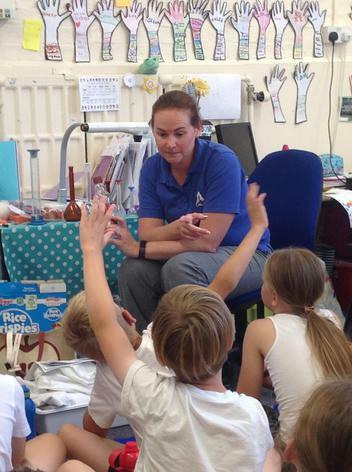 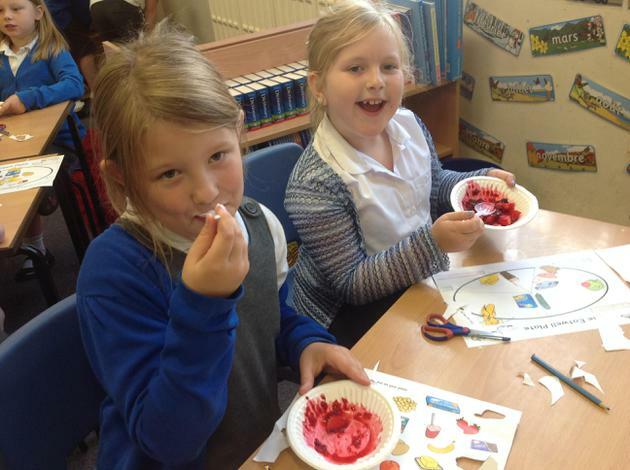 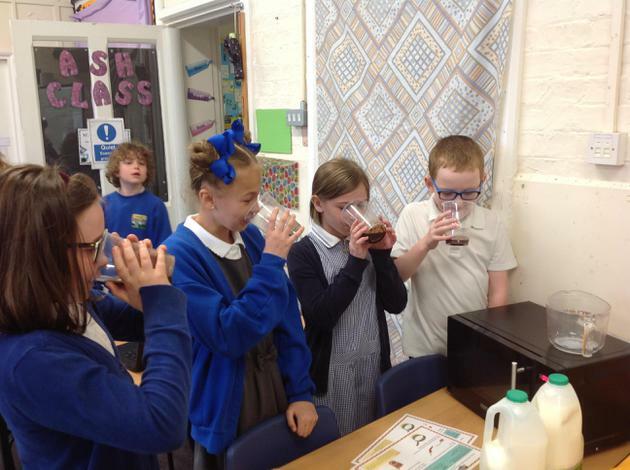 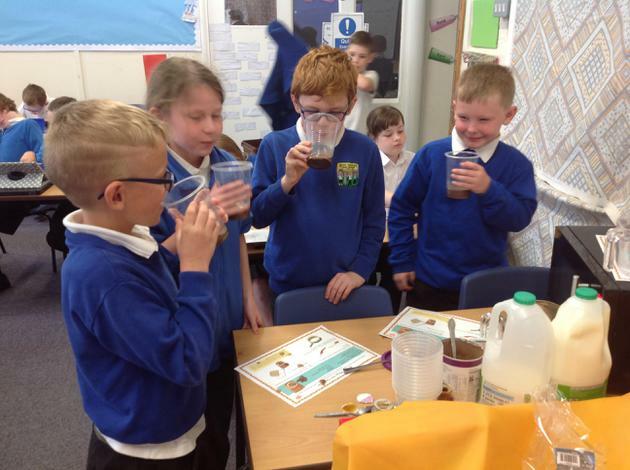 Gemma Parr spoke to us about her job, testing for different vitamins in food products. 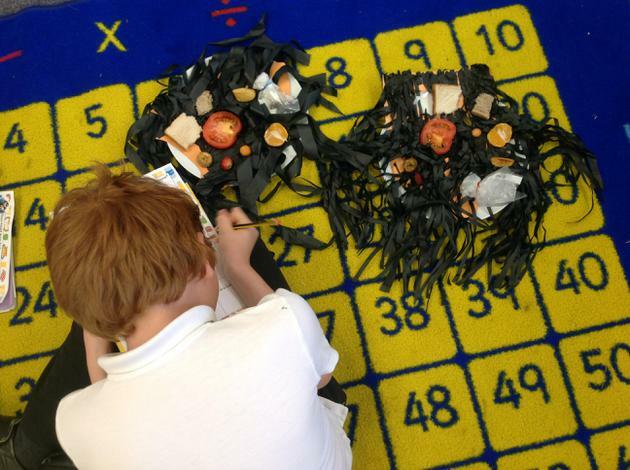 On Wednesday, we read even more of the story including the chapter "Worm spaghetti". 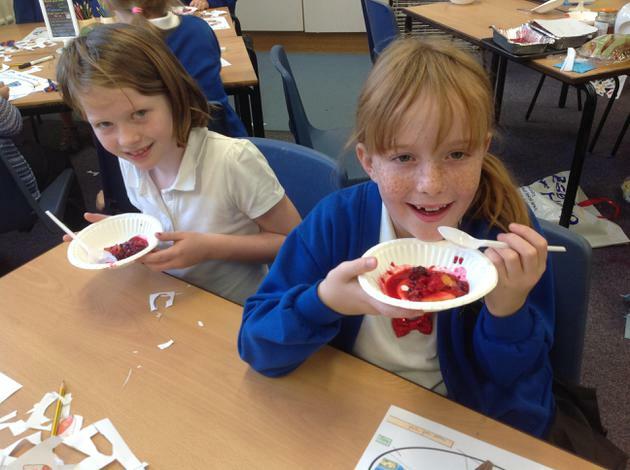 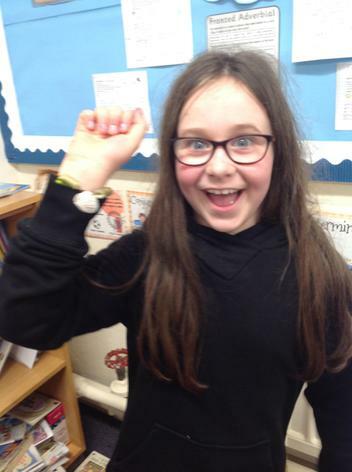 We thought this was funny and wanted to create our own trick of making jelly snakes dance! 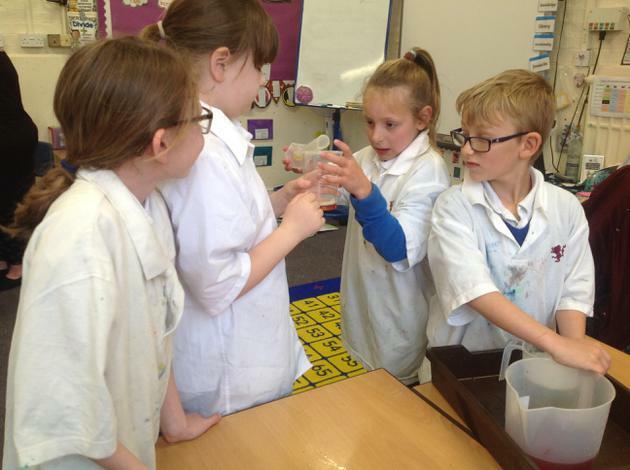 Although this didn't quite go to plan we definitely loved the reaction that happened between the vinegar and bicarbonate of soda. 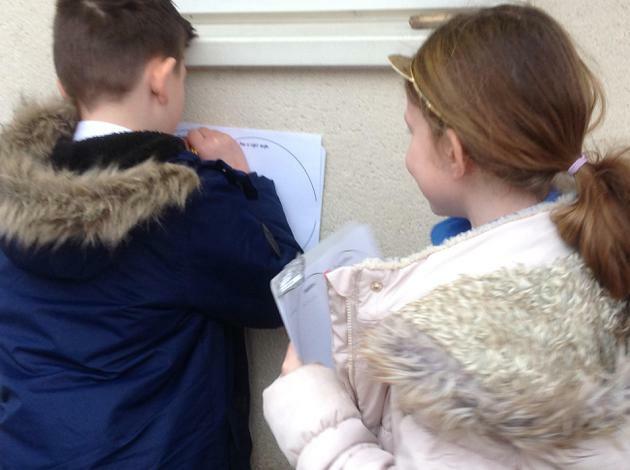 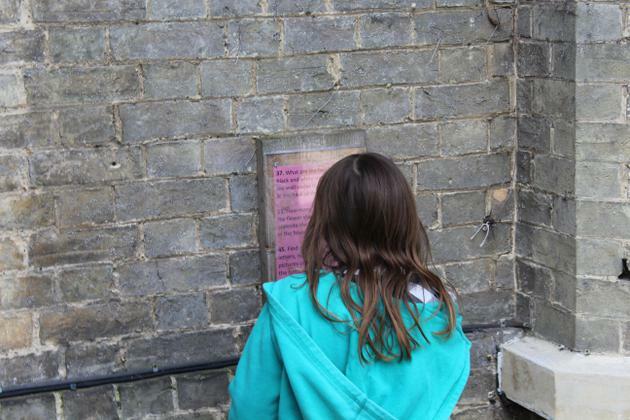 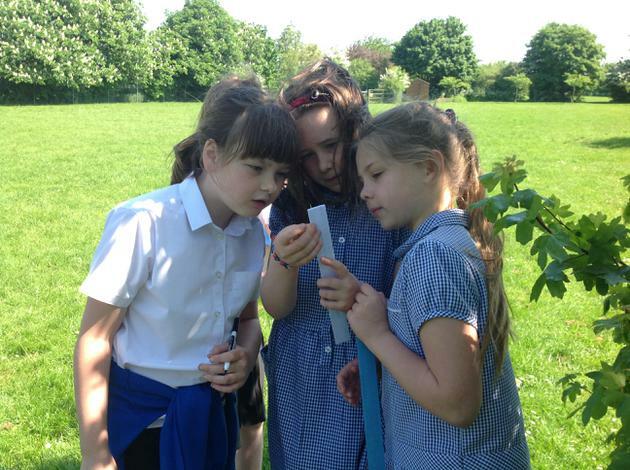 We also had fun completing a Science trail with children from reception. 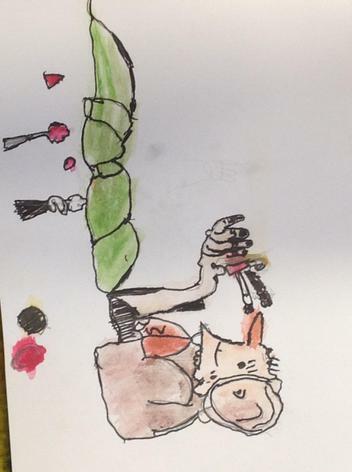 On Thursday, we read the chapter called "Mrs Twit goes ballooning up". 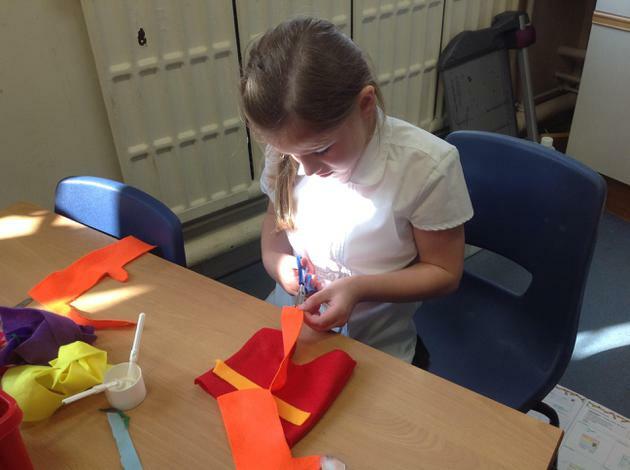 We thought she should have a parachute to help her get home safely. 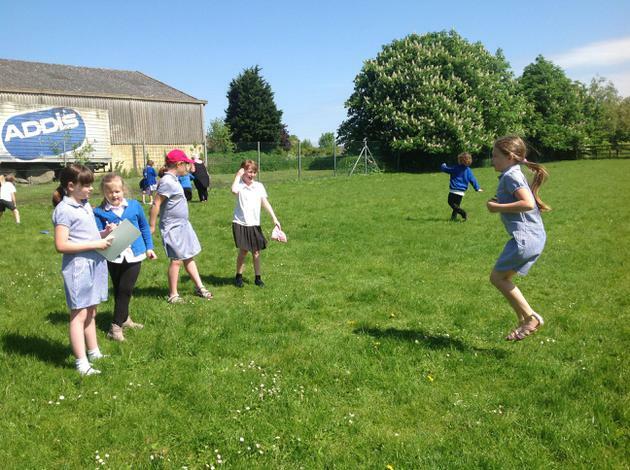 This led us to researching Leonardo Da Vinci and we created our own investigation under the question "Do parachutes with a greater surface area travel slower?". 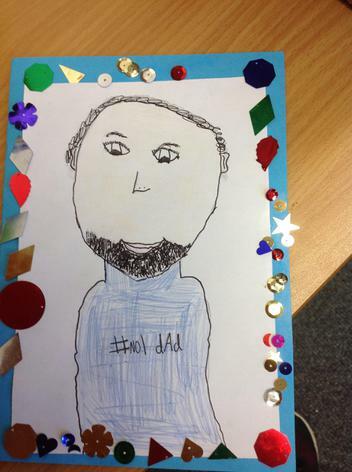 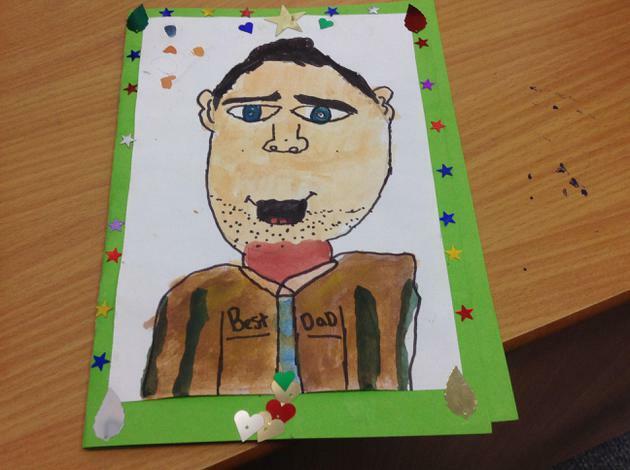 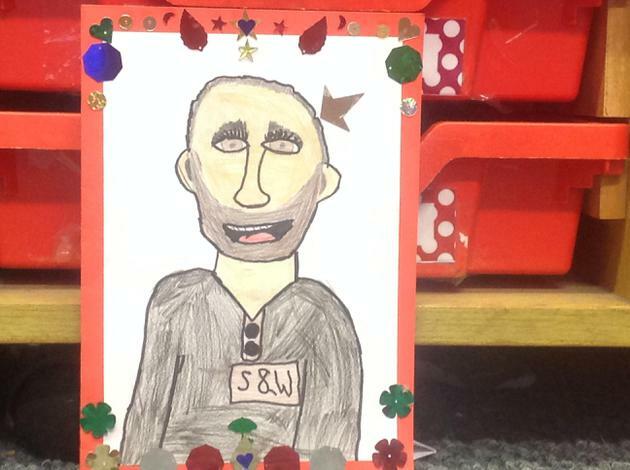 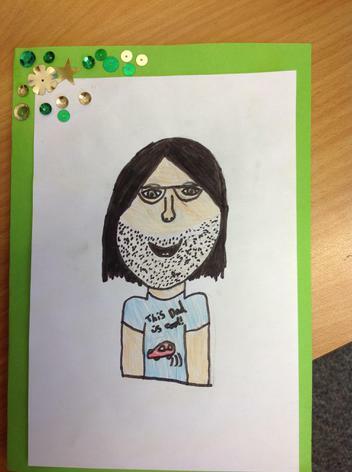 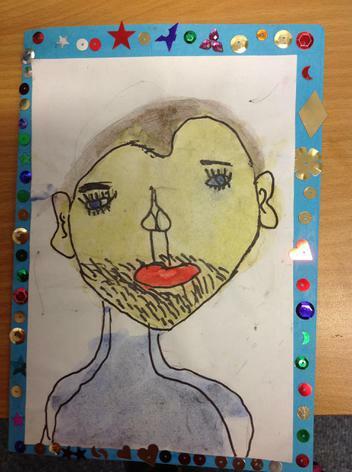 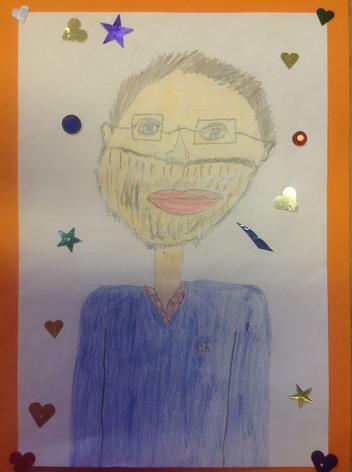 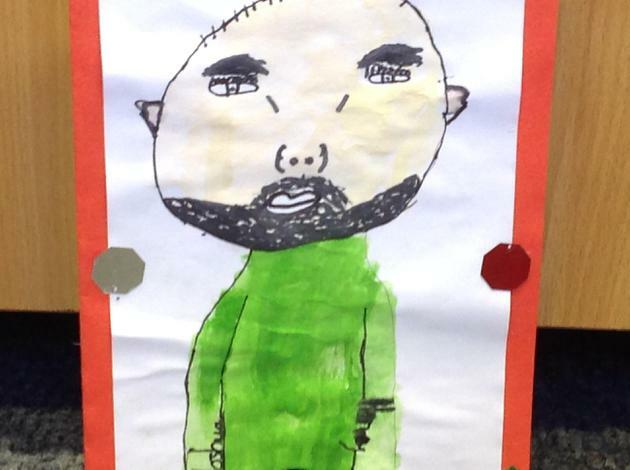 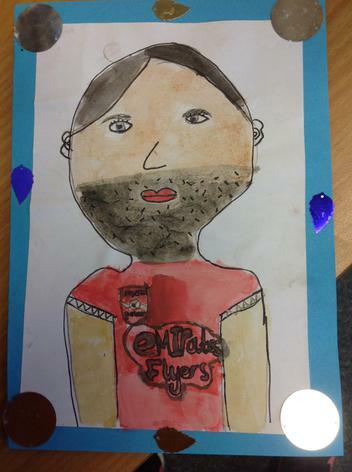 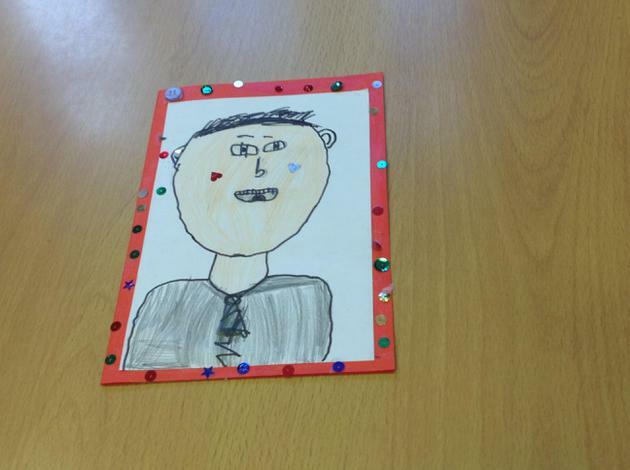 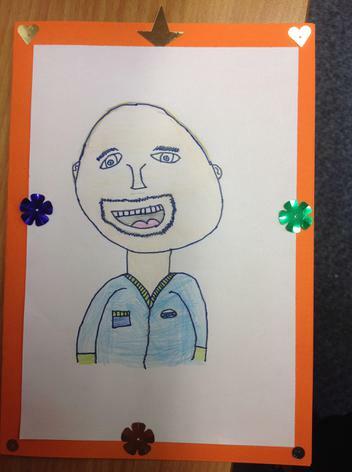 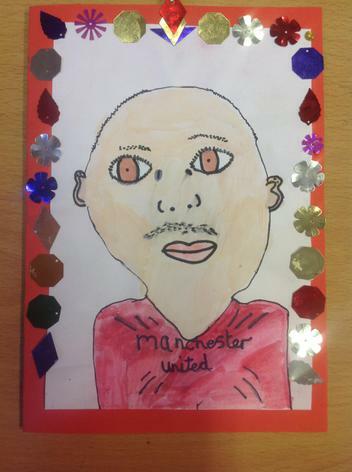 We also found time to create some art work for our Father's day cards. 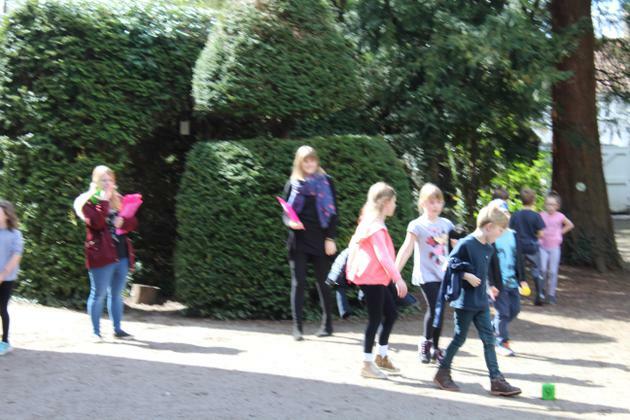 Can you spot anyone you know? 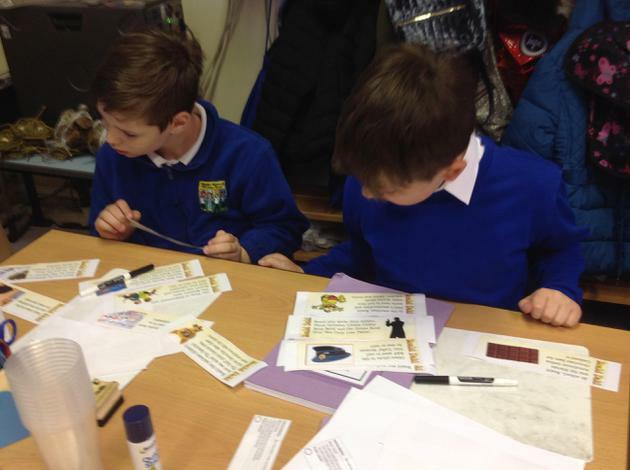 We have now completed our three work homework on Charlie and the chocolate factory. 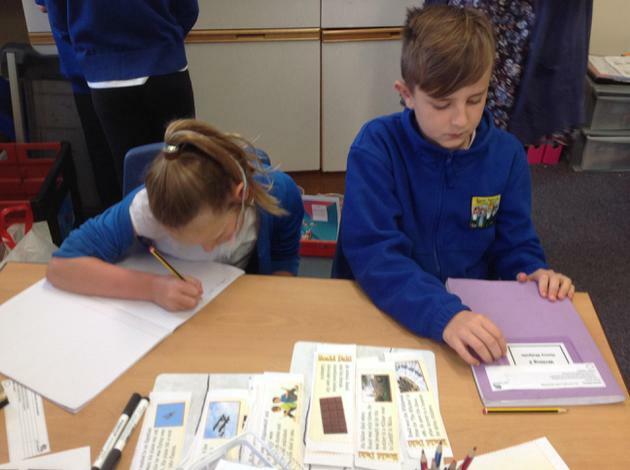 We have created some beautiful pieces of work including written instructions for baking cakes, models of the factory and research on the history of chocolate. 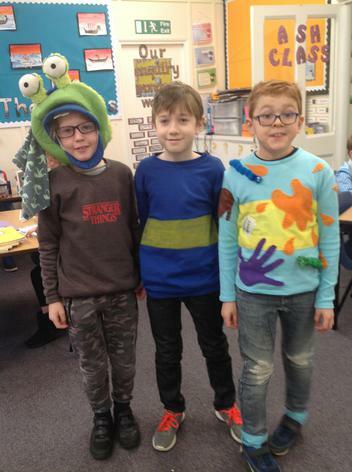 We are certainly ready for our trip to Cadbury's world. 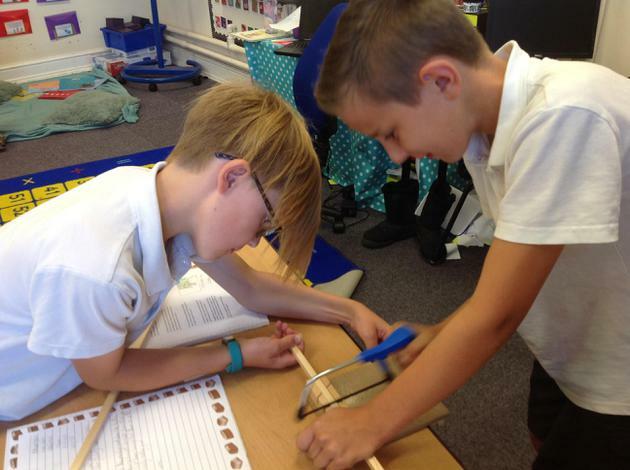 How long was the Aztec period and when did it start? 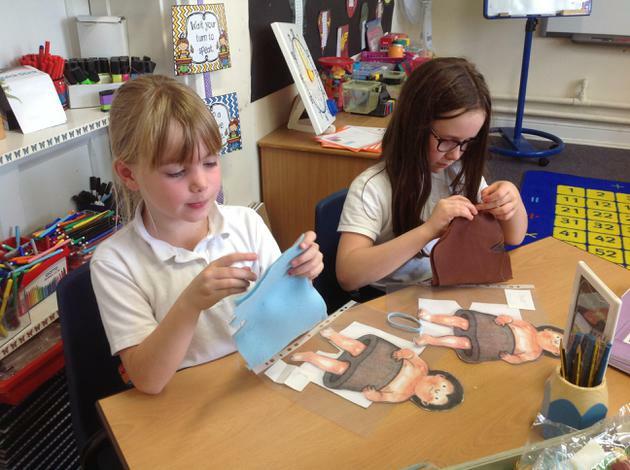 Did they use money and did they trade things like the Stone Age people? 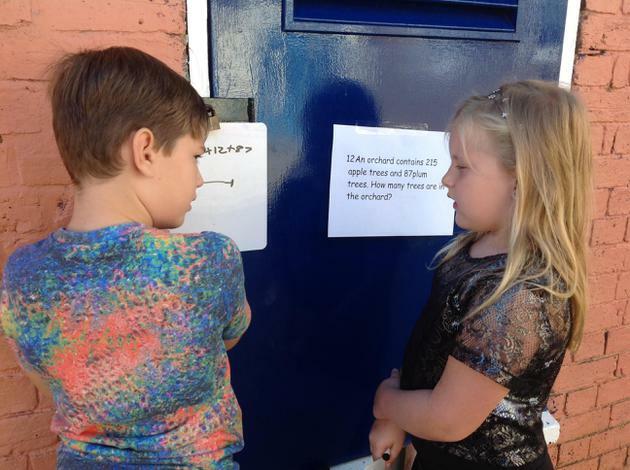 Did they have wooden toilets? 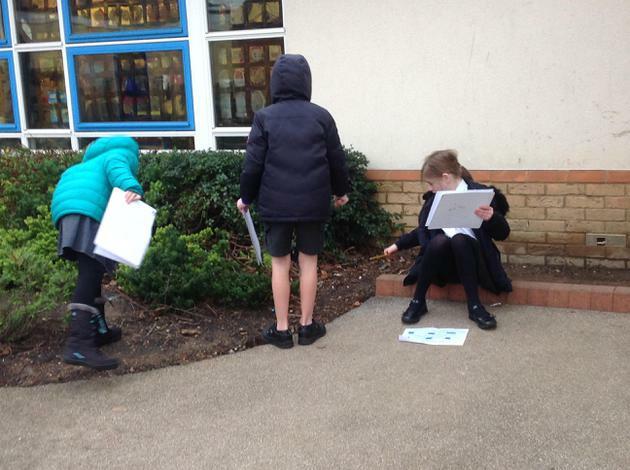 We decided to break off into groups, choosing one area to research each. 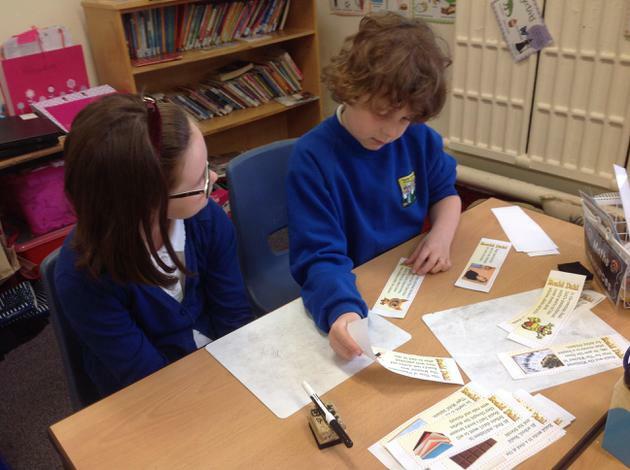 We worked together to present our findings in a poster and cannot wait to present these to the class after half term. 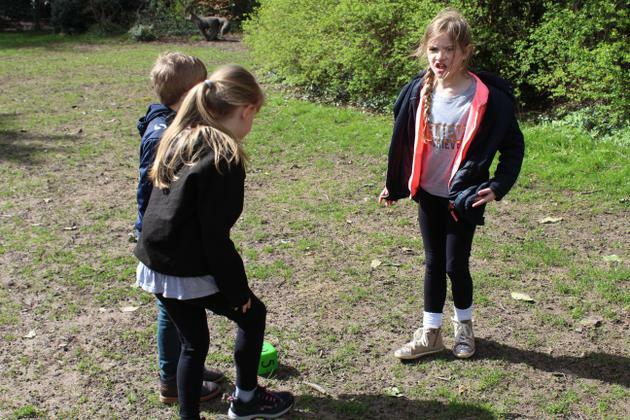 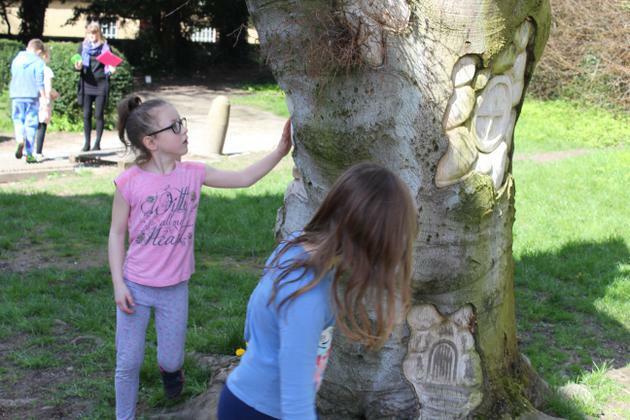 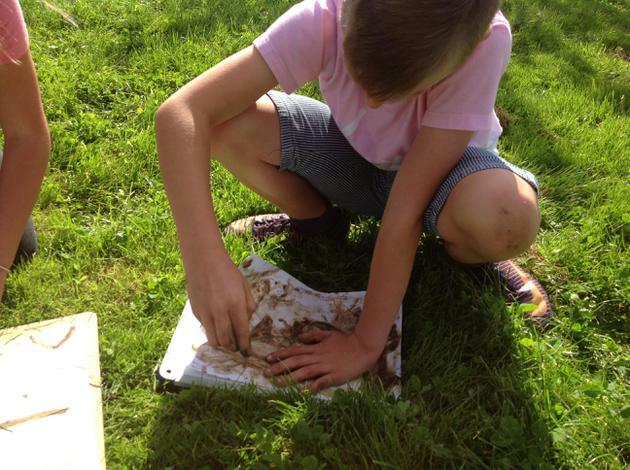 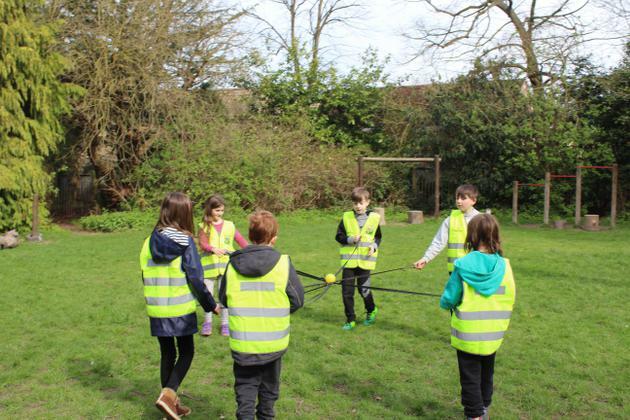 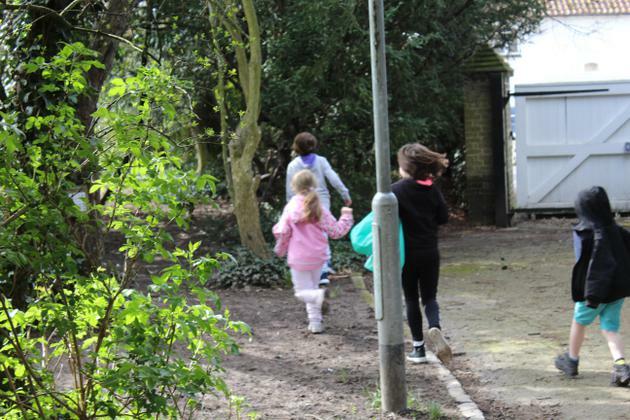 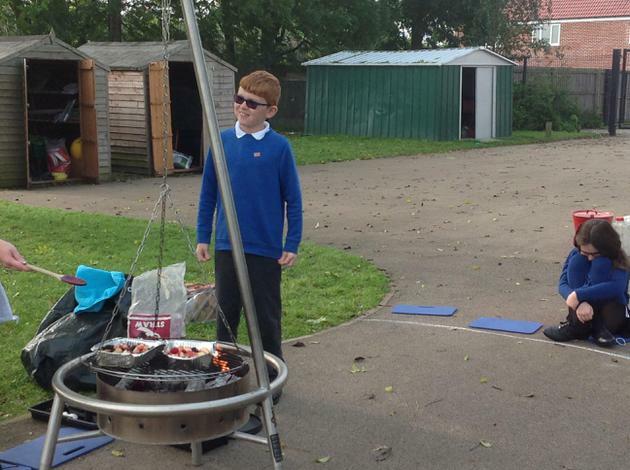 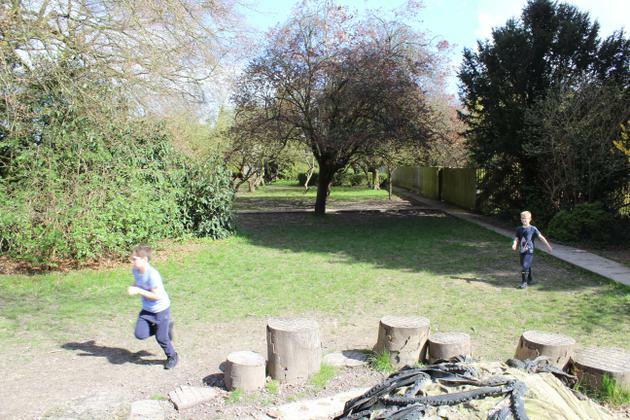 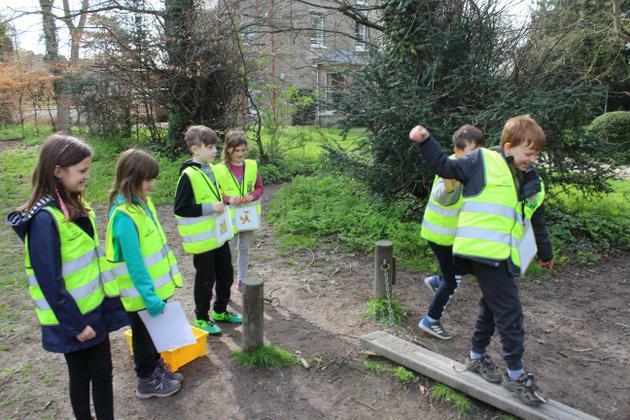 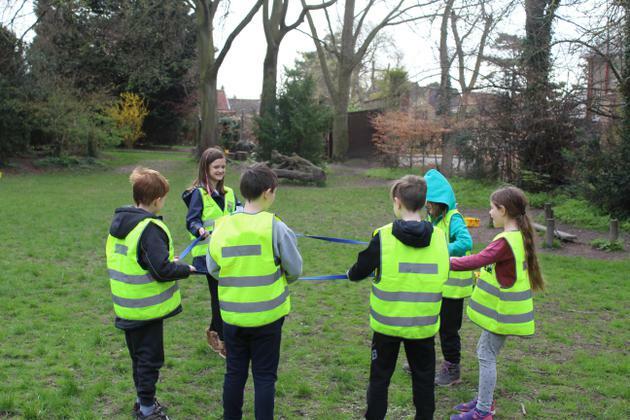 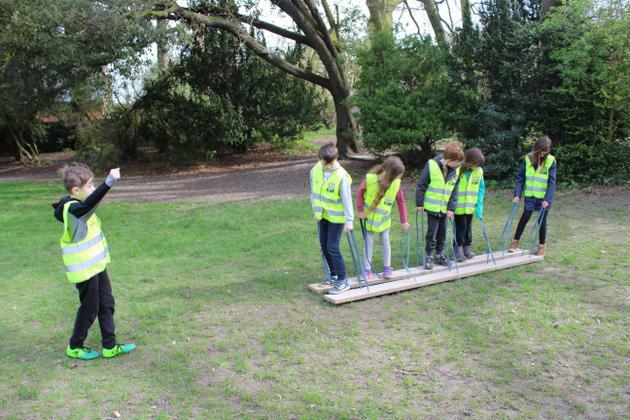 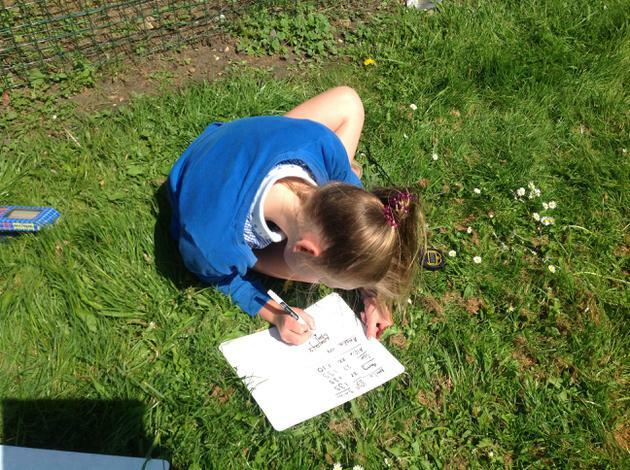 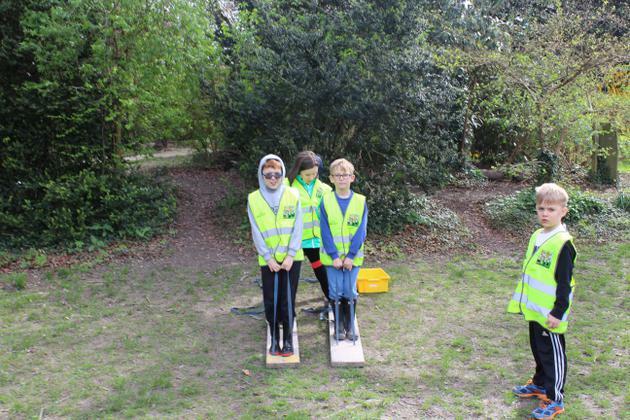 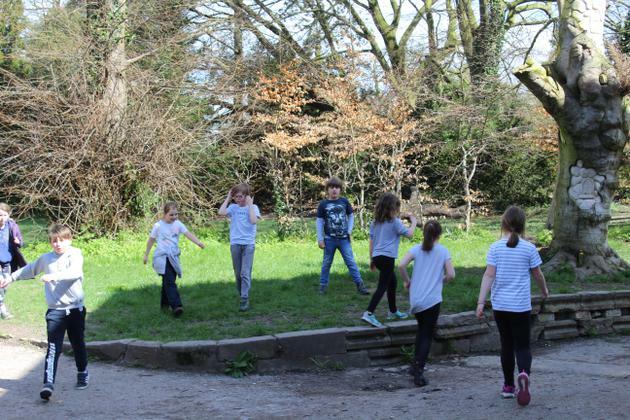 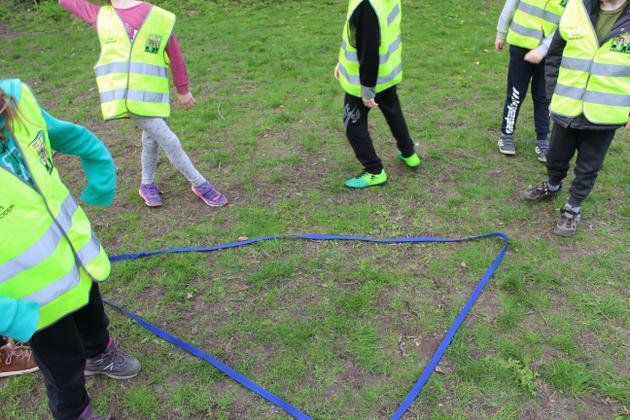 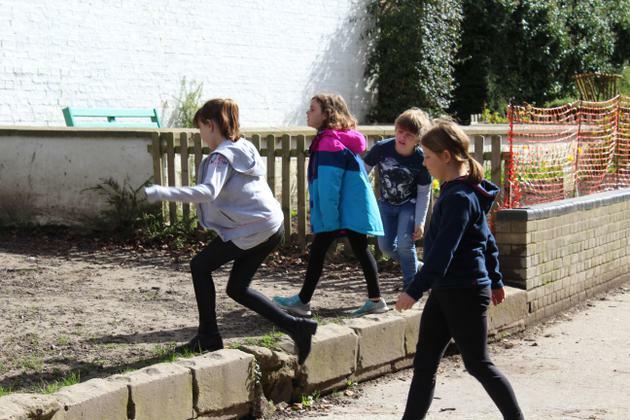 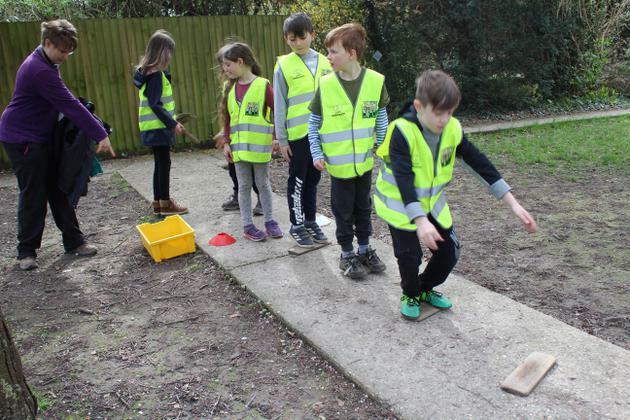 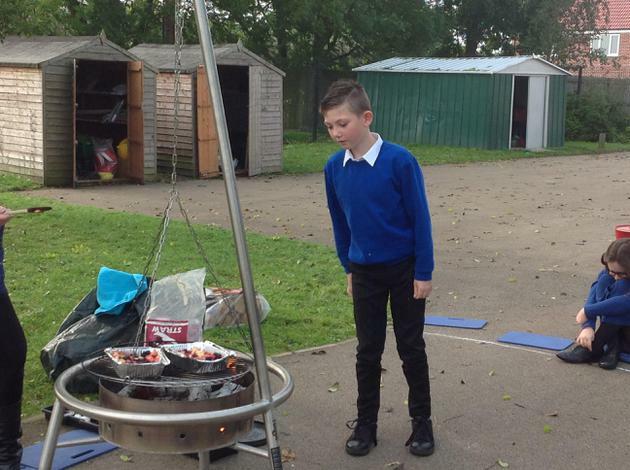 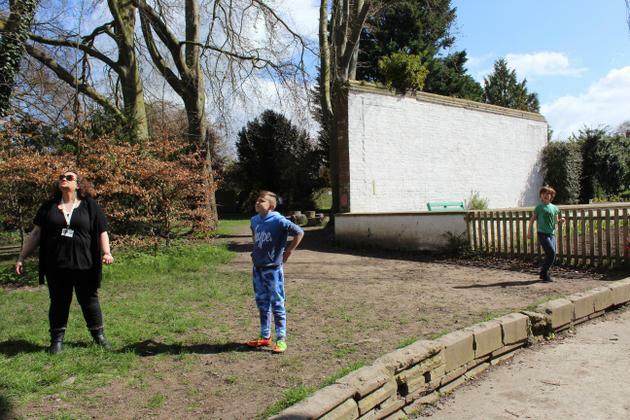 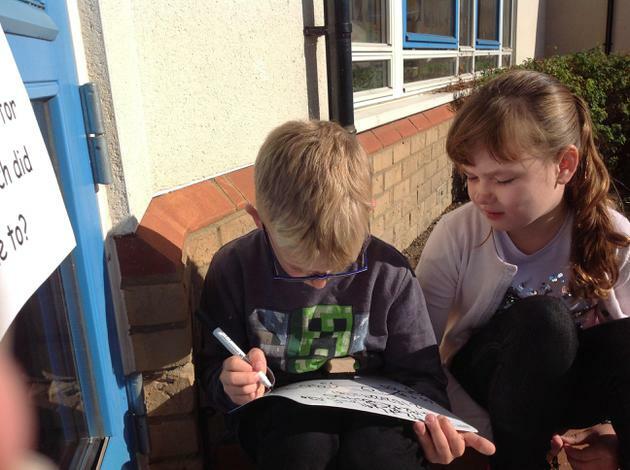 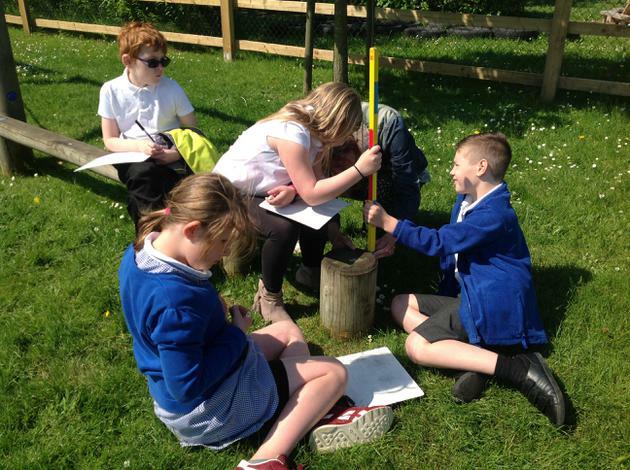 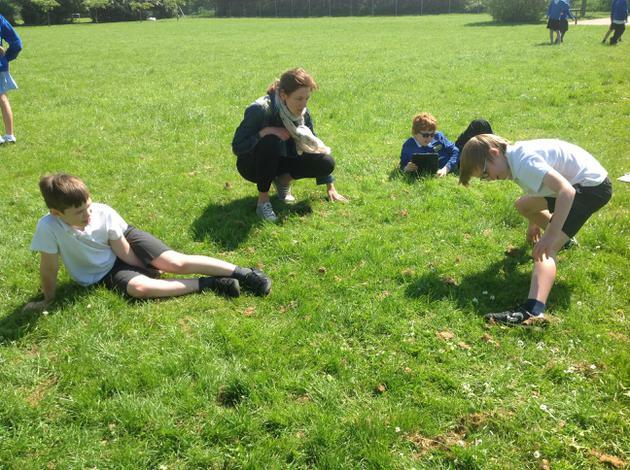 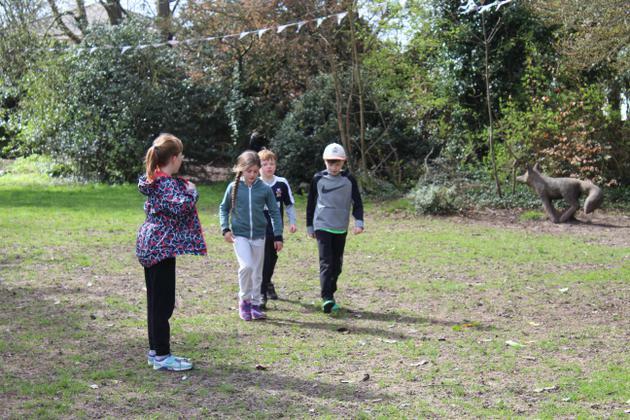 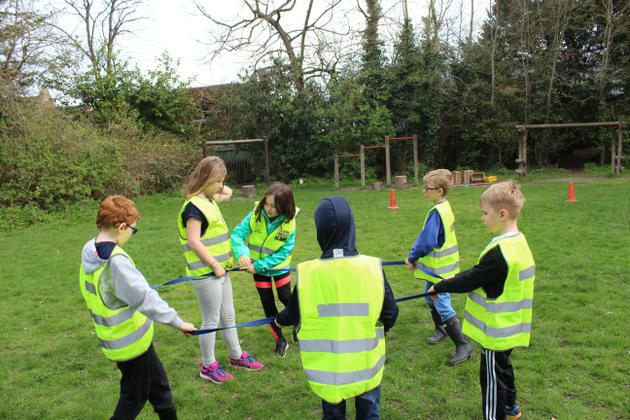 As the year six children have been busy with their SATs tests this week, we decided to make the most of the nice weather and have many of our lessons outdoors. 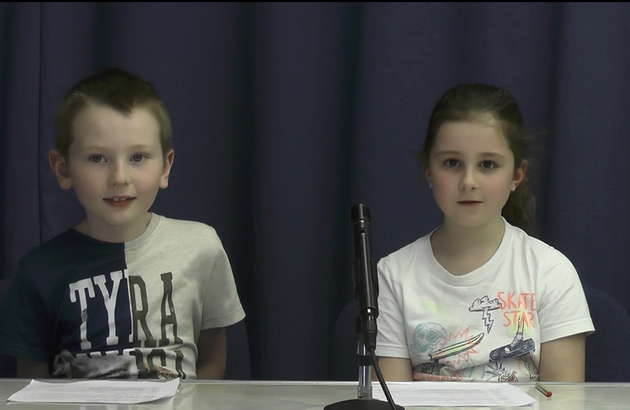 On Monday, we got to use the new timers. 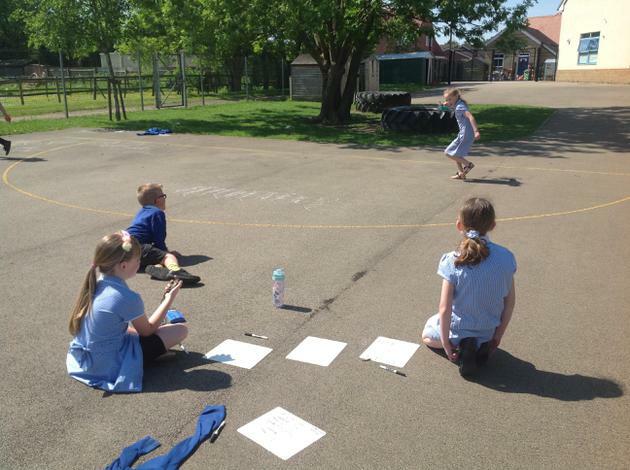 We timed how many star jumps we could do in one minute and then multiplied this by five, using the grid method, to see how many we would have done in five minutes. 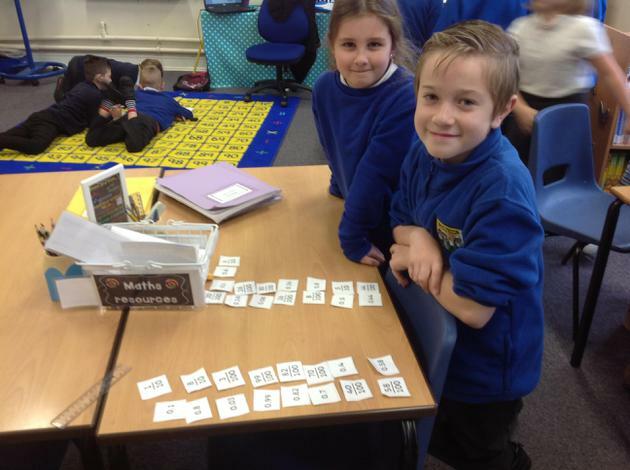 Our final challenge was to multiply it by 60 to find out how many we would do in one hour! 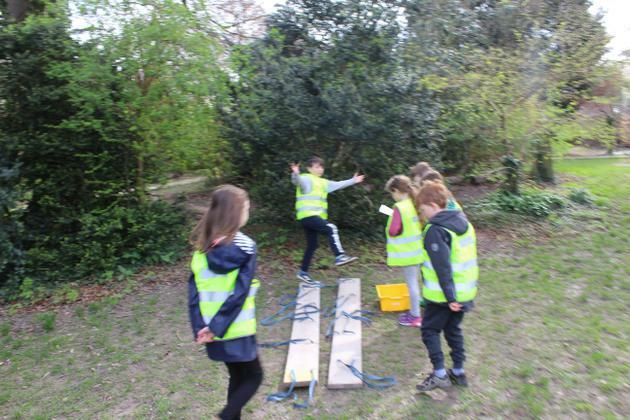 We then tried this with different activities. 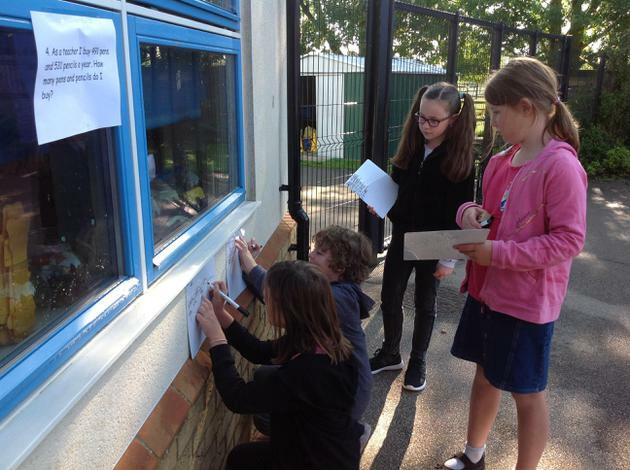 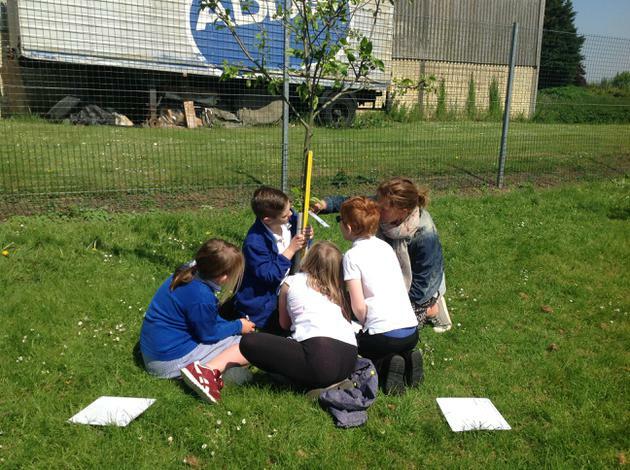 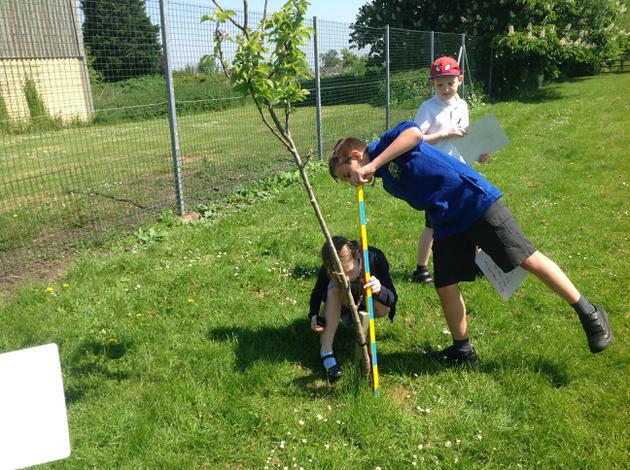 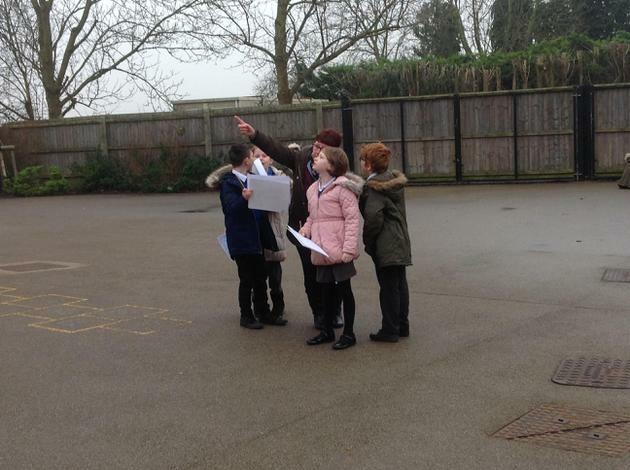 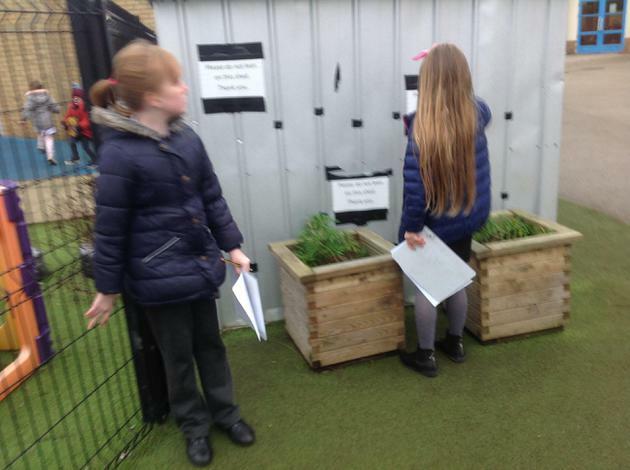 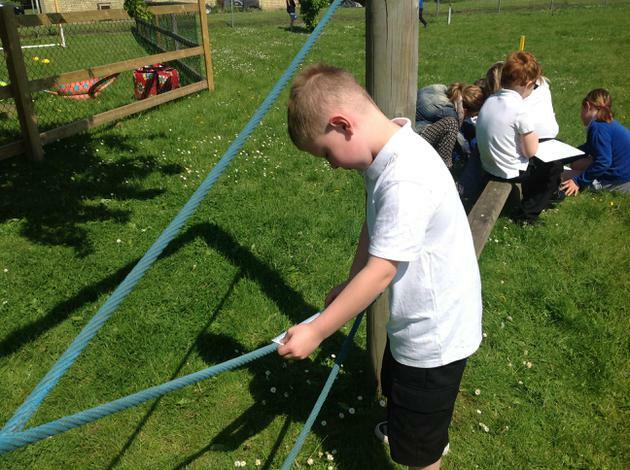 On Tuesday, we were set the challenge to find four objects in the outdoor environment that's length would total 1.75m. 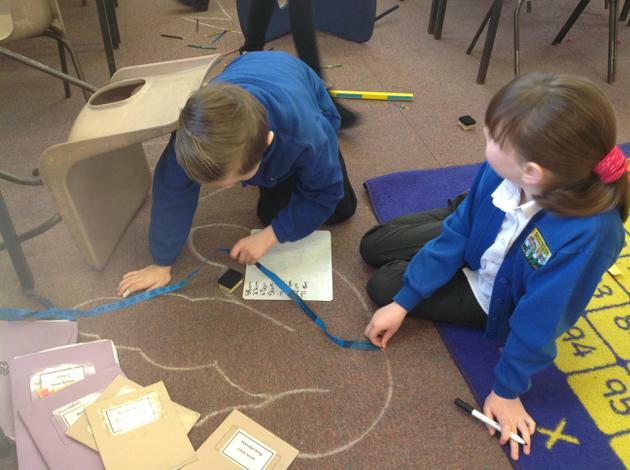 It was quite a challenge because had to measure and use our addition skills! 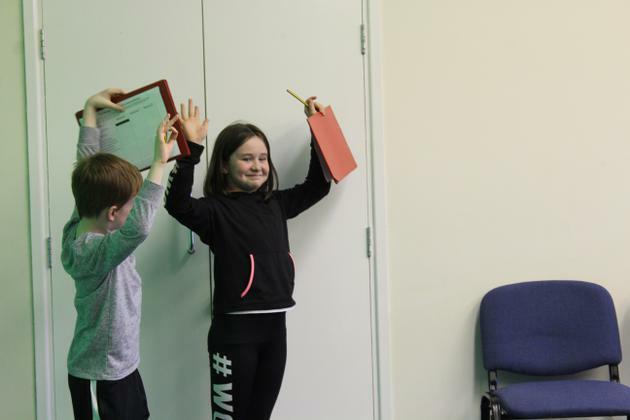 This week, Literacy has focused on play scripts. 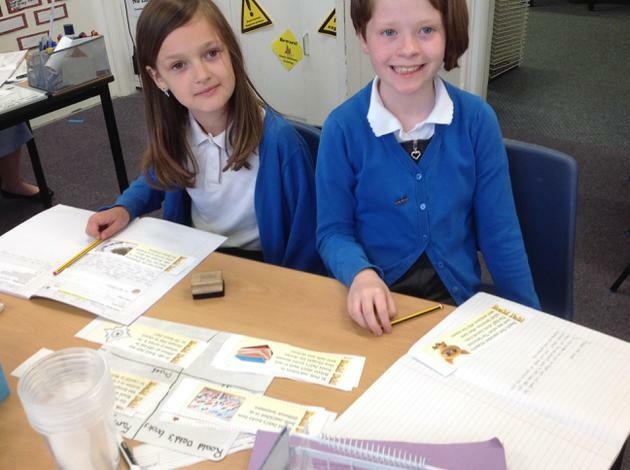 We have practiced reading a range of scripts using expression. 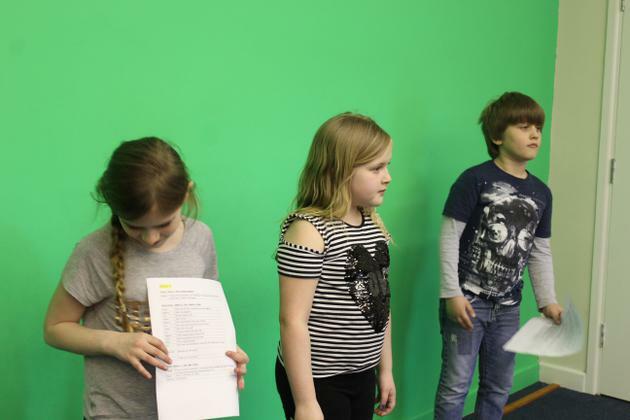 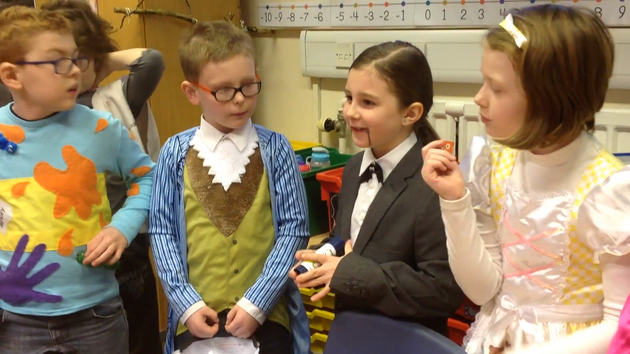 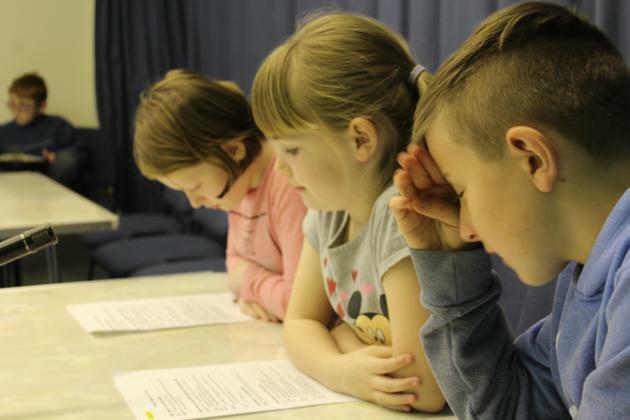 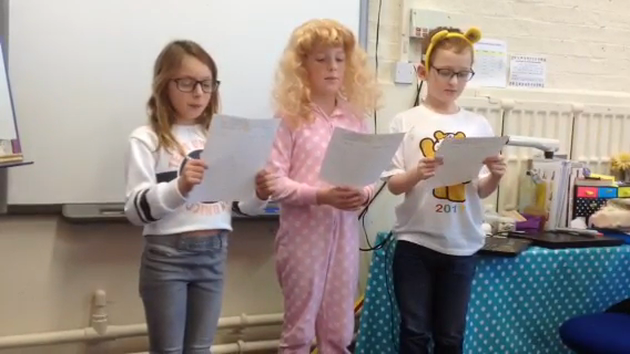 We then focused on a script based around the story 'Charlie and the Chocolate Factory'. 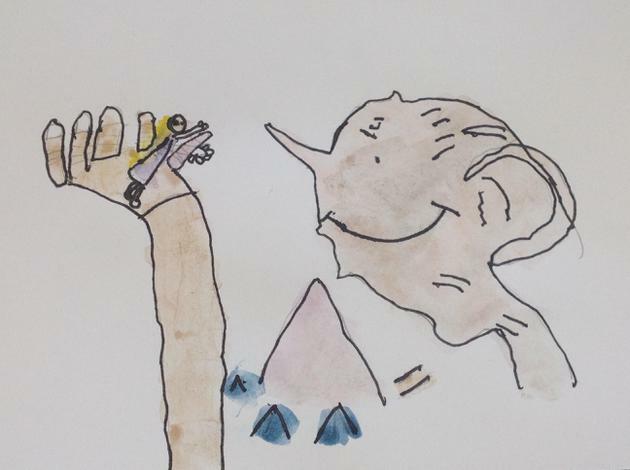 We improvised our own dialogue for the moment that Augustus Gloop fell into the chocolate river. 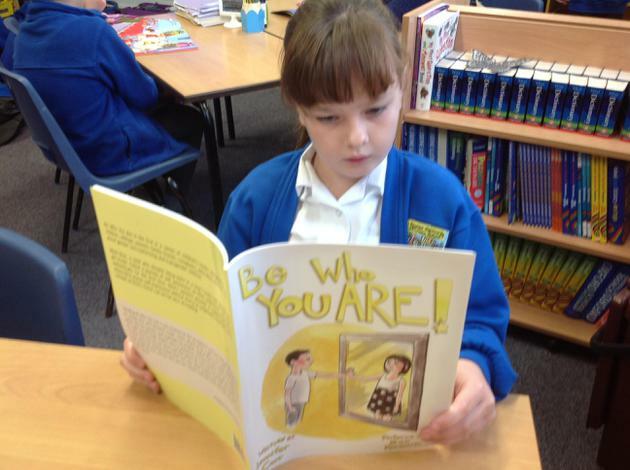 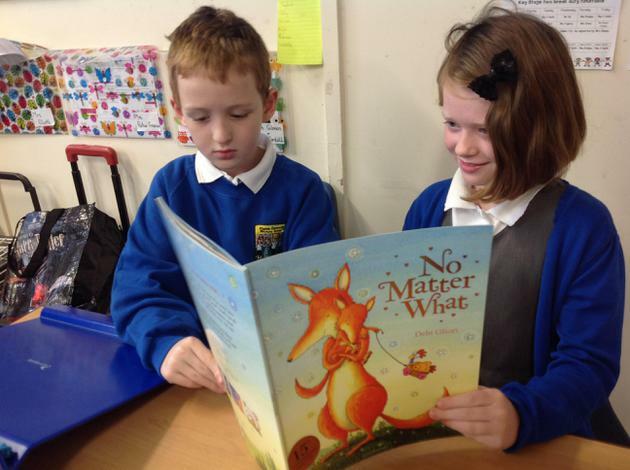 We have started our new Roald Dahl book. 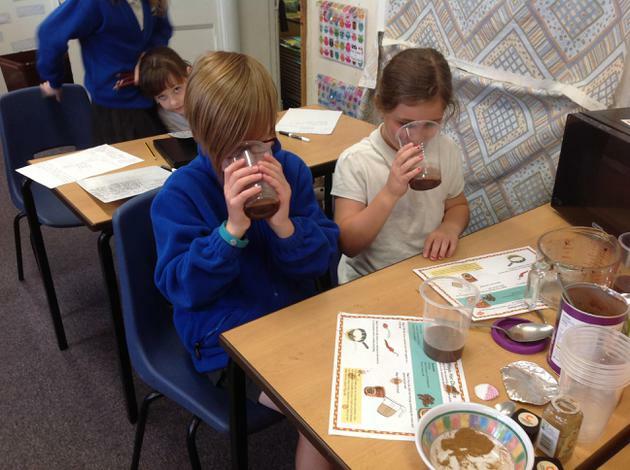 This week, we used it to inspire us to find out about the history of chocolate. 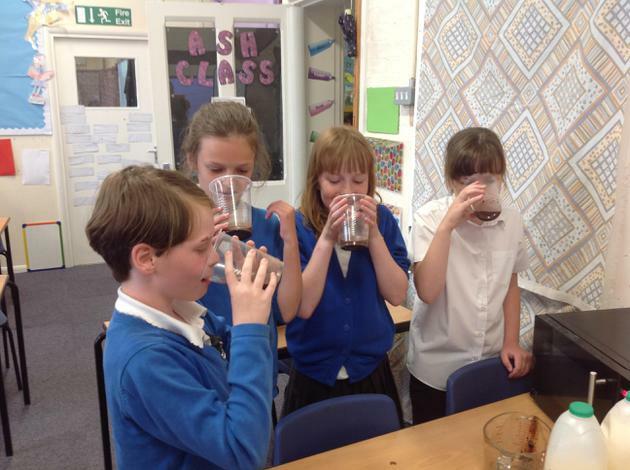 We discovered that the Mayans and Aztecs used chocolate in a spicy drink. 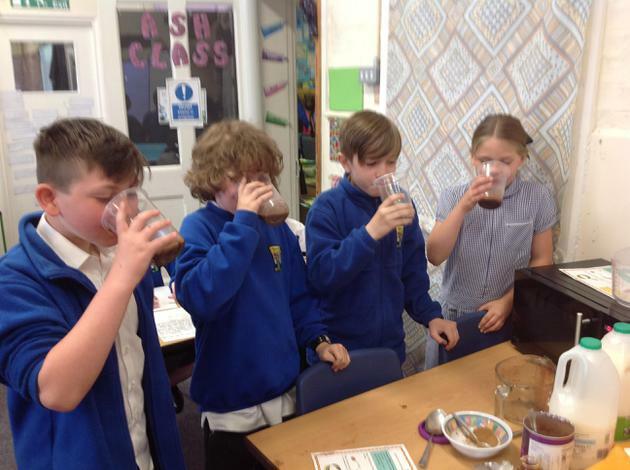 It wouldn't be right if we didn't try it for ourselves, so we combined milk, coco powder, chilli powder and cinnamon. 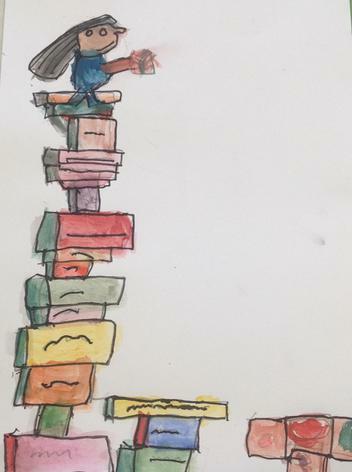 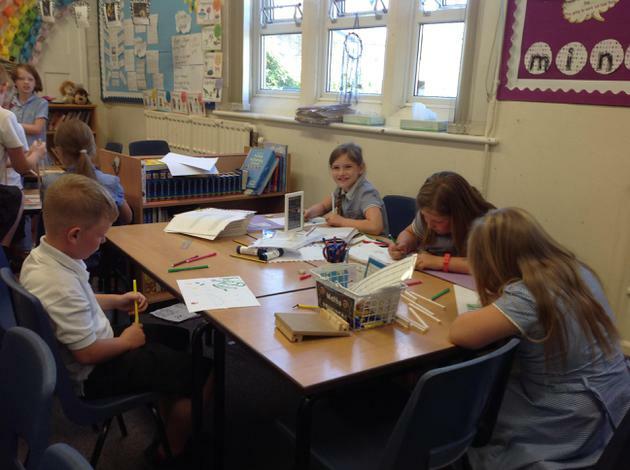 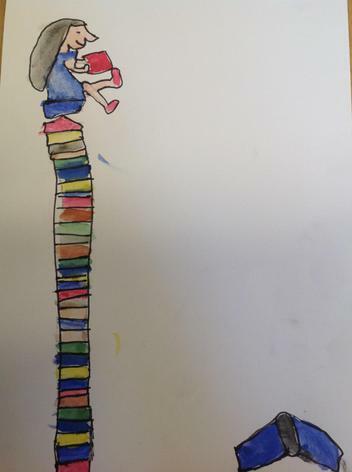 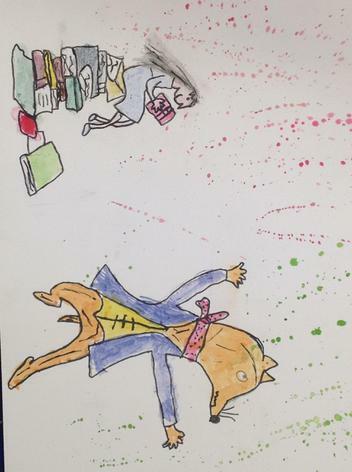 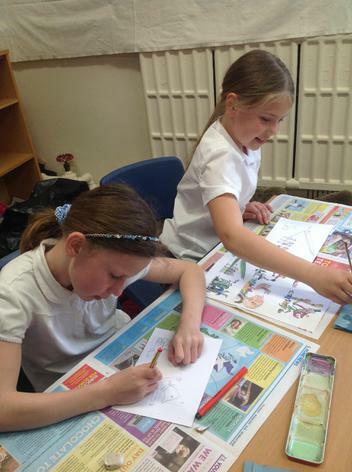 This week, we have completed our Art unit on Quentin Blake, the illustrator of Roald Dahl's books. 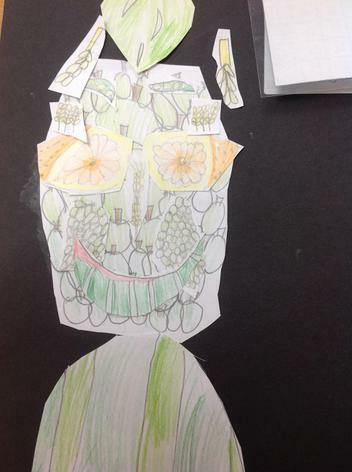 We started by researching his life and his style of art and then created our own sketches. 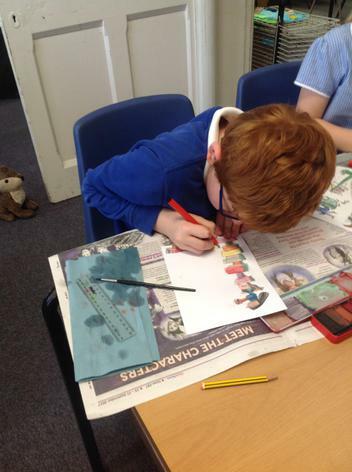 We were lucky enough to have Mrs Boardman join us for our lesson on Thursday afternoon, where we used watercolours and black pens to make our artwork really 'pop'. 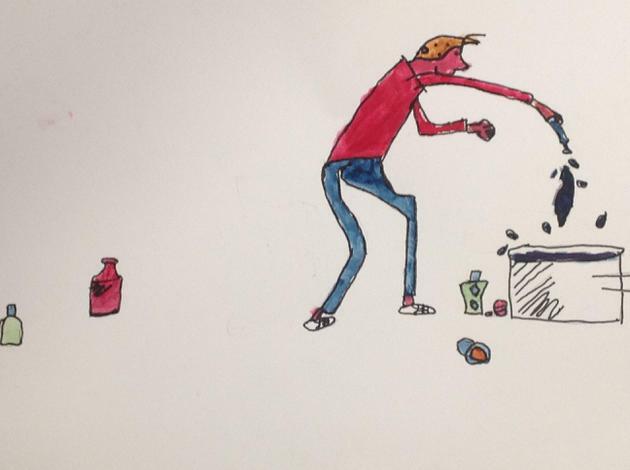 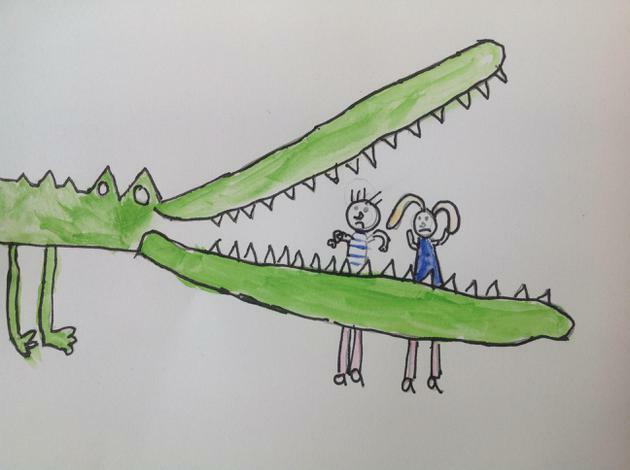 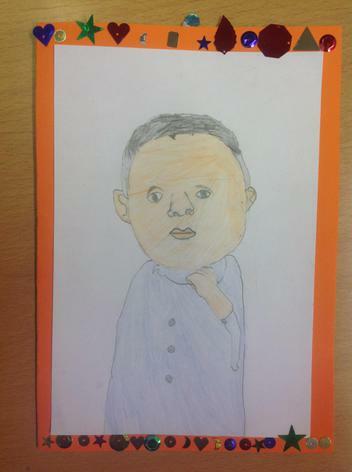 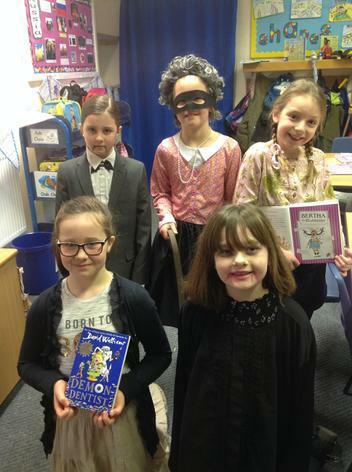 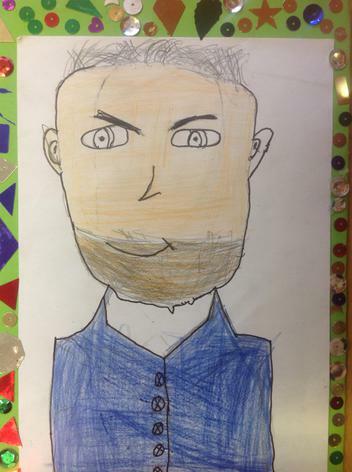 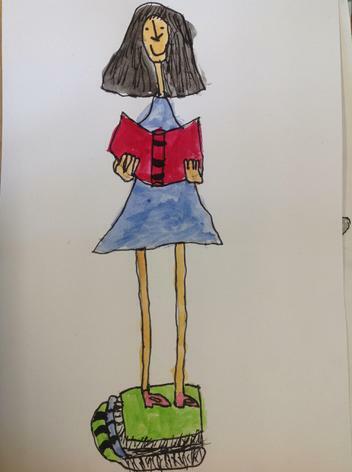 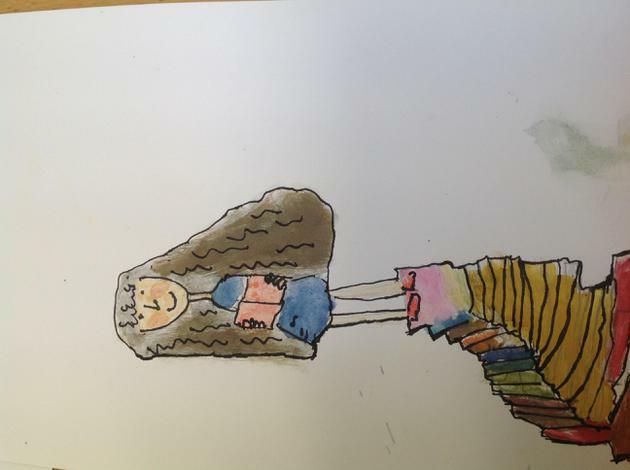 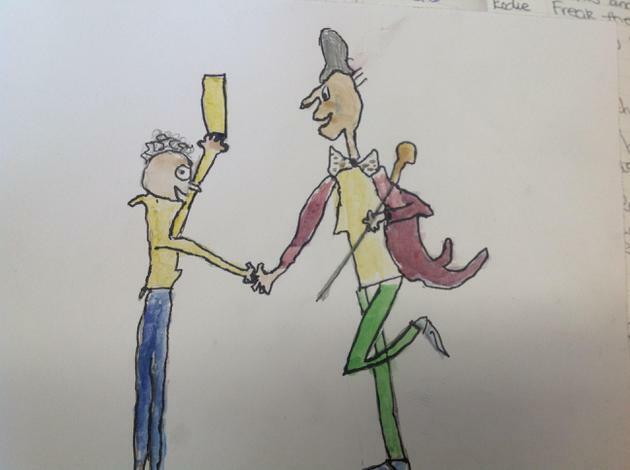 Can you guess which of Roald Dahl's characters we have been drawing? 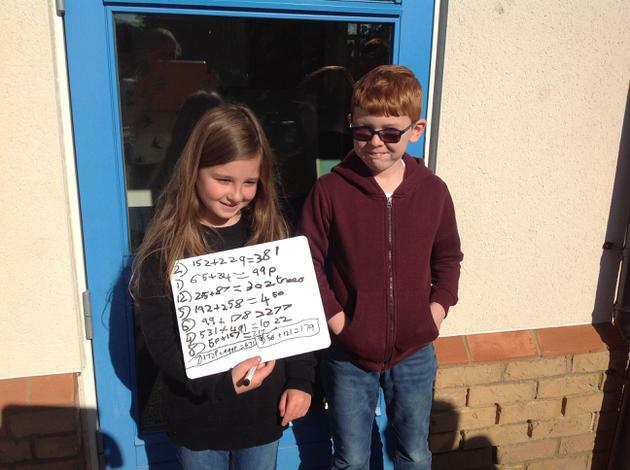 In our Maths lesson, on Friday, we were given a problem to solve! 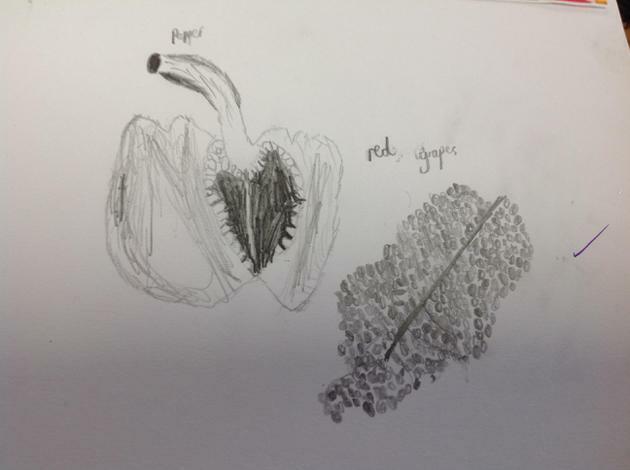 We were introduced to the planet Vuv, where two types of creatures live. 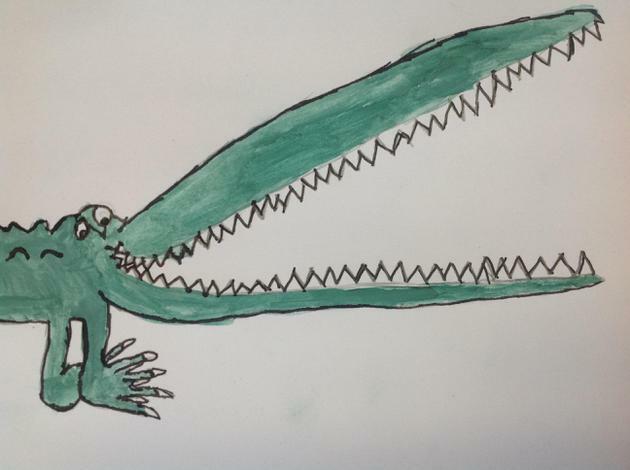 Zios have 3 legs and Zepts have 7 legs. 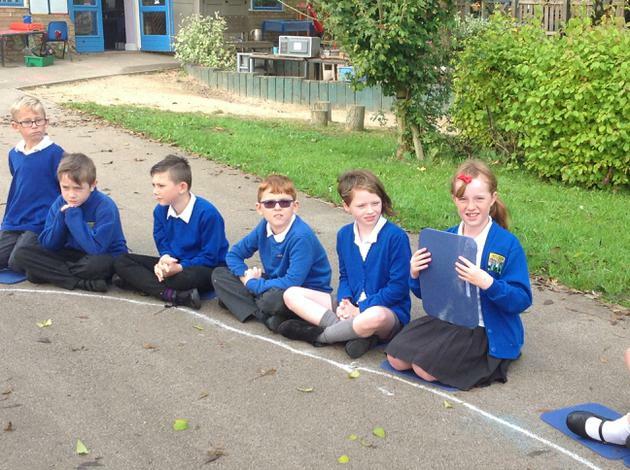 In total, on the planet there were 52 legs. 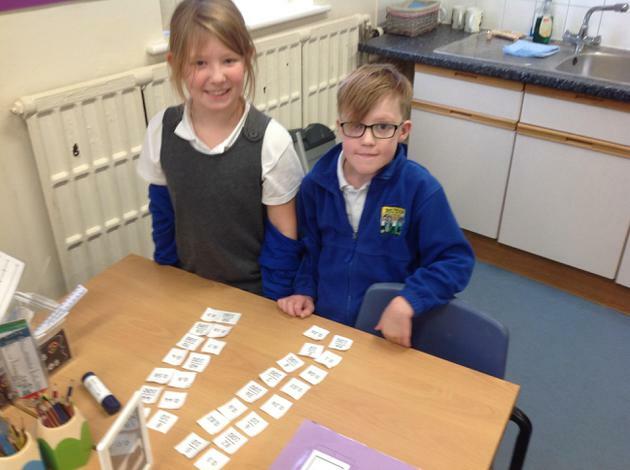 We had to think about how many Zios and how many Zepts there could be- it definitely made our brains tick. 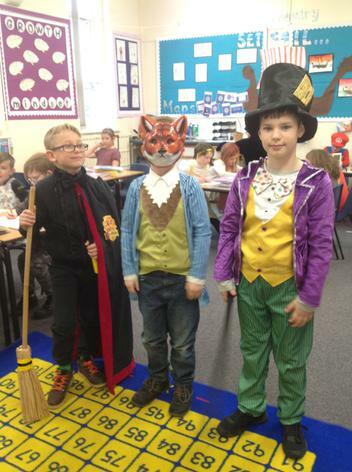 This week has seen us properly start our Roald Dahl unit. 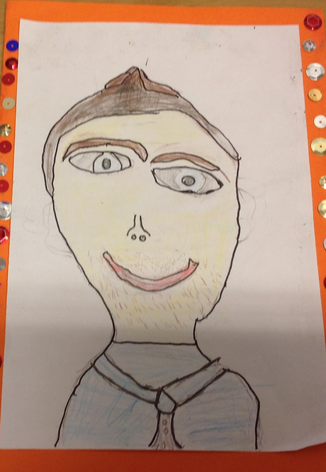 In Literacy, we have started research on the man himself, ready to write an explanation text titled "Who was Roald Dahl?". 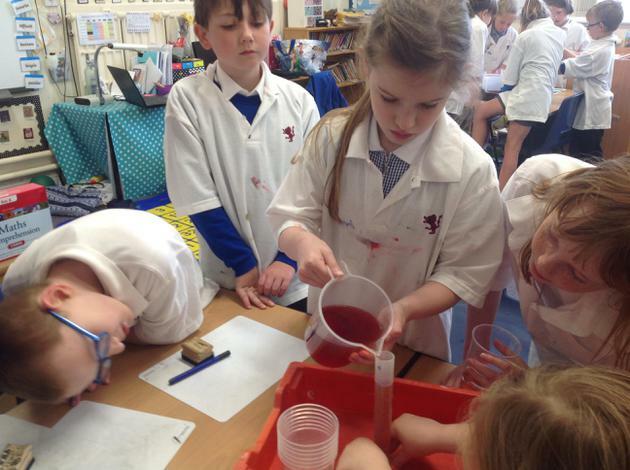 In Maths, we have been thinking about how to measure our medicine. 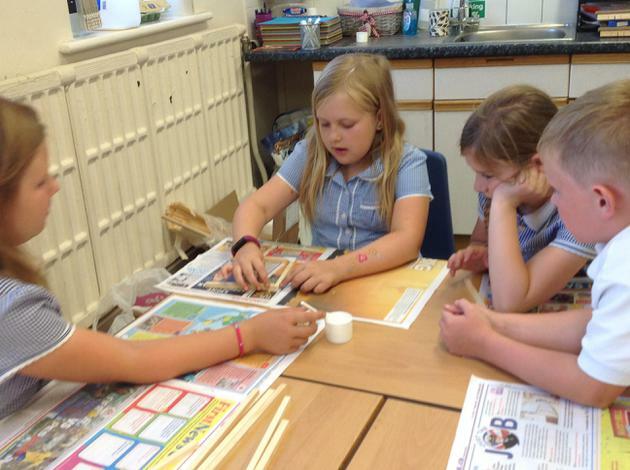 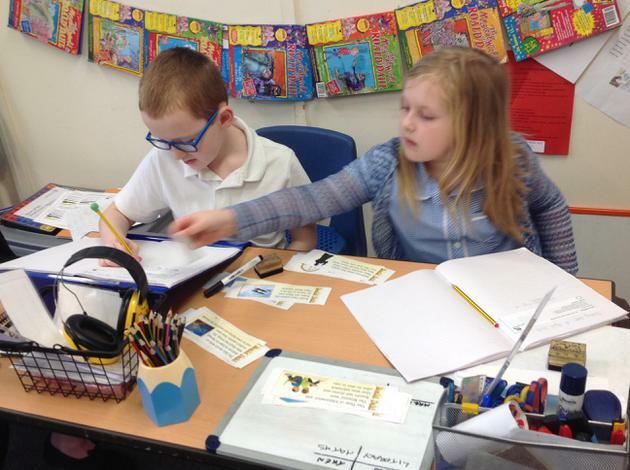 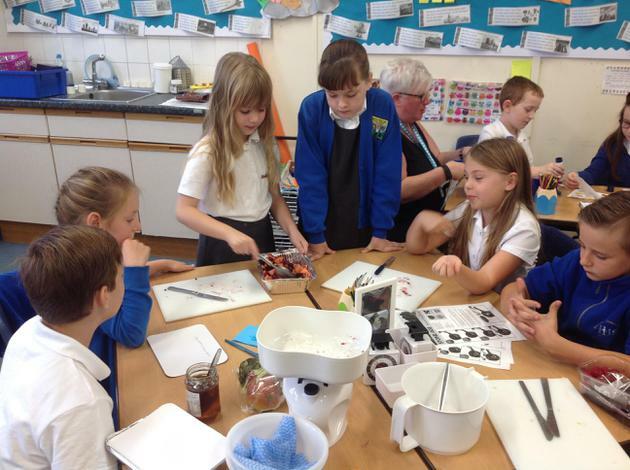 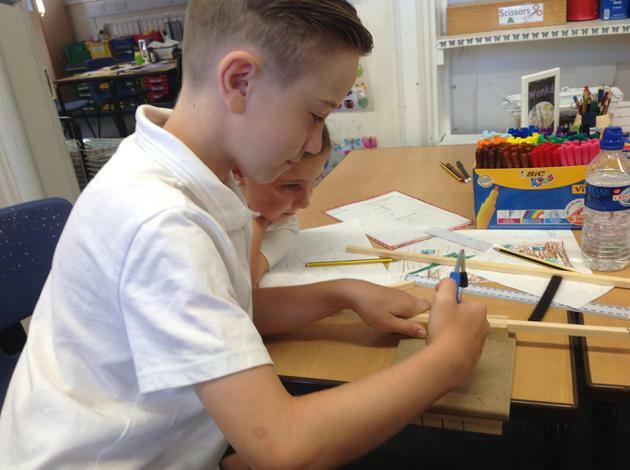 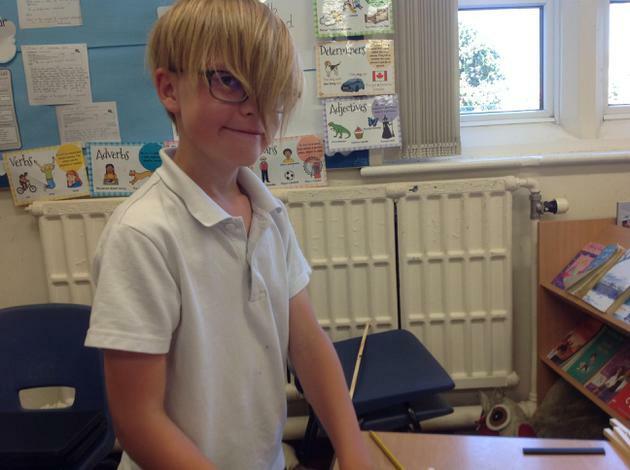 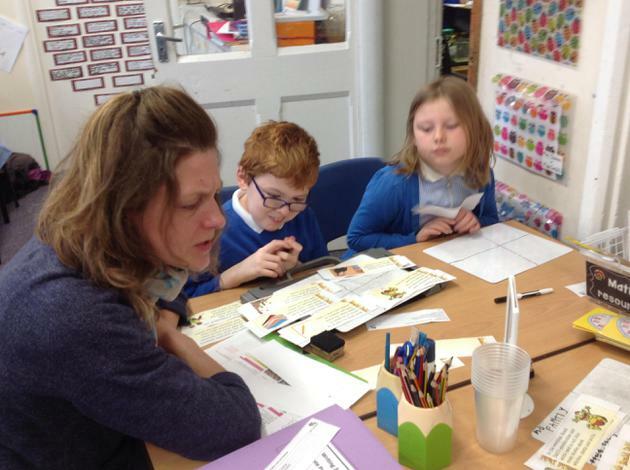 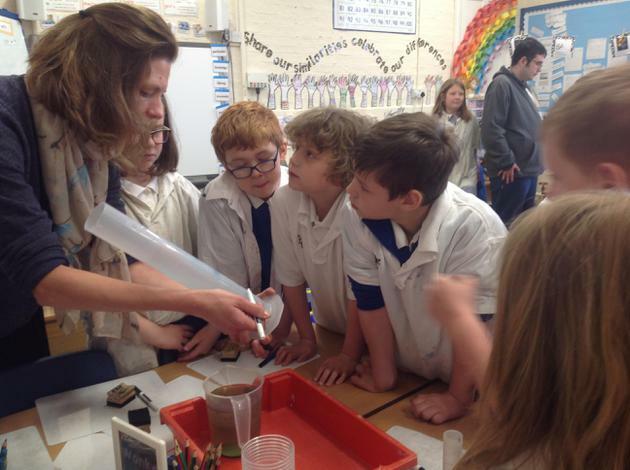 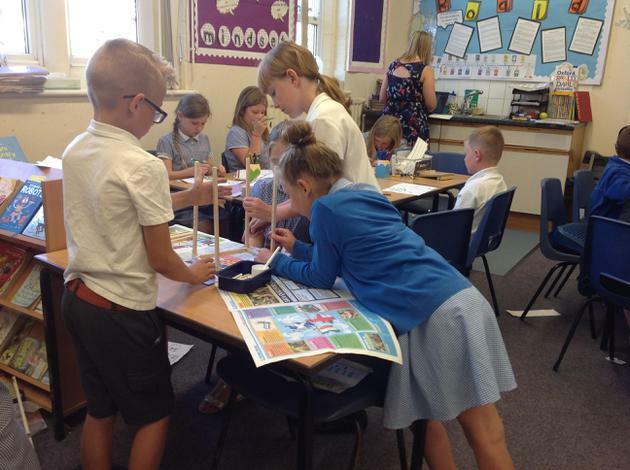 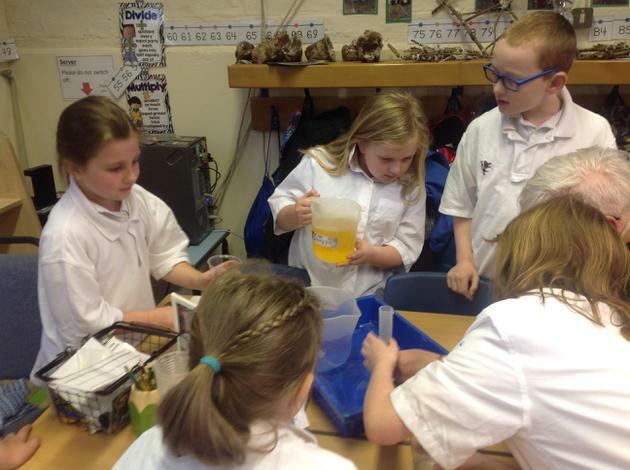 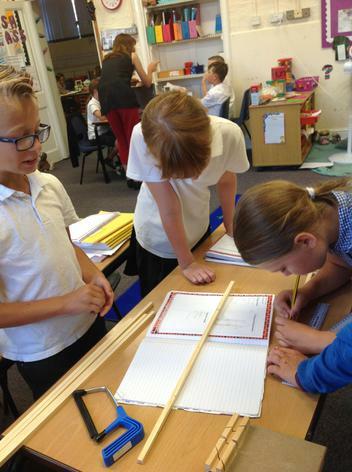 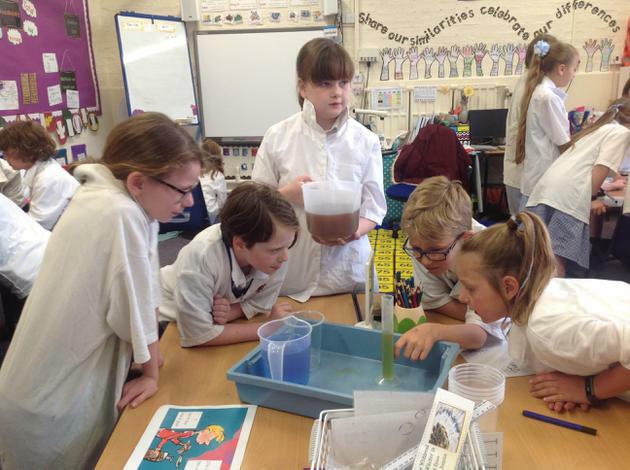 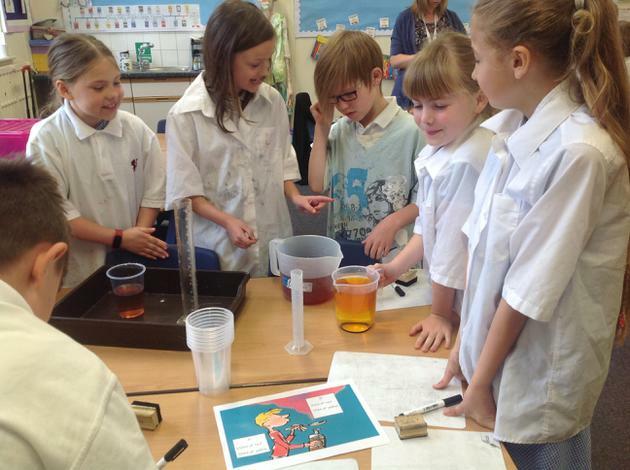 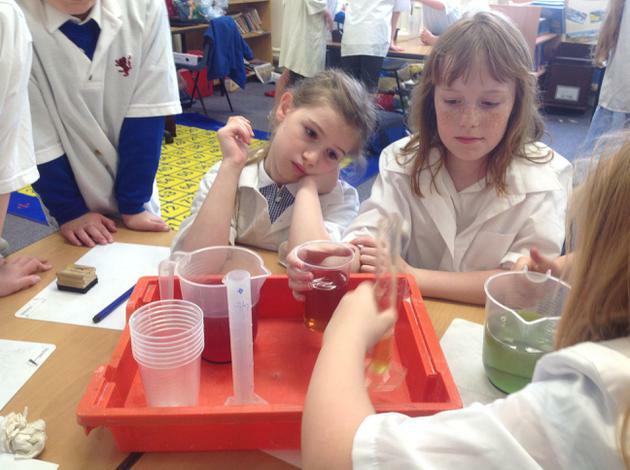 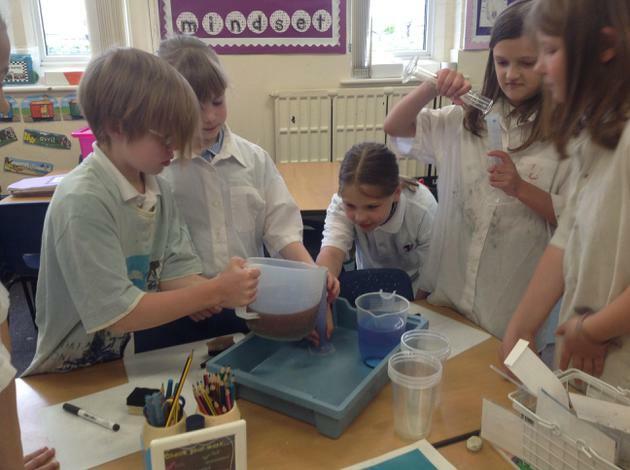 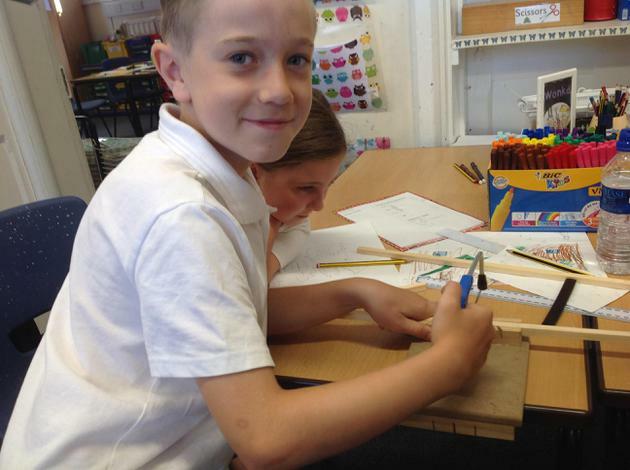 On Tuesday, we learnt how to read scales on measuring cylinders by combing amounts of two coloured mixtures. 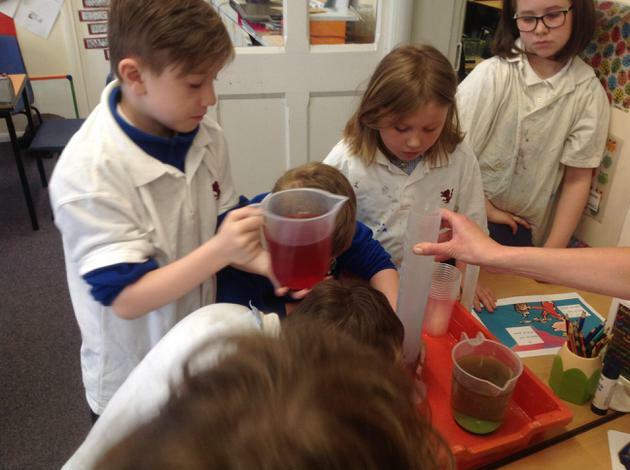 We had to add the two amounts together- and recorded what colour the mixture turned. 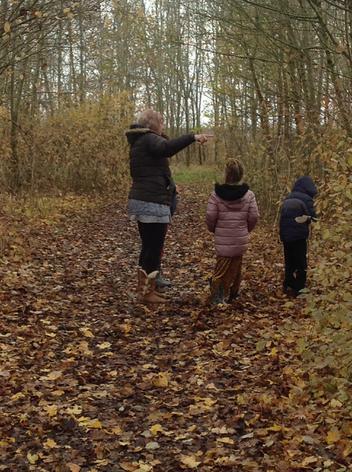 It was so much fun that we didn't even want to stop for playtime. 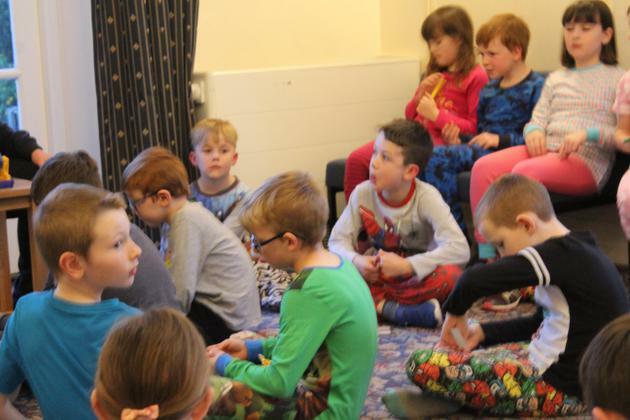 The Summer term started with a buzz of excitement as most of us packed our bags and headed off on our very first residential. 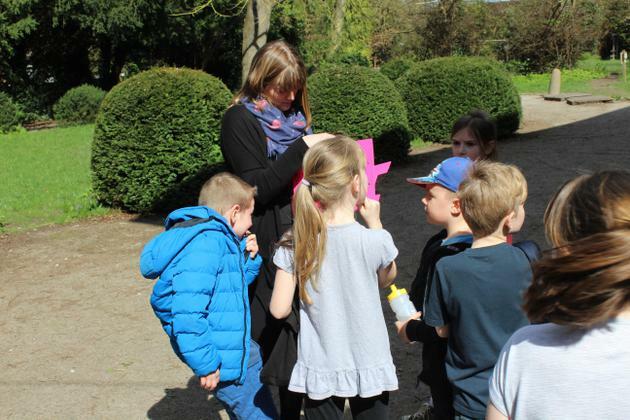 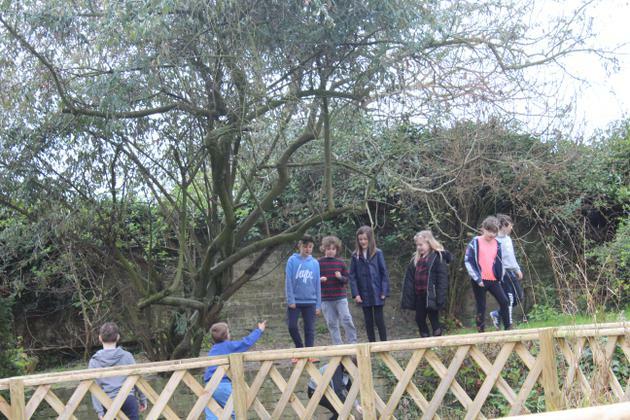 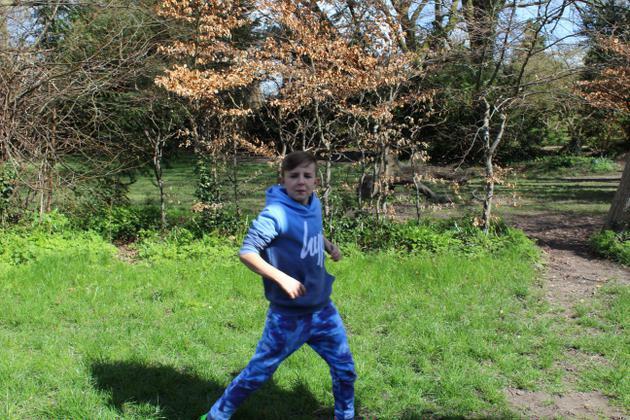 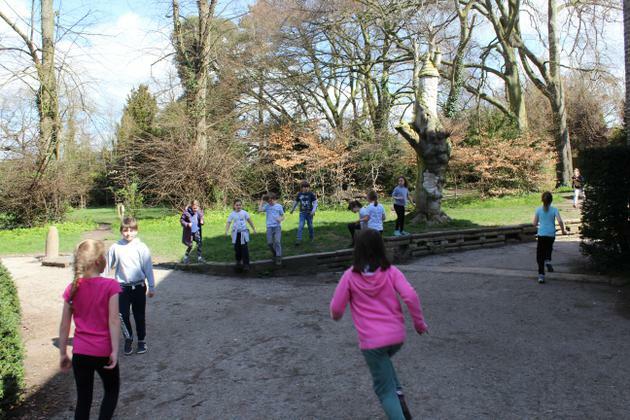 Before we knew it, we had arrived at Burwell House and started things off by playing a game to get to know the grounds. 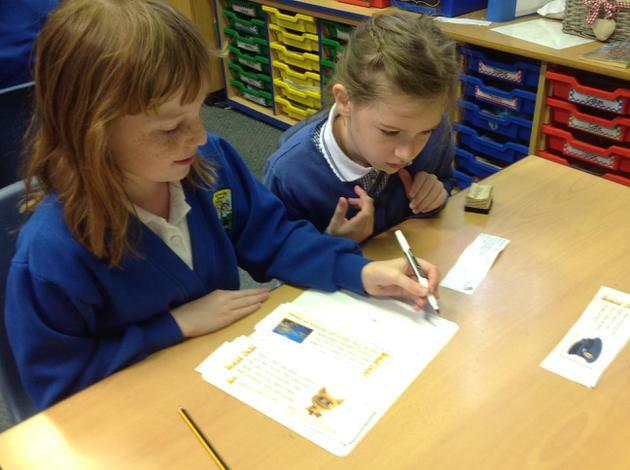 We really enjoyed finding clues and answering lots of questions. 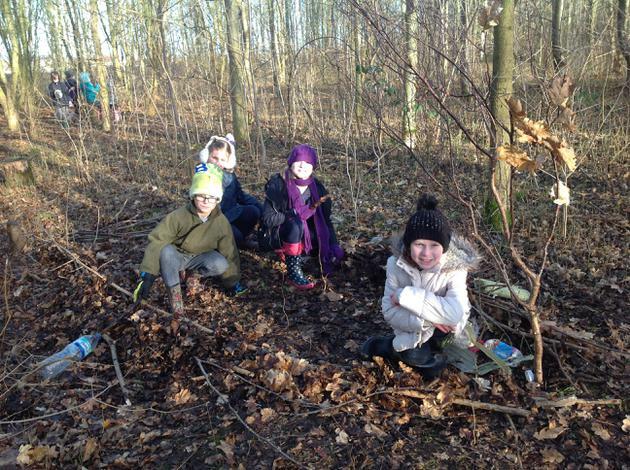 During the two days, we participated in three main activities. 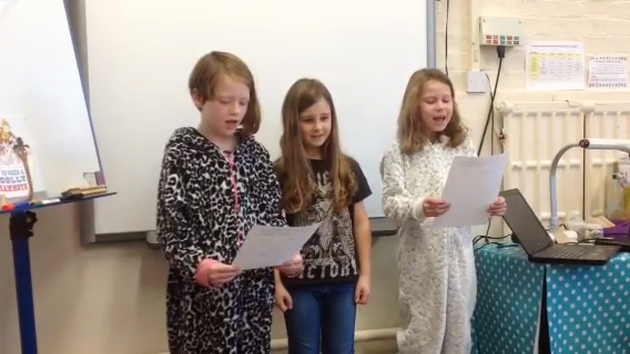 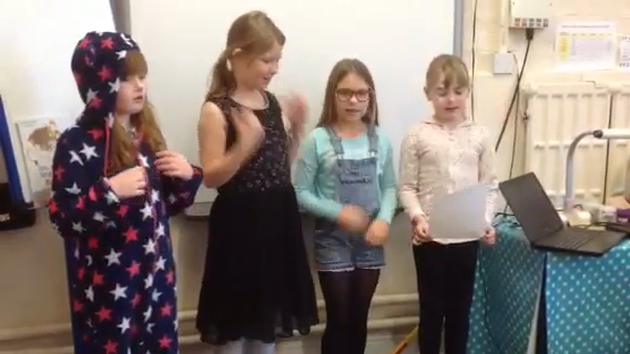 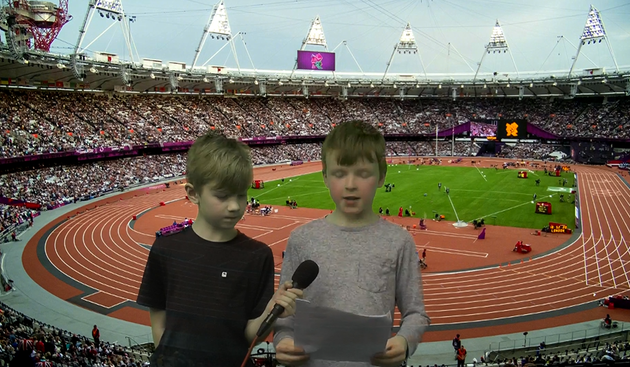 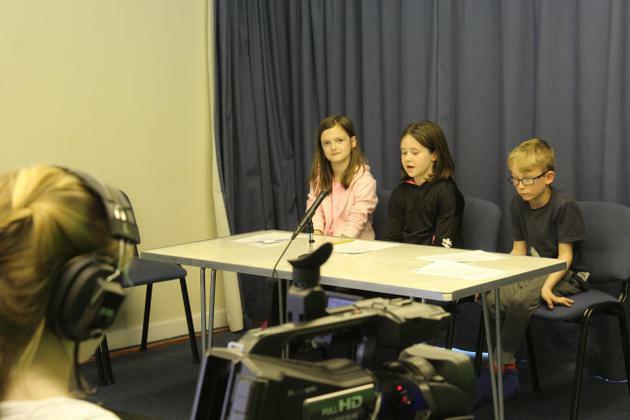 This included presenting our own news reports and learning how to film them too. 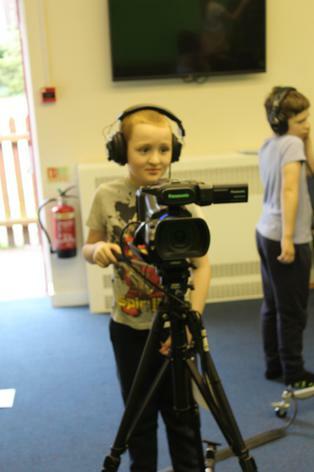 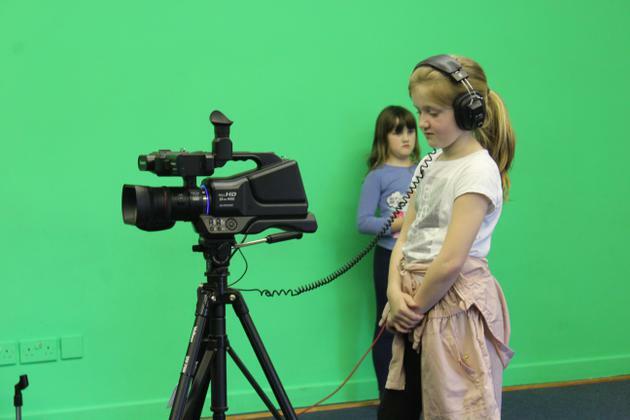 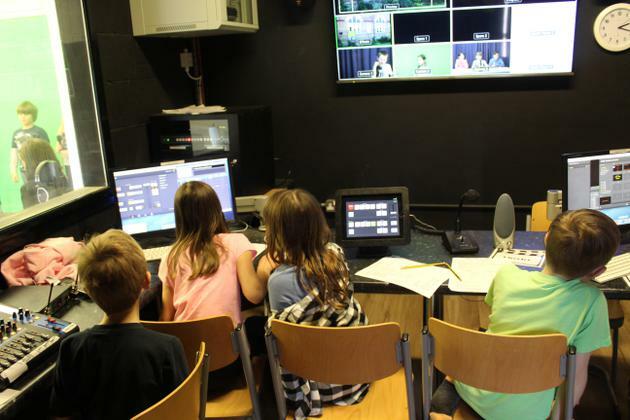 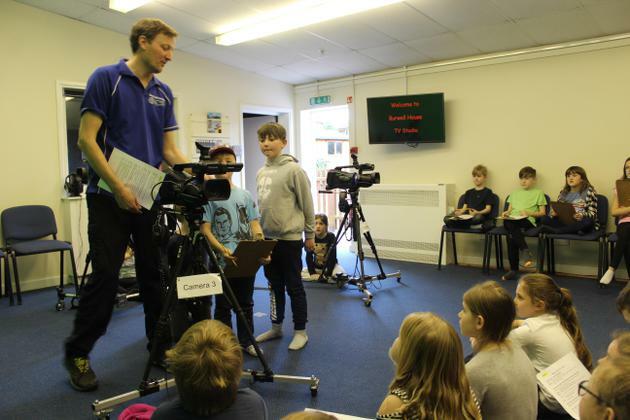 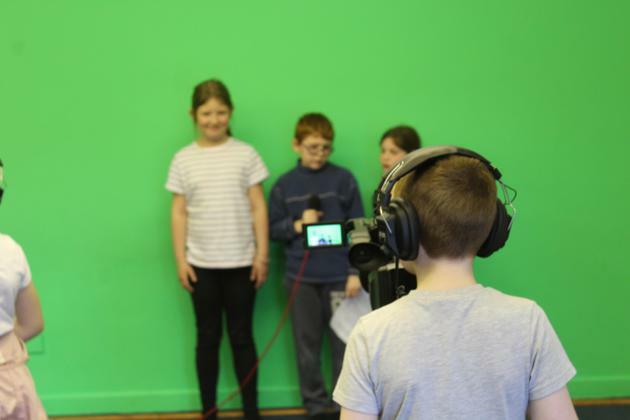 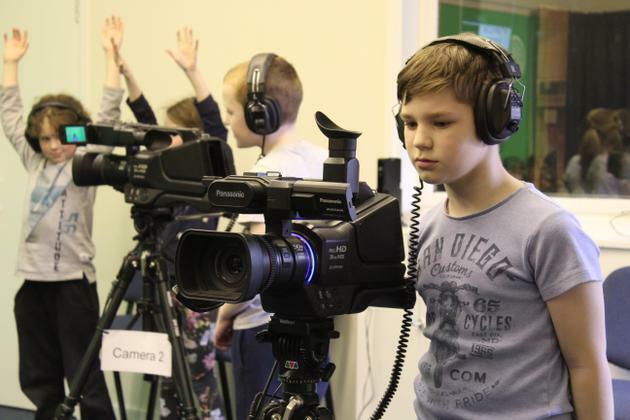 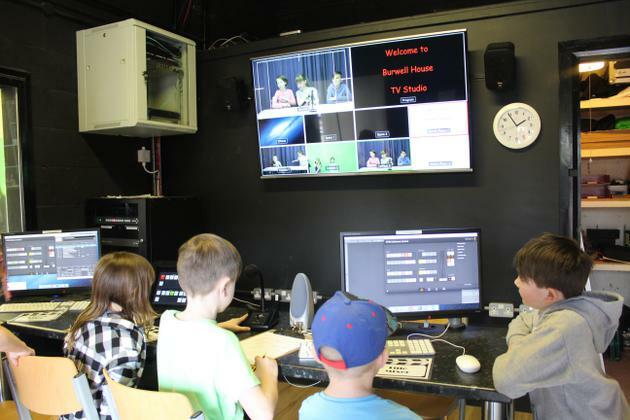 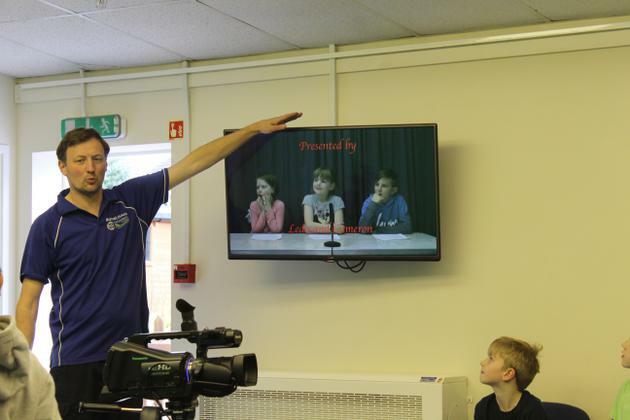 We learnt how to operate cameras and equipment and each took on a different role in the studio. 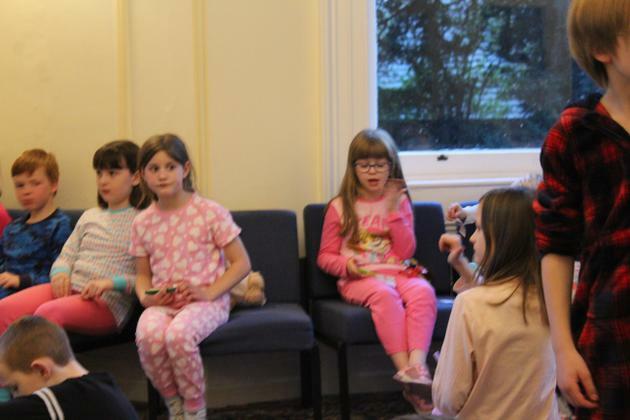 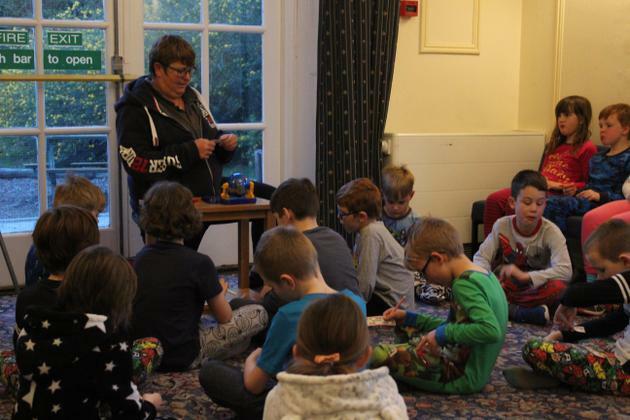 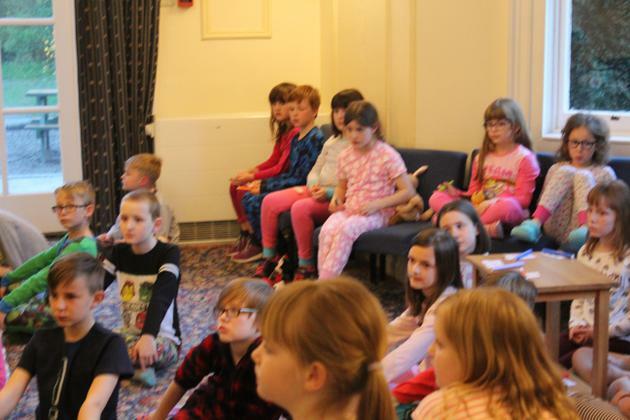 In the evening, we got into our pyjamas and played some games of bingo- it definitely got very competitive! 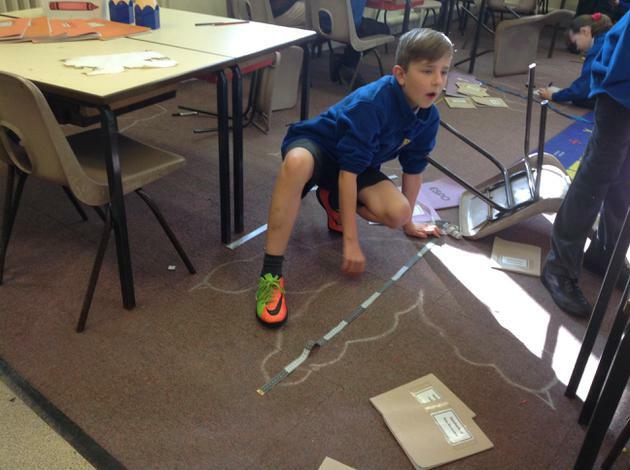 On Monday, we were extremely shocked to come into school to find that our classroom had been trashed. 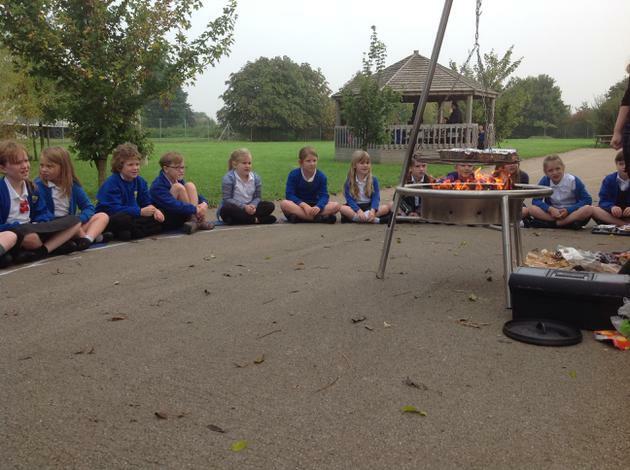 Chairs and tables had been knocked over and papers had been burnt. 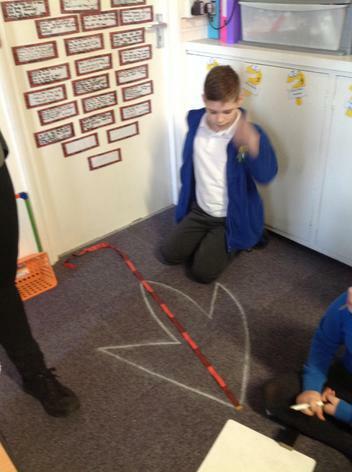 We could also see the outline of large footprints all over the floor. 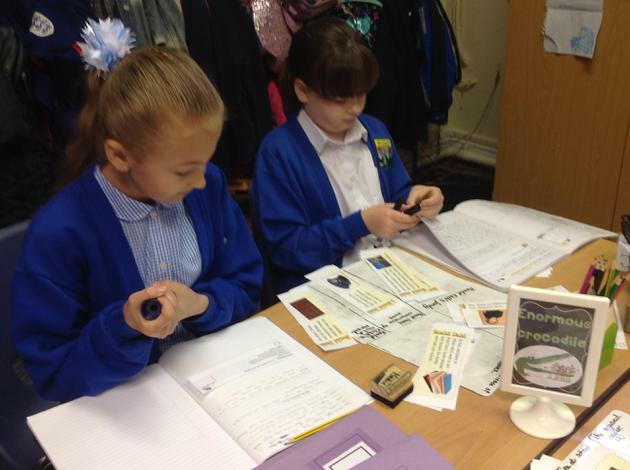 We decided we should report the crime and began to collect evidence. 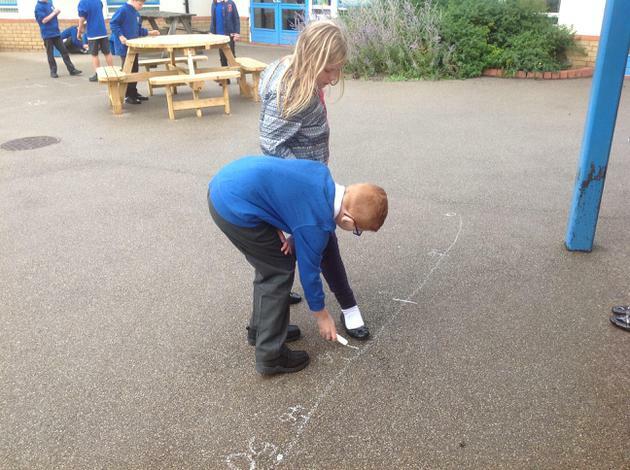 We measured the footprints using tape measures and then converted these cm measurements into mm. 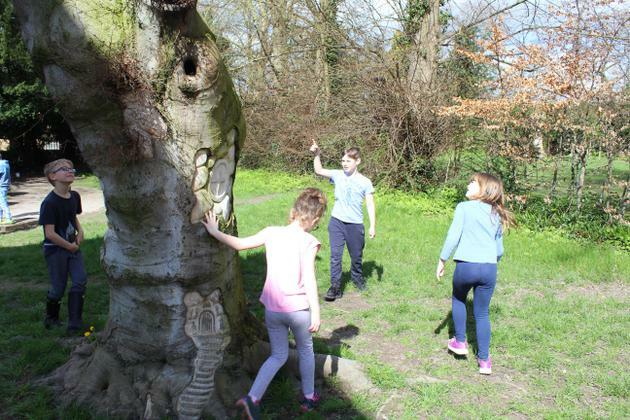 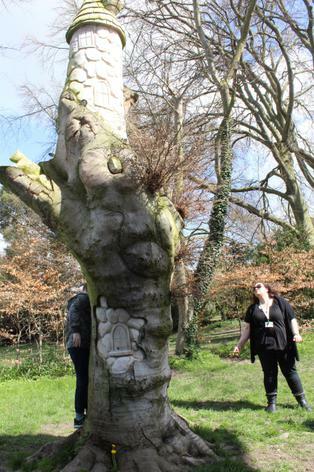 One of the children suggested we looked to see if there was any video evidence and were completely shocked when Mr Lenton discovered some of a dragon on the playground! 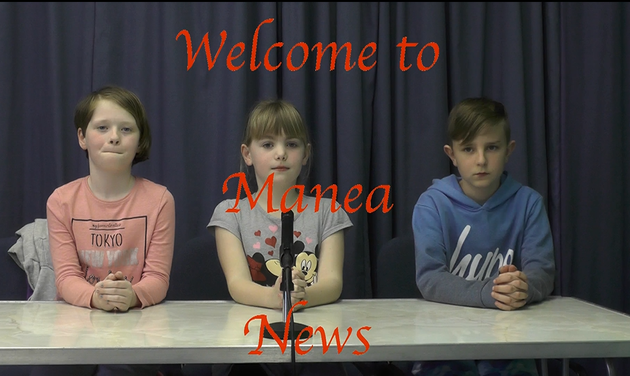 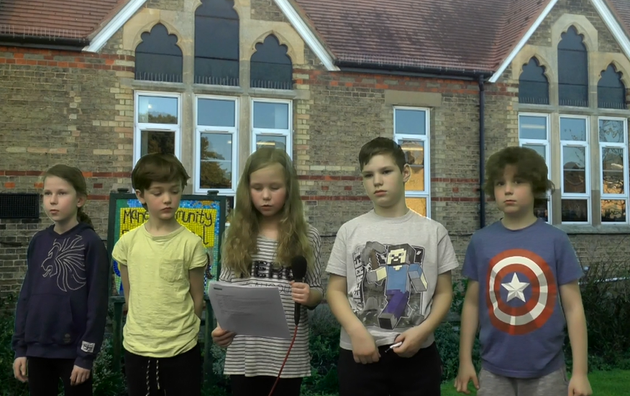 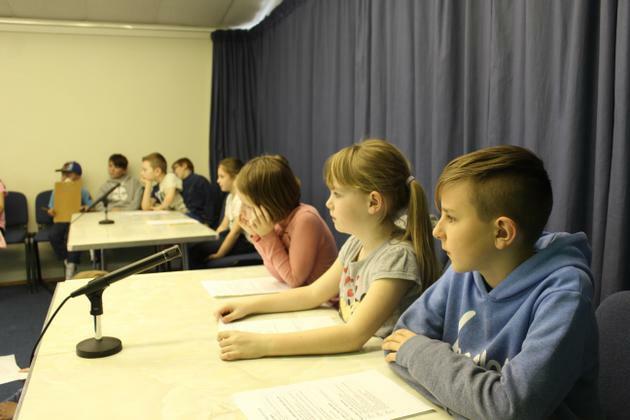 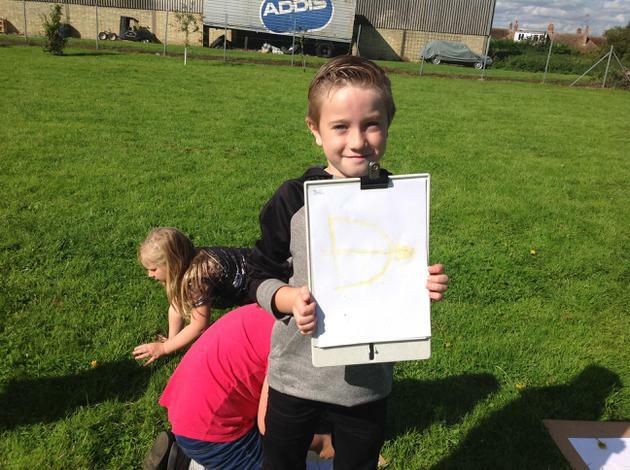 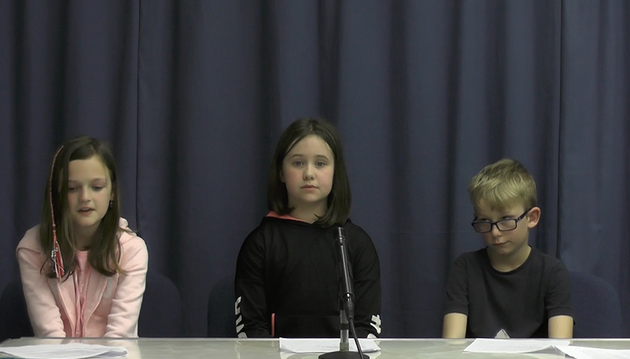 We felt like we needed to share the evidence we had gathered with the people of Manea and decided to create our own news report. 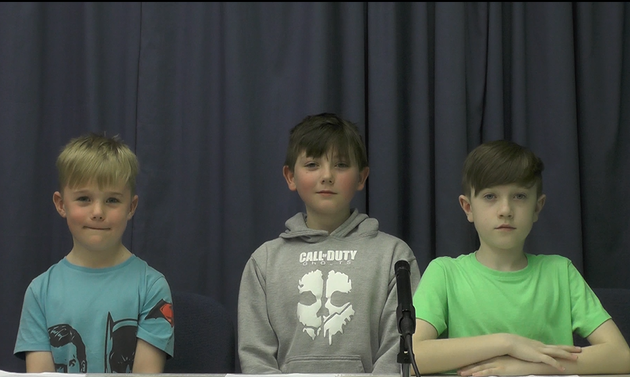 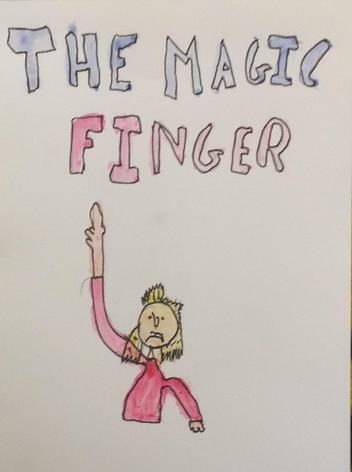 We worked in groups, with year three, to write the script for these. 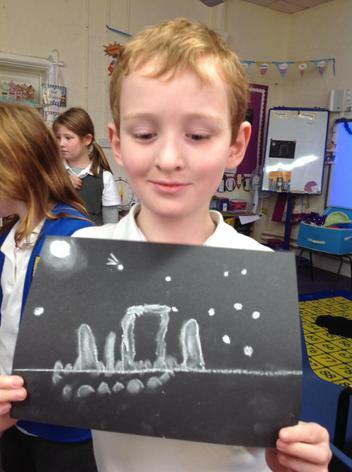 and even a giant longship! 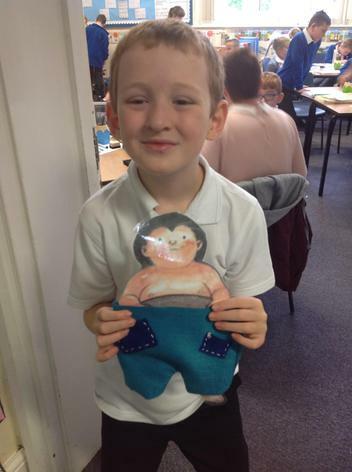 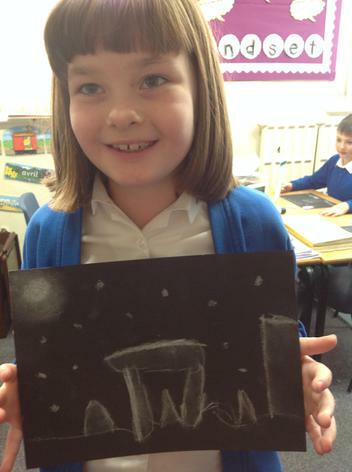 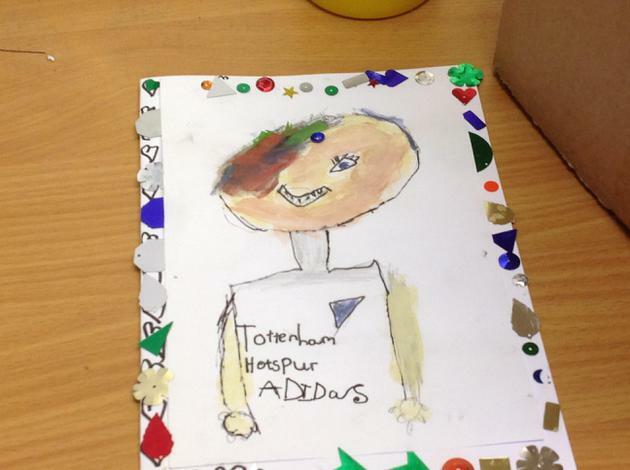 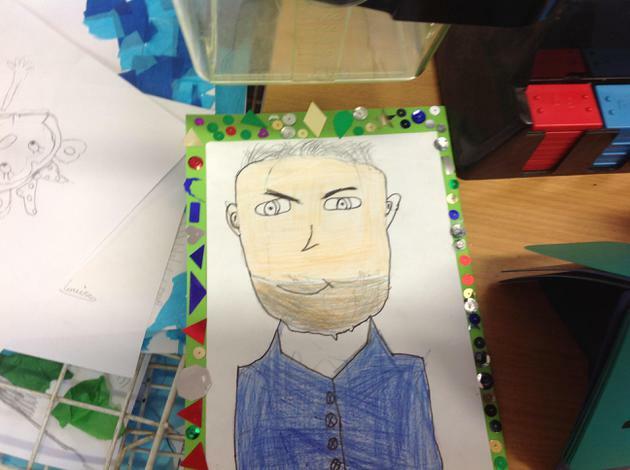 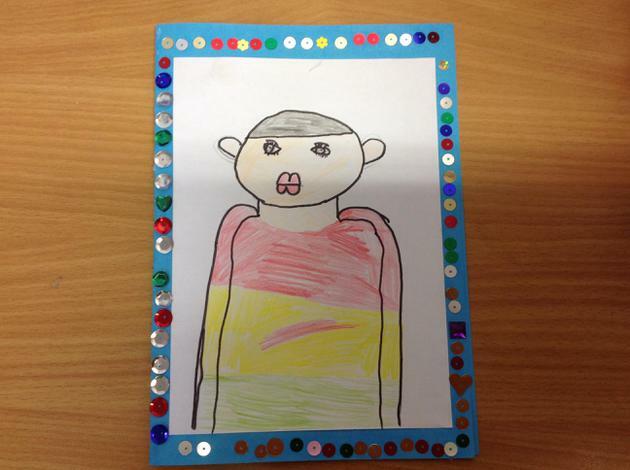 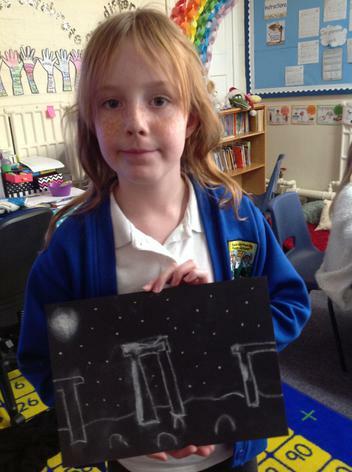 I would like to thank all of the parents and carers for all of their support with this homework. 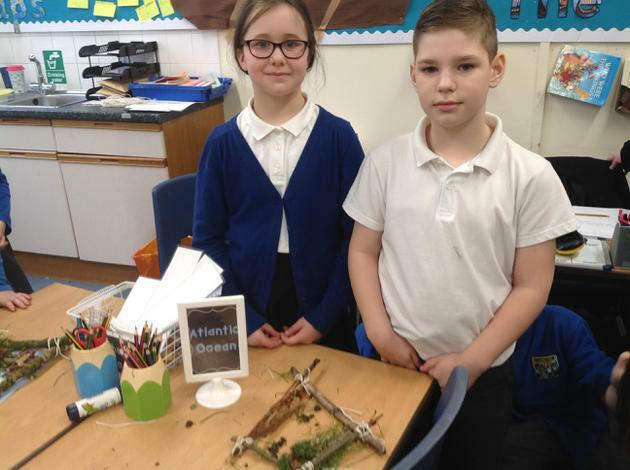 The children have made some beautiful things and learnt a lot and I know this wouldn't have been possible without you. 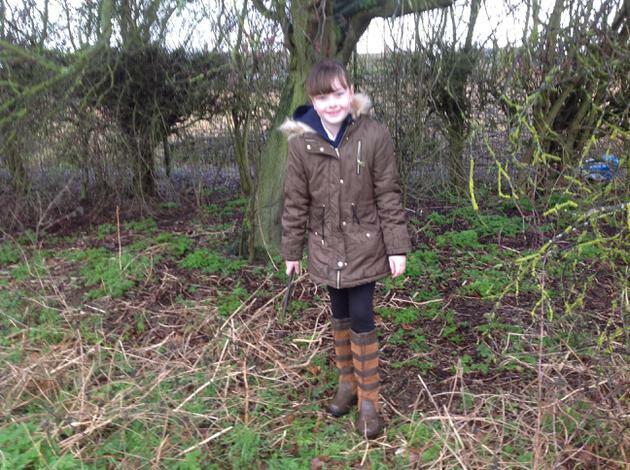 The snow is like an angel falling. 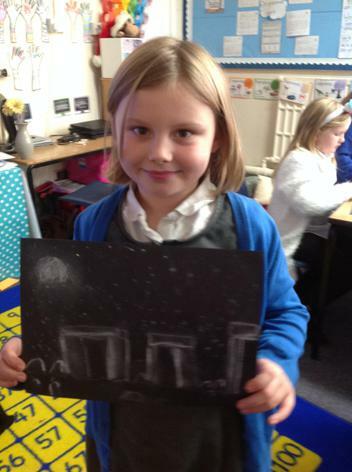 When it puts it's feet on the ground, it glistens like a thousand stars in the sky. 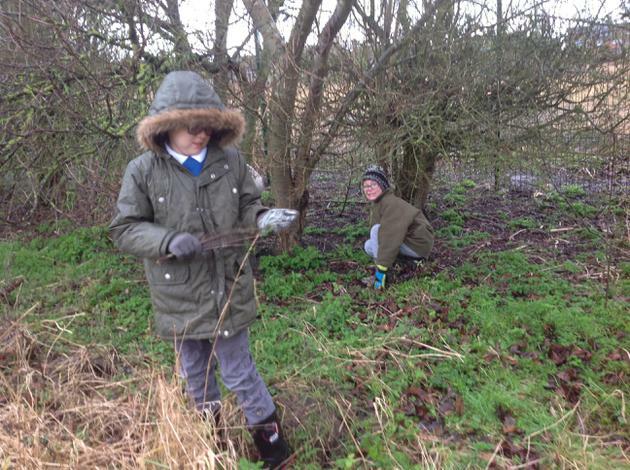 The snow is as crunchy as a biscuit. 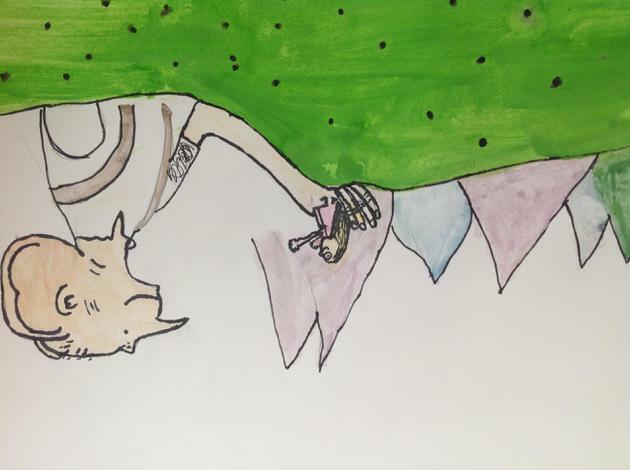 The white brisk snow is as beautiful as a gem. 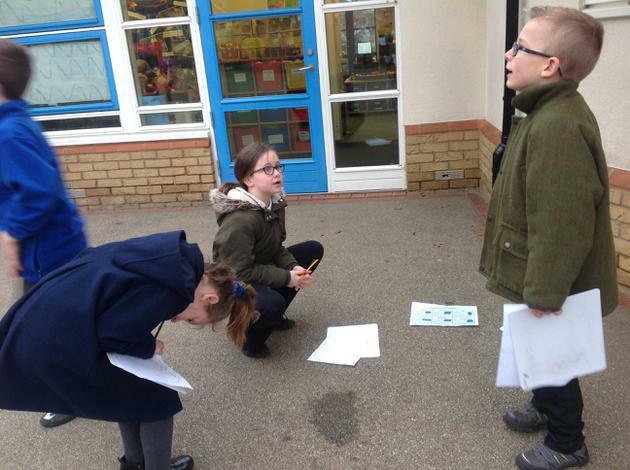 The snow sparkles like small crystal diamonds scattered on the floor. 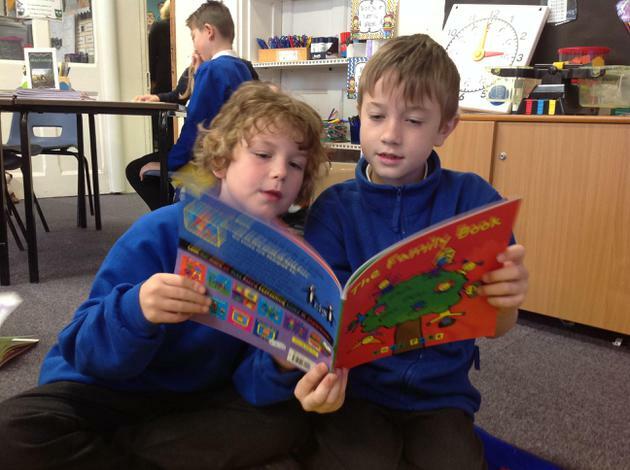 We started to read the story 'How to train your dragon' by Cressida Cowell. 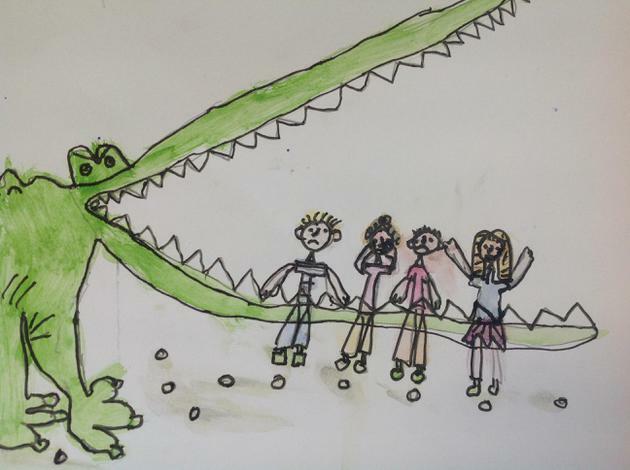 This led us to consider 'Are/ were dragons actually real?'. 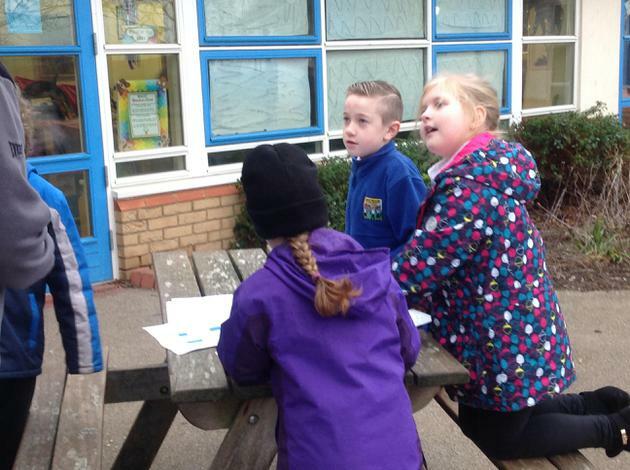 Because we had so many different opinions, we decided to have a debate! 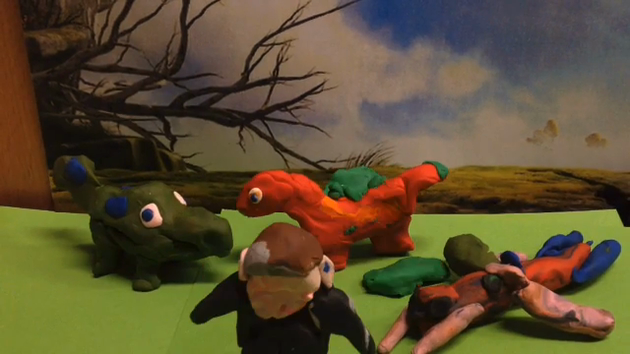 First we split ourselves into sides: those that believe in dragons and those that do not. 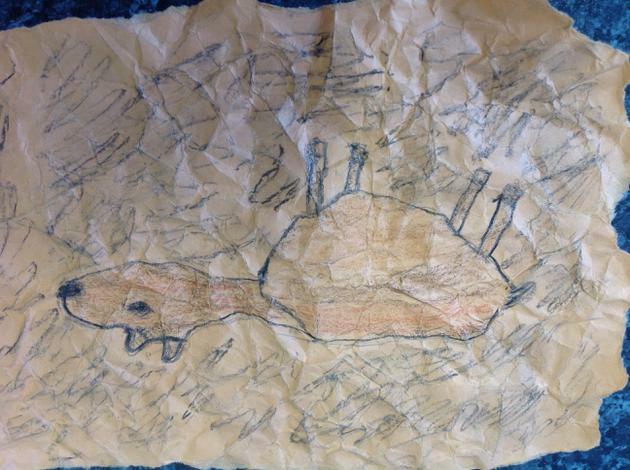 After that, we decided to design our own dragons. 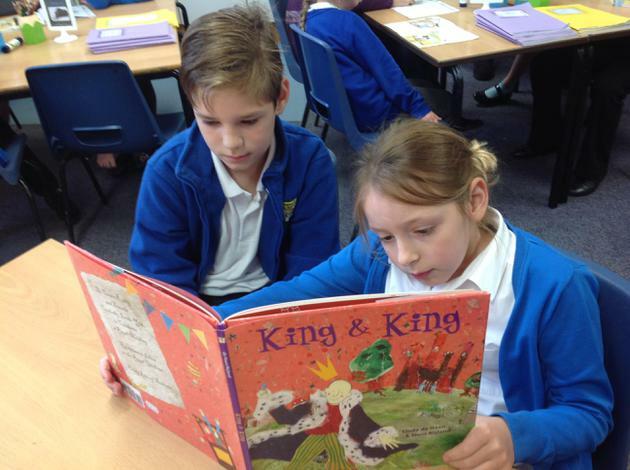 We ended our day with a lovely story in Year 6. 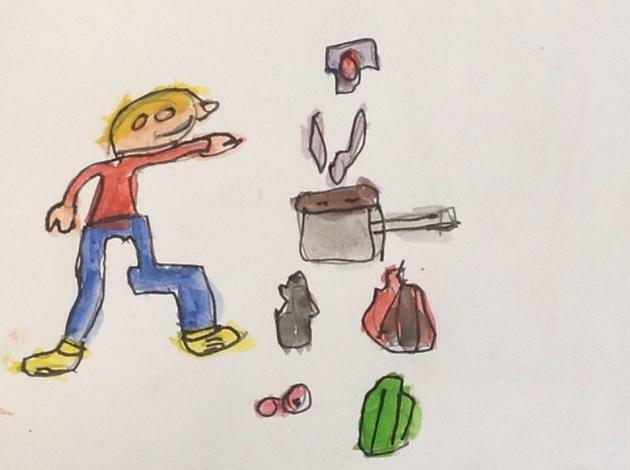 Thorfinn and the disgusting feast. 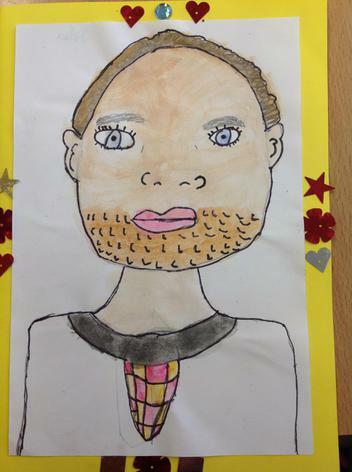 We have been reading the story 'Thorfinn the nicest Viking' by David MacPhail. 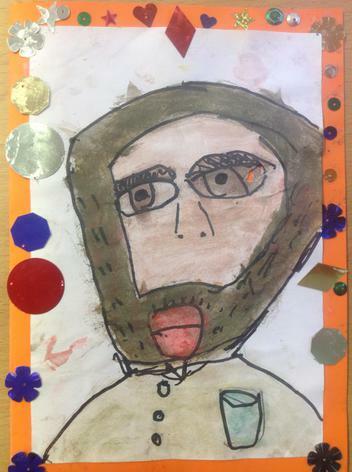 This week, we realised that this story was part of a series and looked at the cover for the story 'Thorfinn and the disgusting feast'. 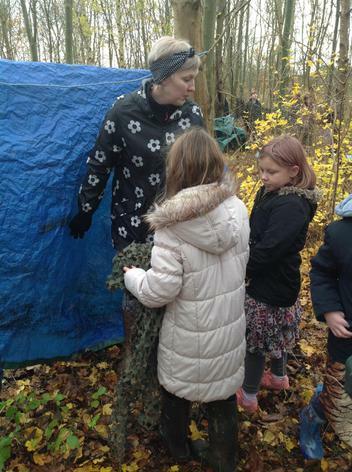 We imagined what might happen in this story and even acted it out our ideas when we went on our visit to the woods. 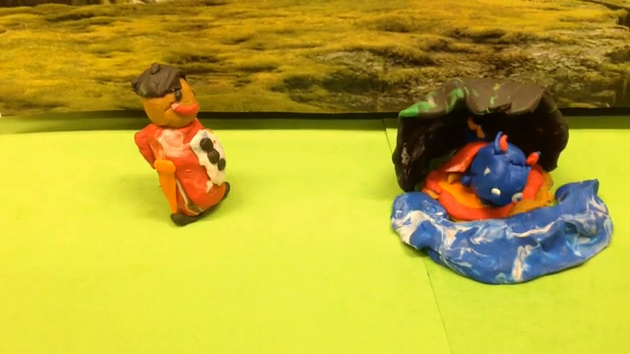 We had to create a setting for our versions. 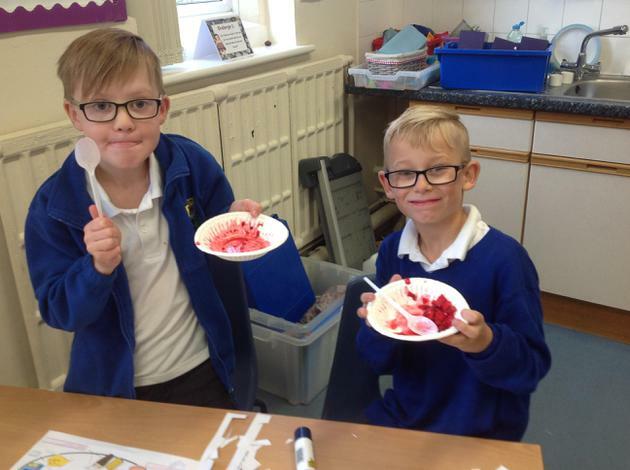 Back at school, we began to make props for the disgusting meal, including some fantastic cups. 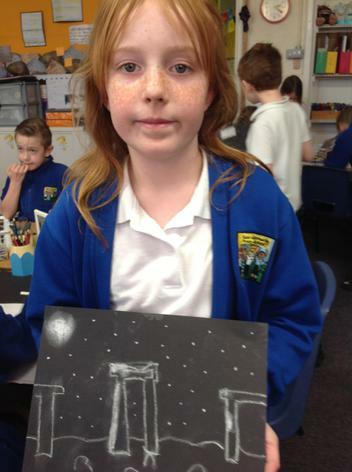 Don't forget to come and see the finish product at the marketplace in a few weeks time. 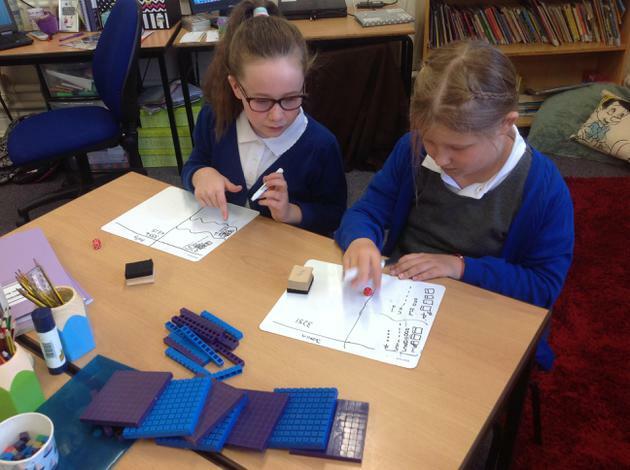 These week we have been continuing to develop our strategies for solving multiplication problems. 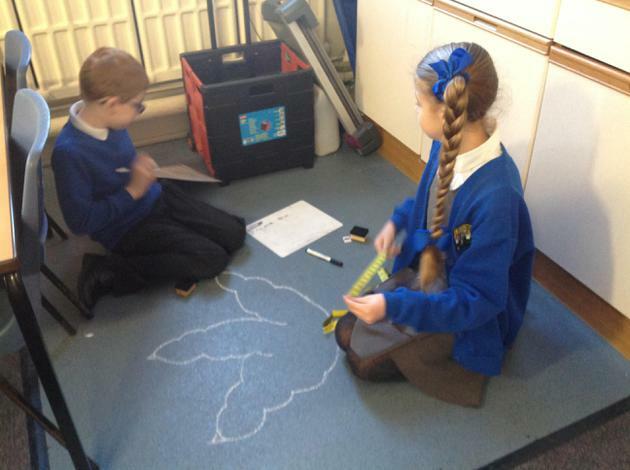 We started by thinking of different ways to represent multiplication problems in different ways. 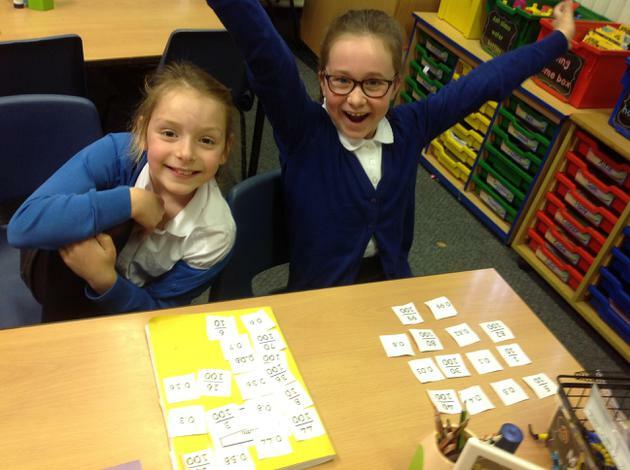 We then moved onto solving 2 digit x 1 digit multiplication problems. 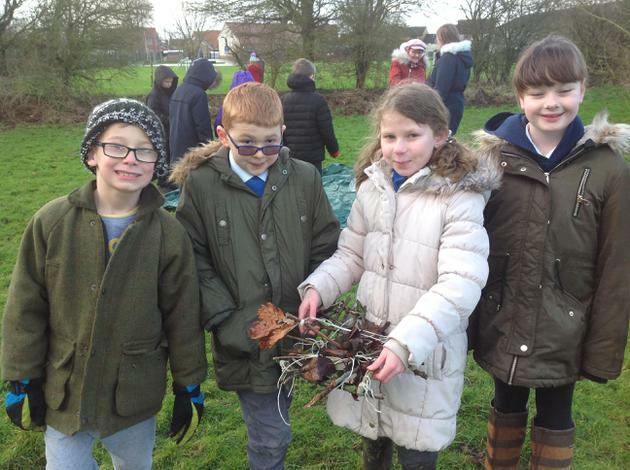 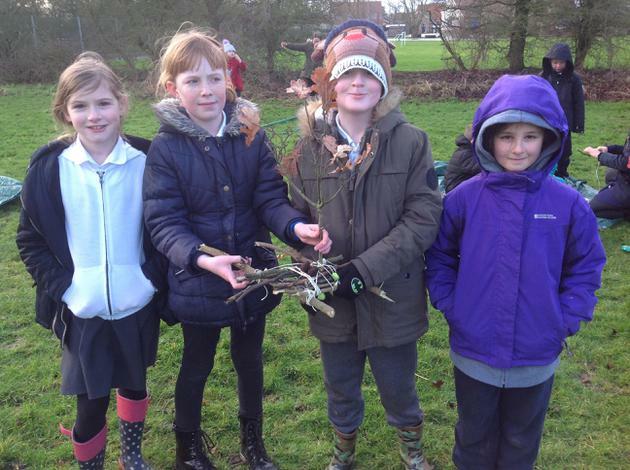 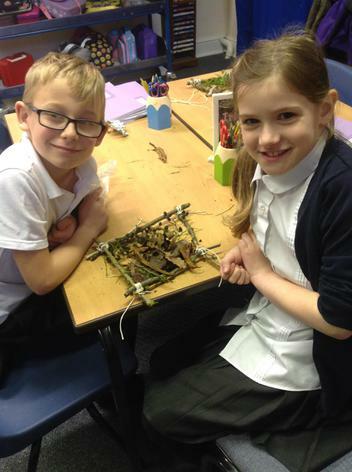 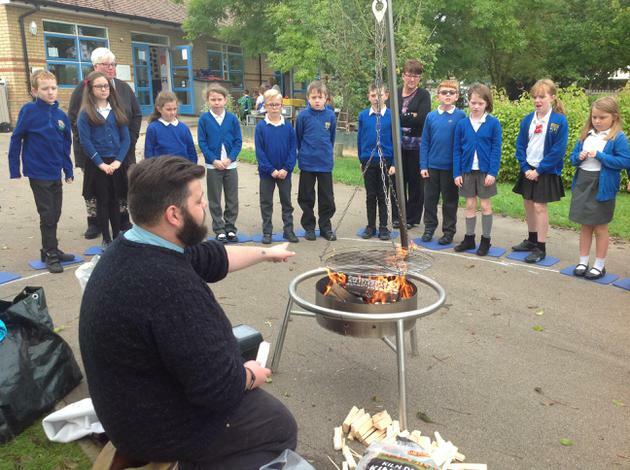 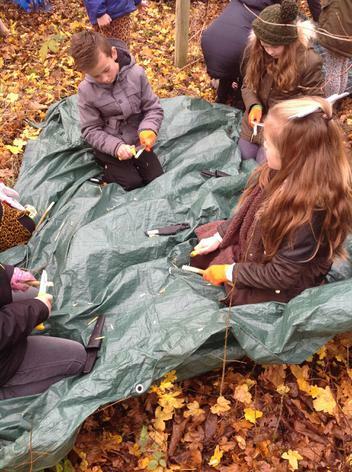 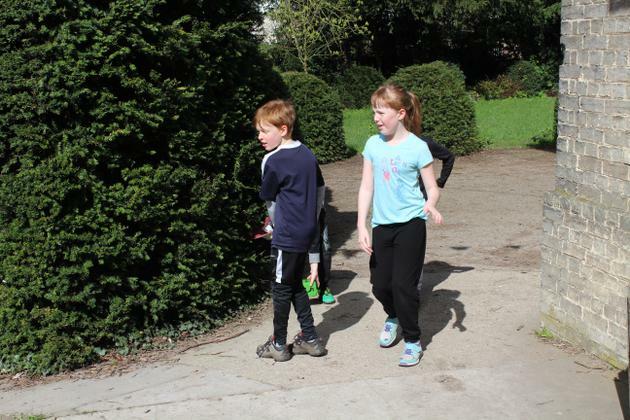 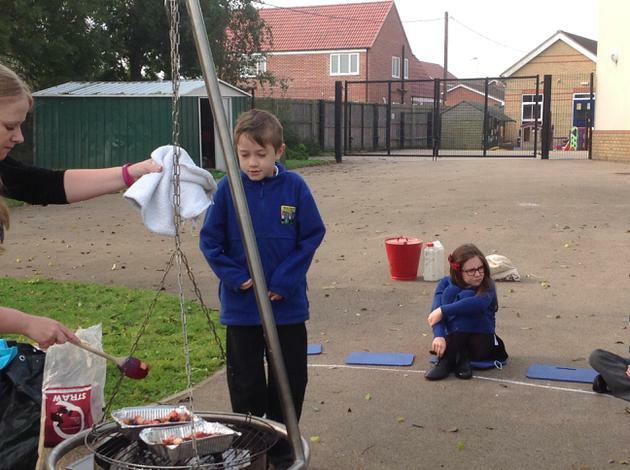 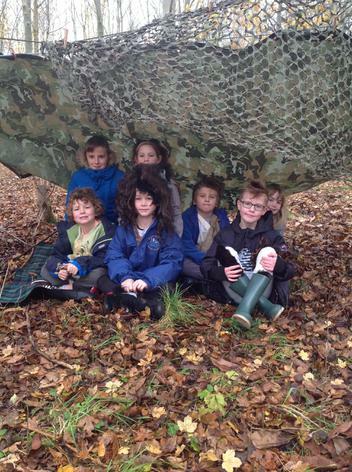 It was time for our third forest school session on Wednesday and we all came to school prepared to get going. 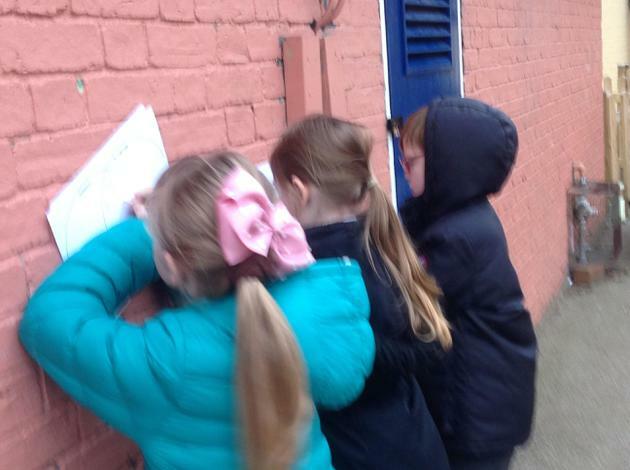 However, as we were taking the register we were disappointed to hear the sound of rain falling outside. 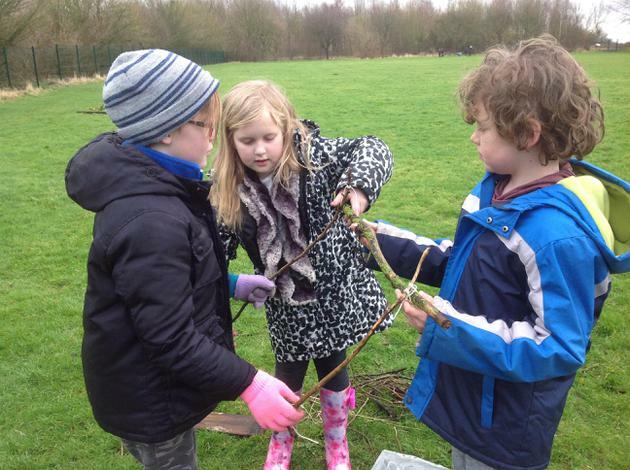 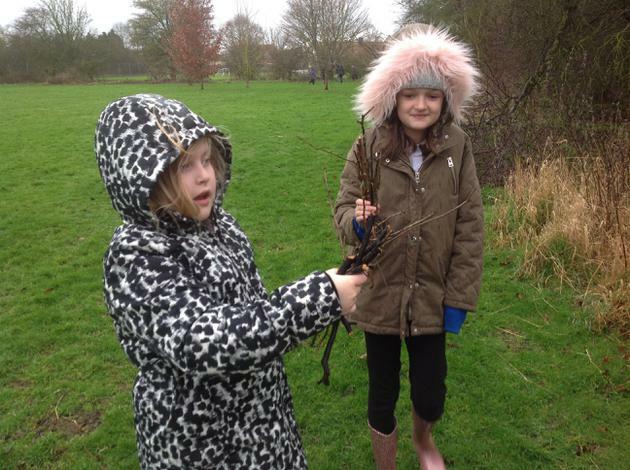 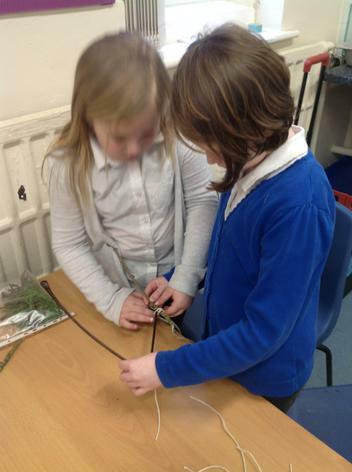 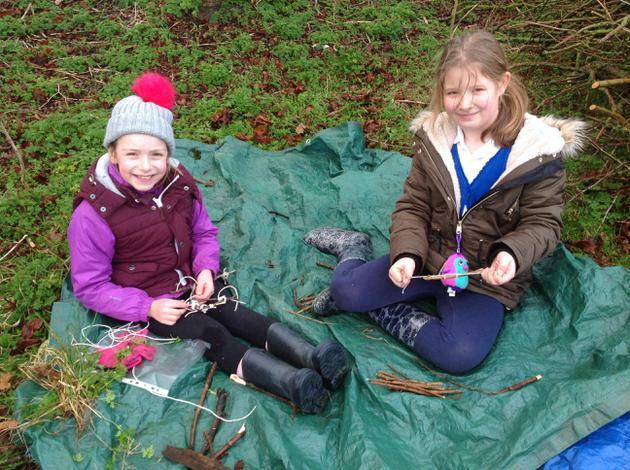 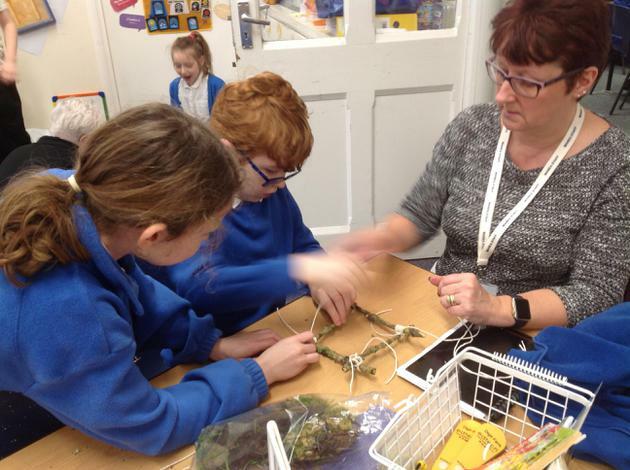 The children really didn't want to cancel the forest school session and after practising our clover hitch knots again in the classroom we decided to brave the weather. 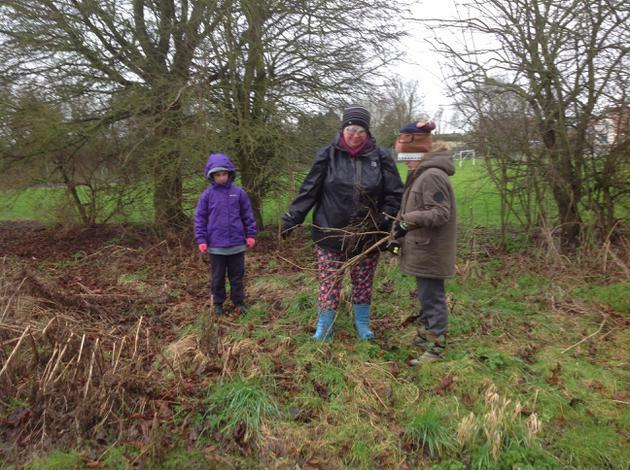 As we walked outside, the rain got lighter and lighter- and by the time we had reached the back field we were amazed to find it had stopped altogether. 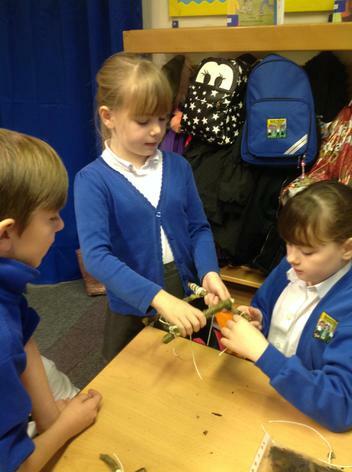 It has to contain clove hitch knots. 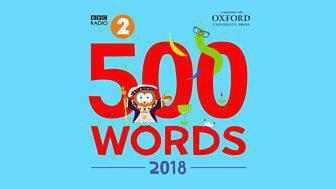 This week, we have started thinking about our entries for the BBC Radio 2 500 word competition. 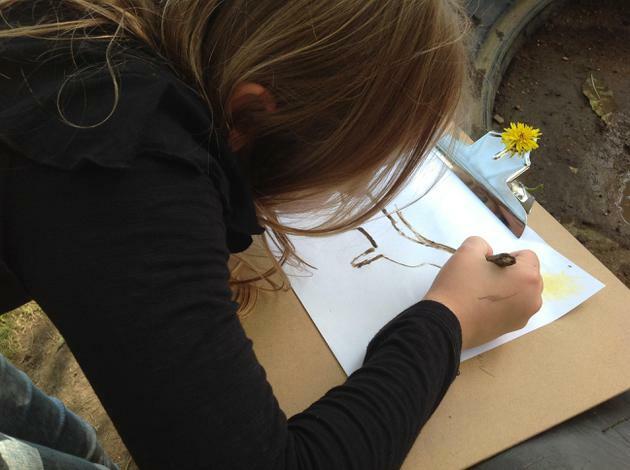 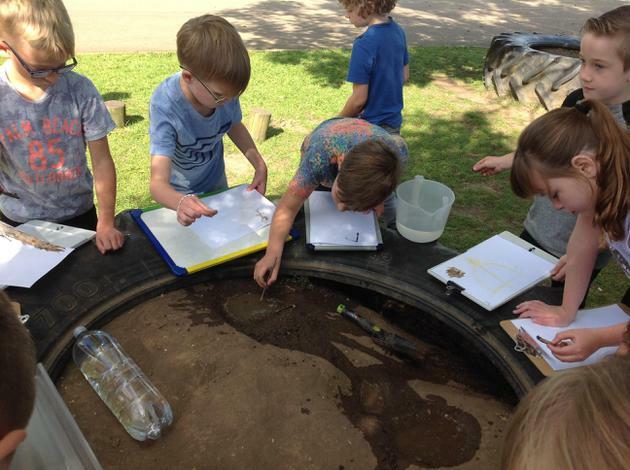 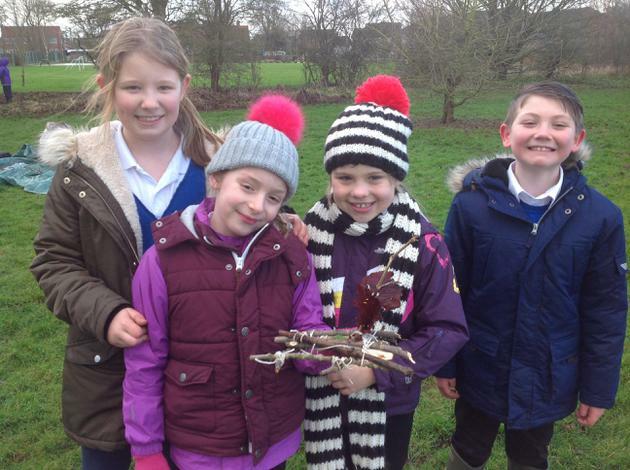 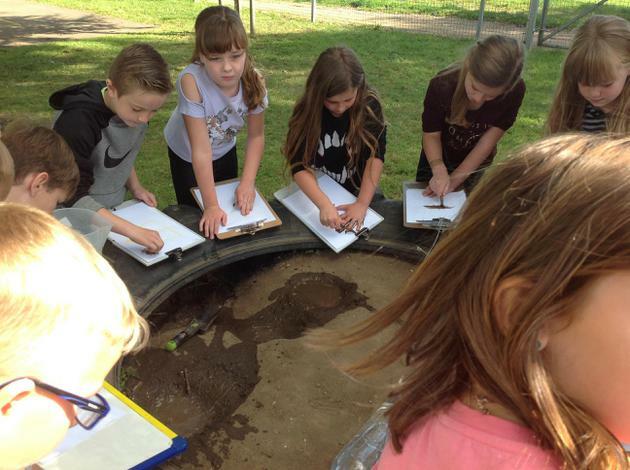 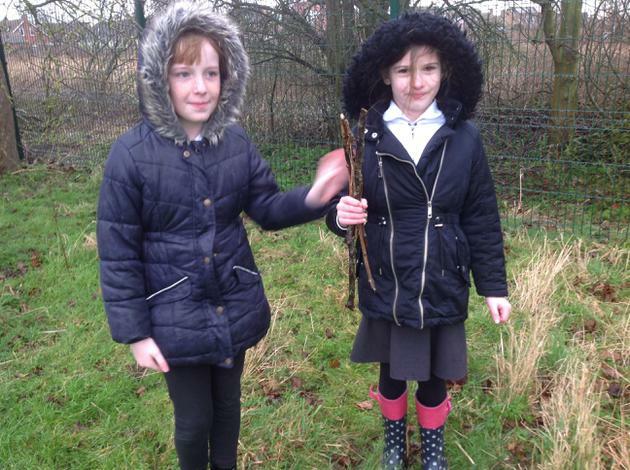 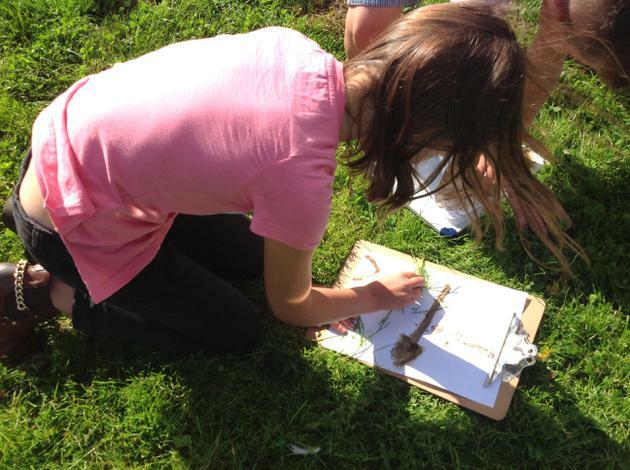 We found our inspiration in our outdoor environment and went looking for living things around the school grounds. 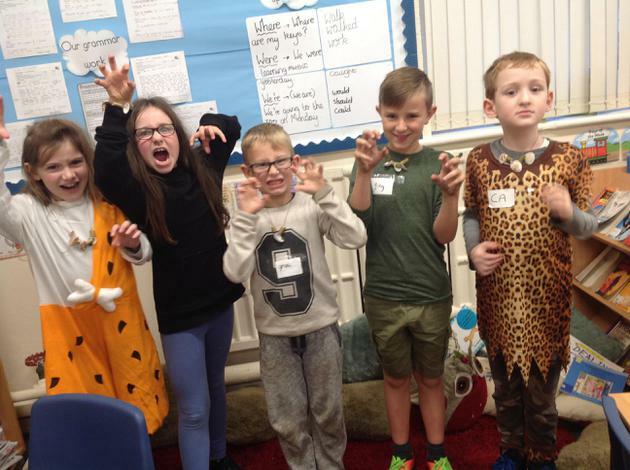 We then imagined that one day we woke up as one of these creatures- we used some fabulous descriptive language to describe what we saw. 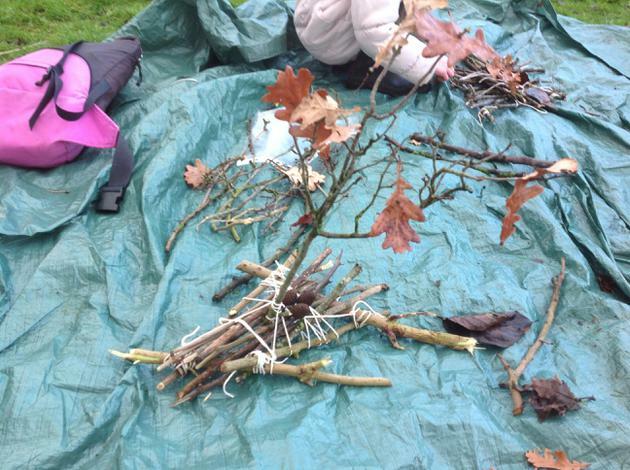 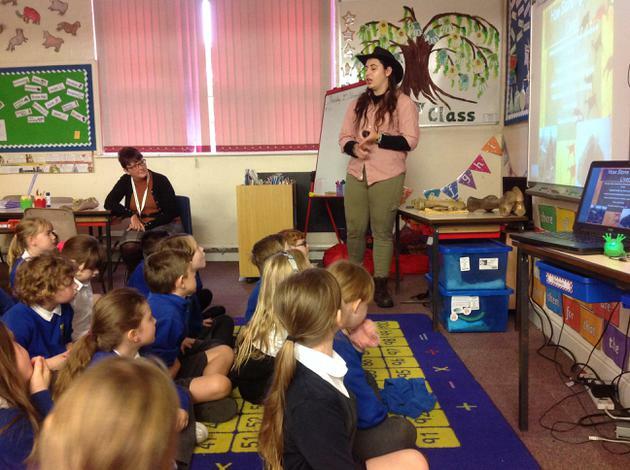 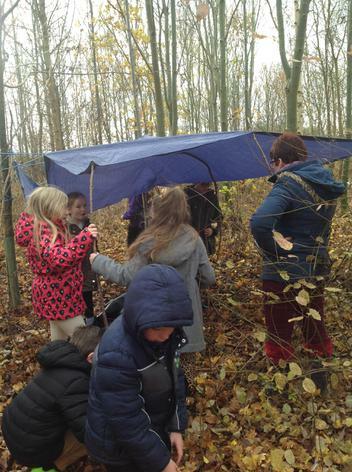 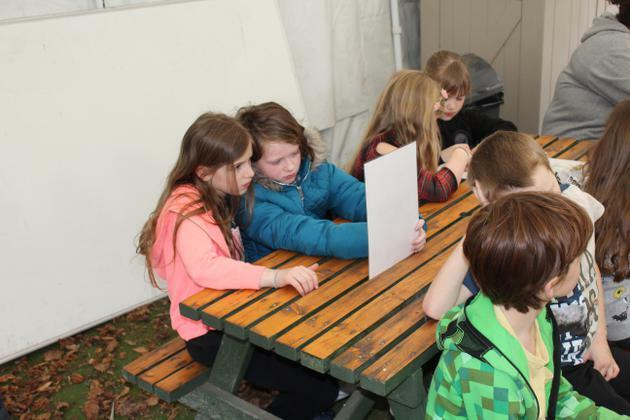 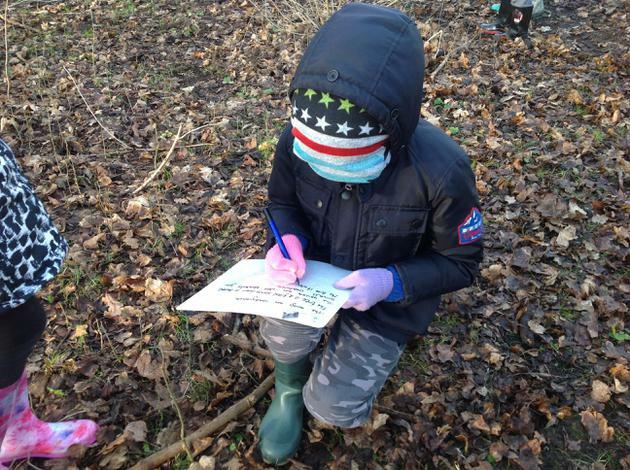 On Wednesday, bad weather meant we brought our forest school lesson to the classroom. 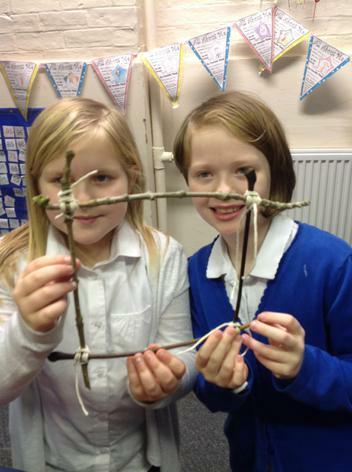 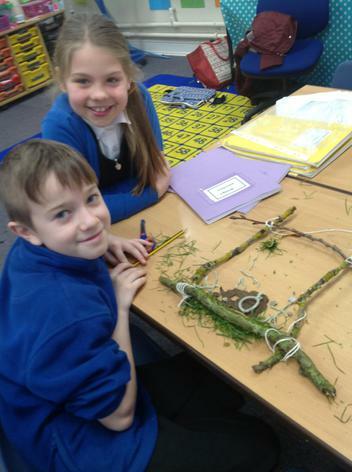 We learnt how to make a clove hitch knot, to join wood together to make a photo frame. 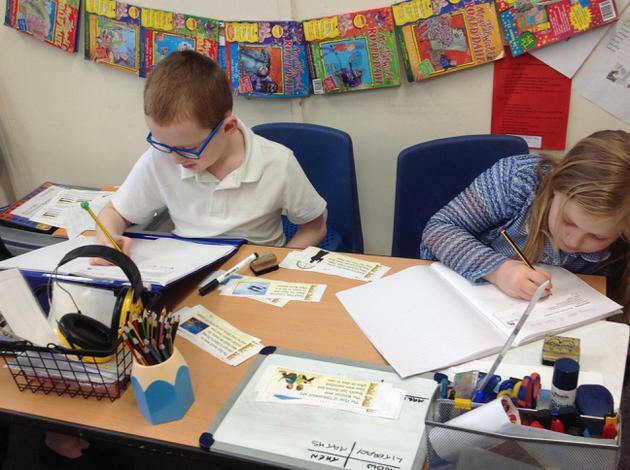 Then we created settings for our stories inside the frames and used these to do more fantastic writing! 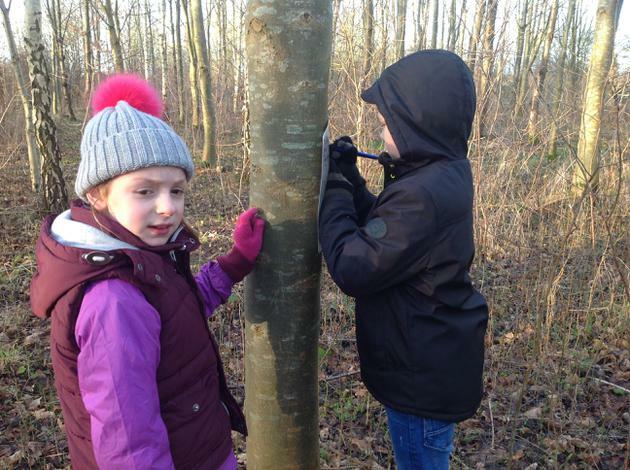 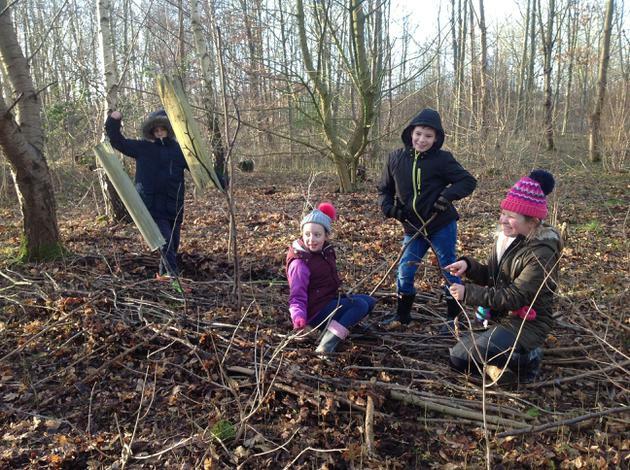 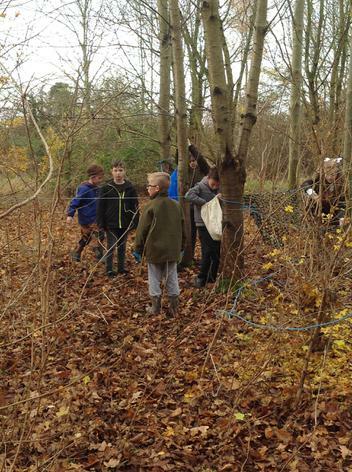 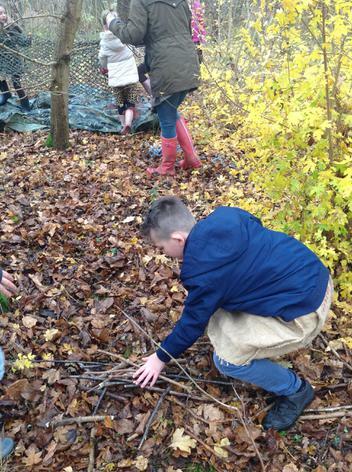 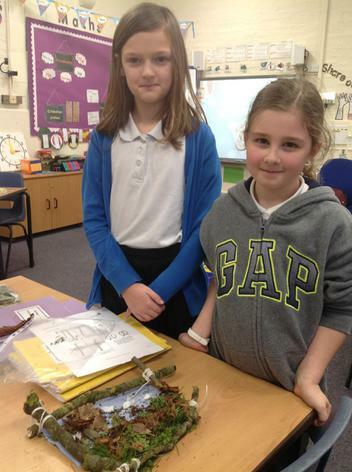 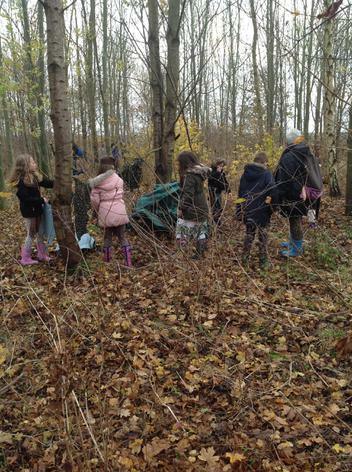 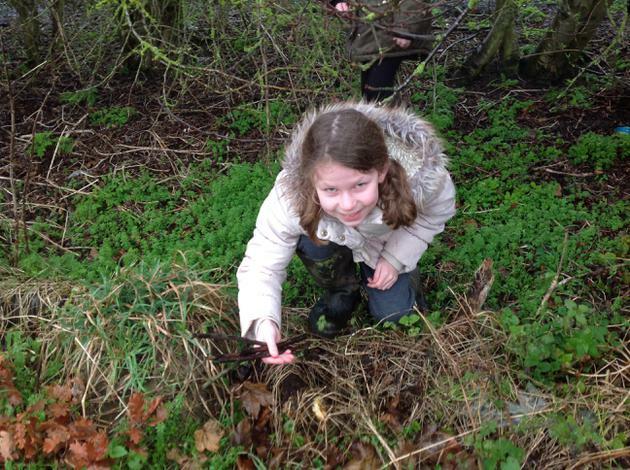 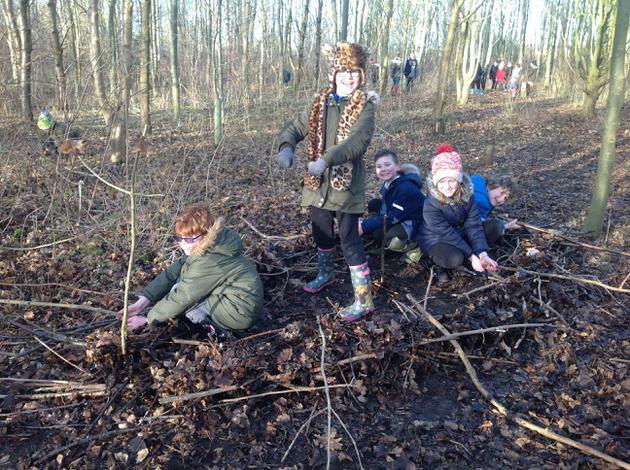 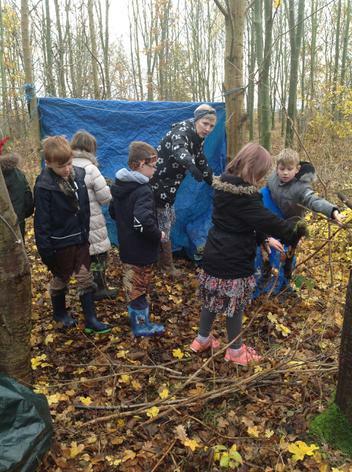 This term, we will be taking part in a six week forest school project. 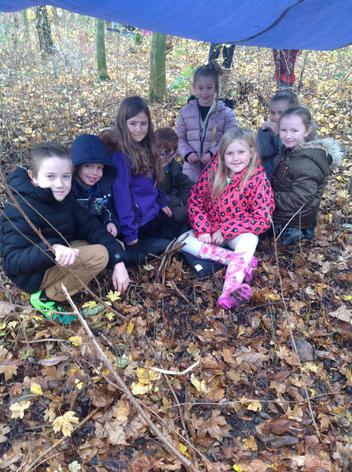 We started it this week by visiting the woods on Wednesday. 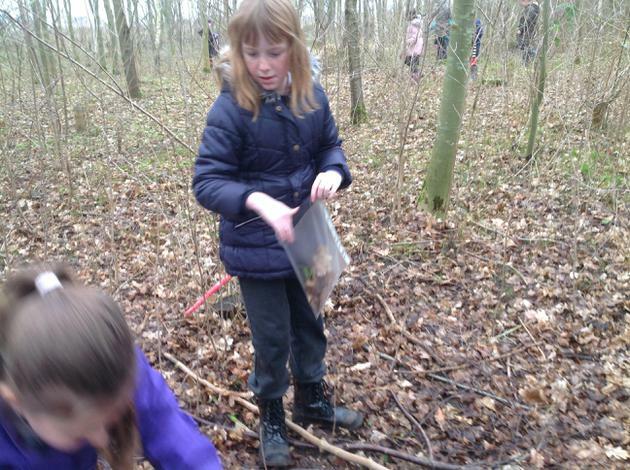 First we explored the woods and looked for an 'interesting' thing. 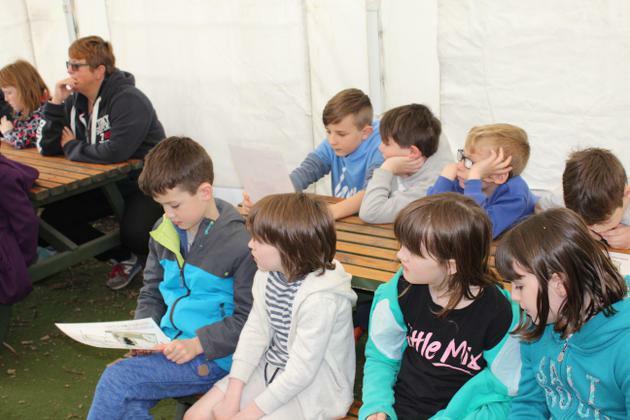 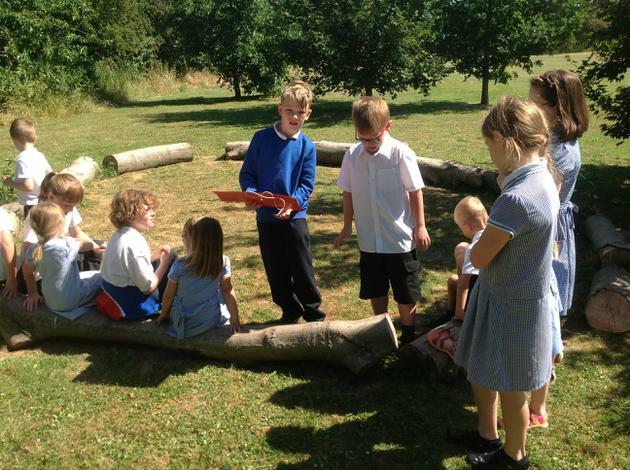 The children came up with some fabulous stories to go with their interesting thing! 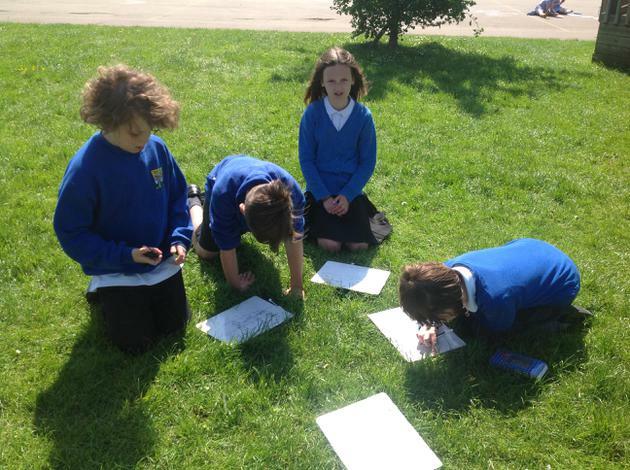 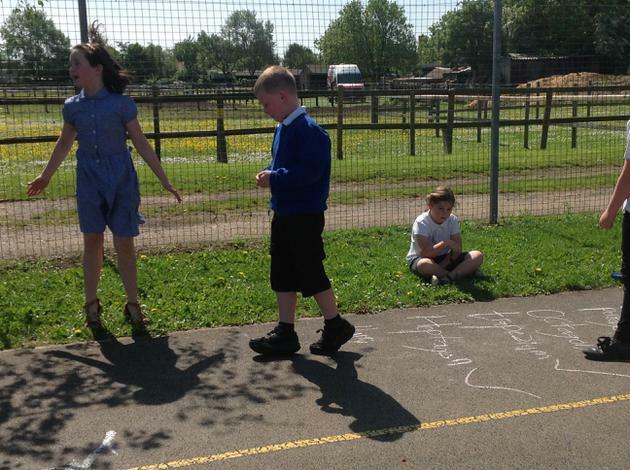 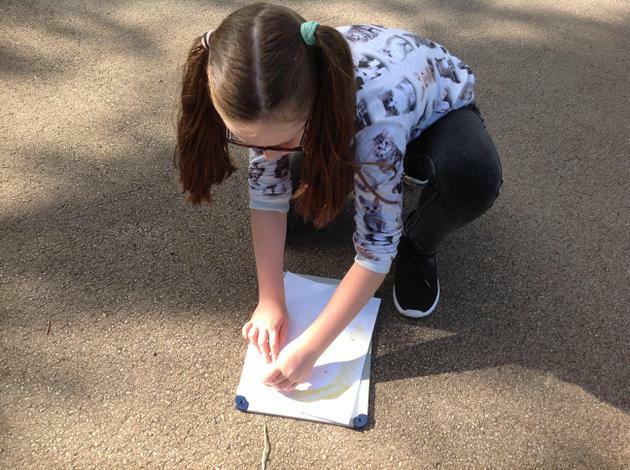 Next, we used the natural environment to create some metaphors. 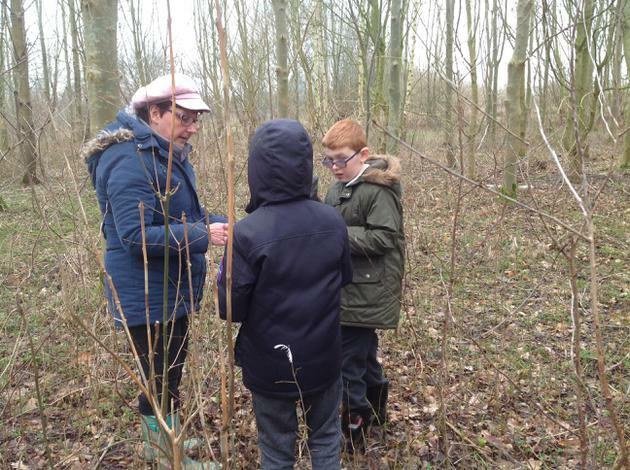 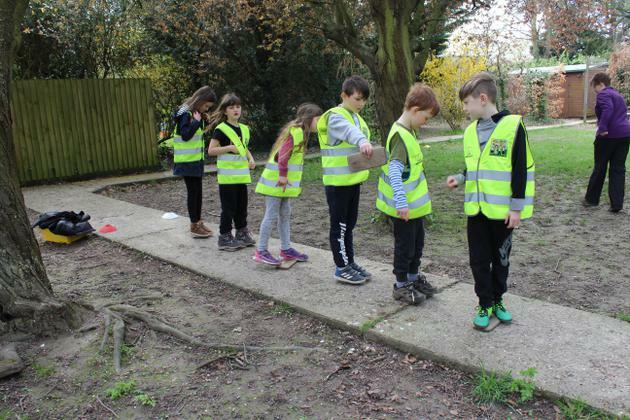 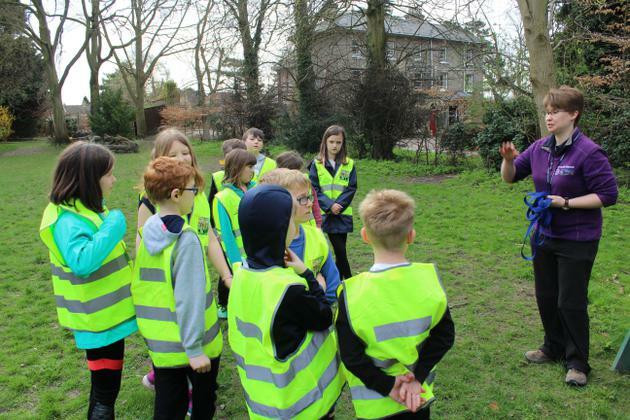 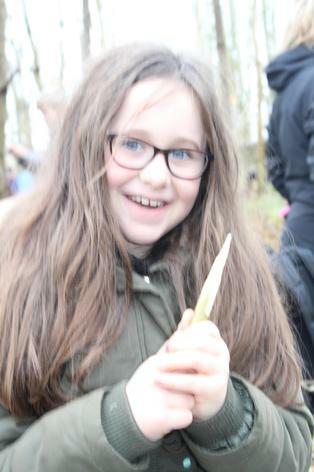 After that, we discussed the skill of foraging and thought about the things that were safe to collect and the things we should avoid. 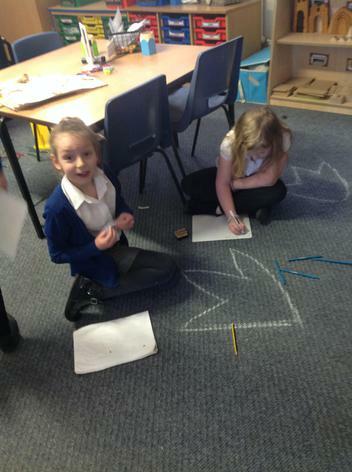 This week in Maths, we have been identifying 2d shapes and their properties. 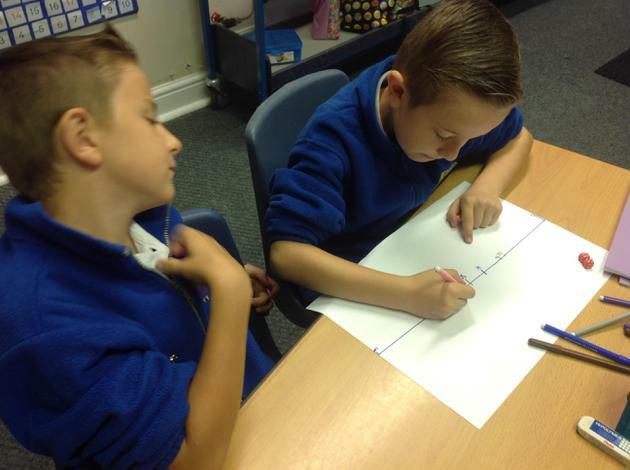 We have learnt new names for different quadrilaterals and types of triangles. 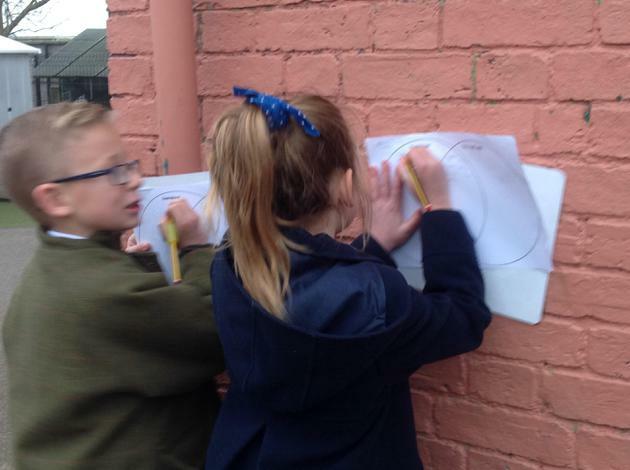 We have also learnt to group these into venn and carroll diagrams. 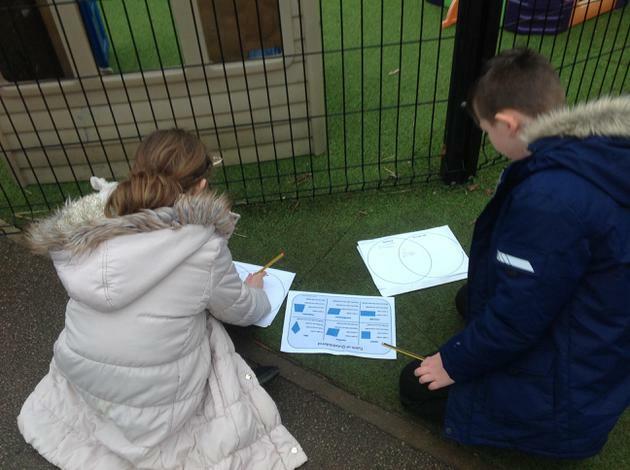 We have begun our enquiry of 'Set Sail'. 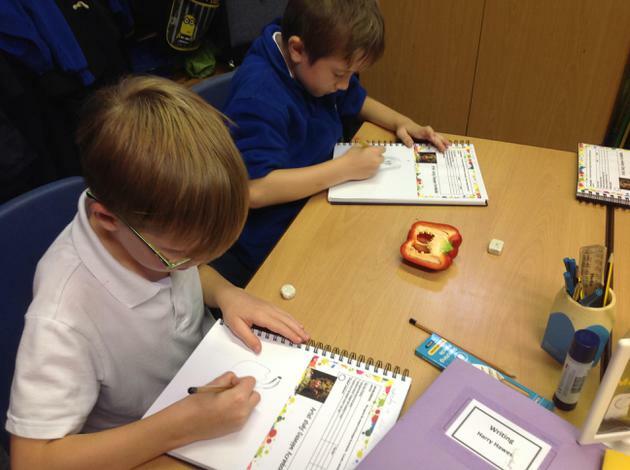 We started the week by thinking of questions that we would like to find out about the Vikings. 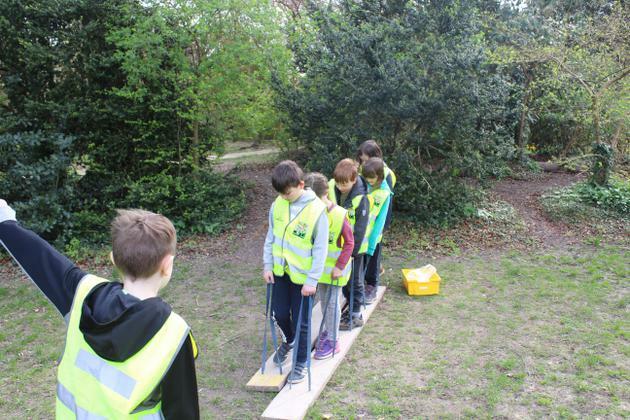 Some examples of these are: How long did they stay on the boats for? 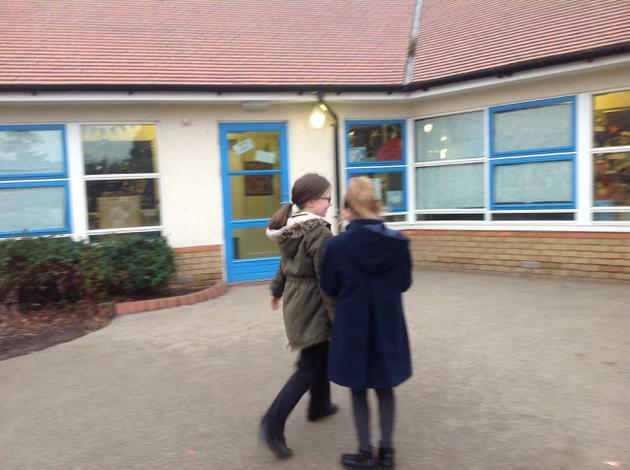 Did they dance and celebrate? 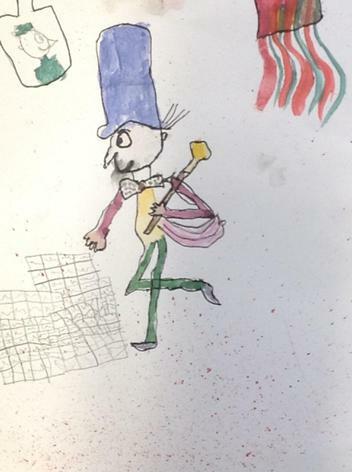 Why did they invade other countries? 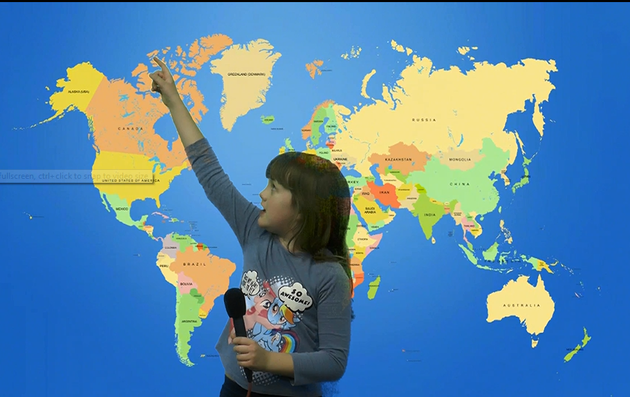 We looked at the countries where they originated from on a map and thought about how they would have travelled to Great Britain. 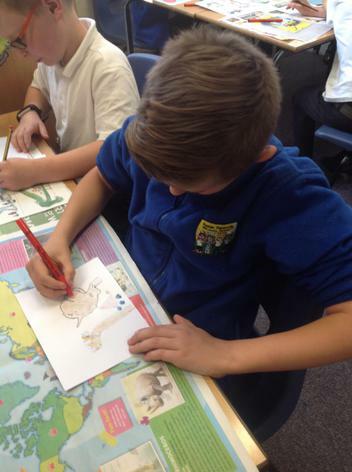 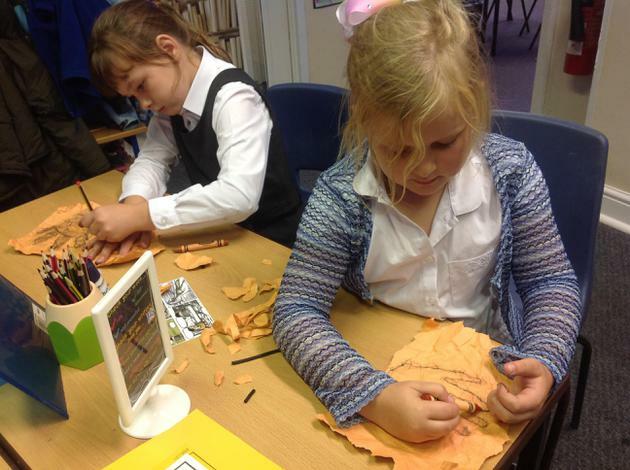 We then read some information about Viking longships- and created our own! 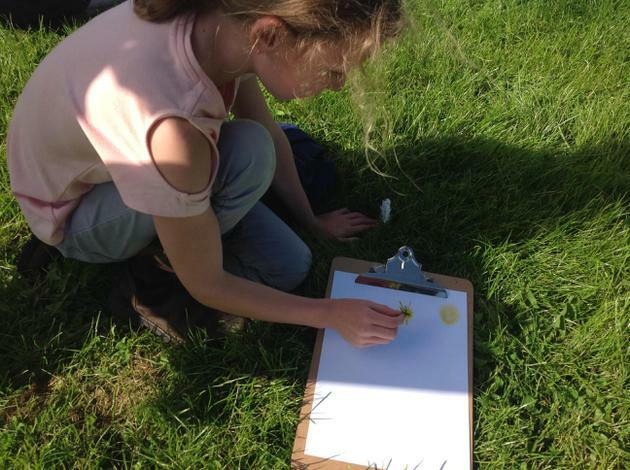 This also ties into our art lesson, where we were considering different types of paint and colour mixing. 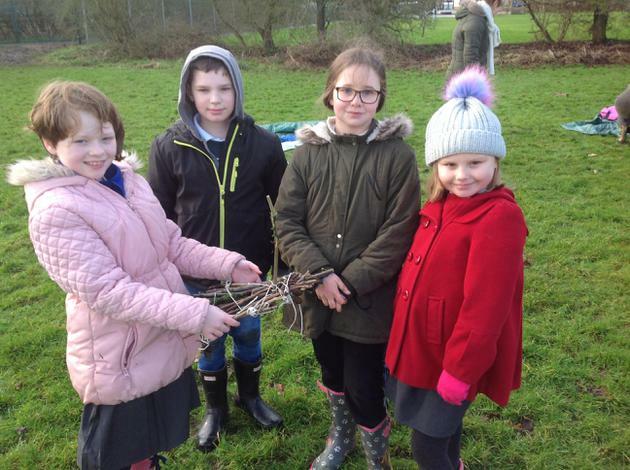 We have had a fantastic start to 2018 this week. 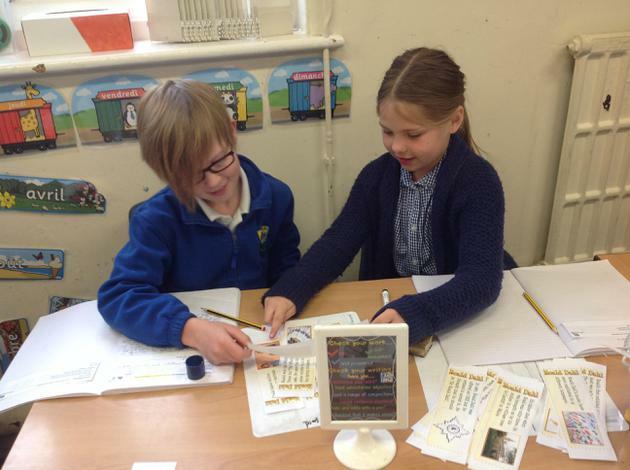 In Literacy, we have enjoyed reading a range of poetry and wrote some fantastic versions of 'The magic box' by Kit Owen. 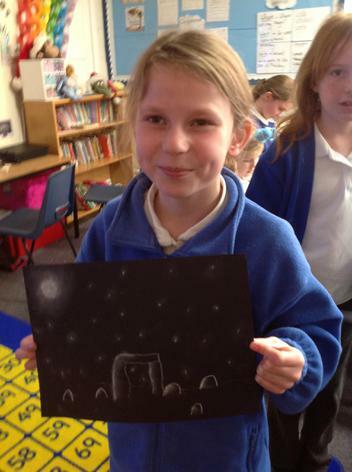 We even learnt how to use metaphors and similes to create imagery. 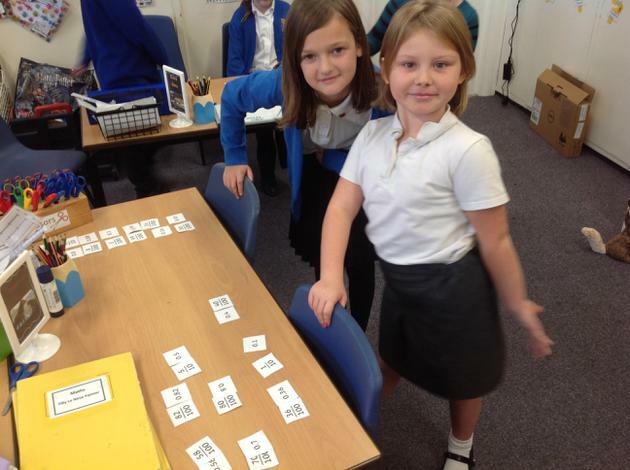 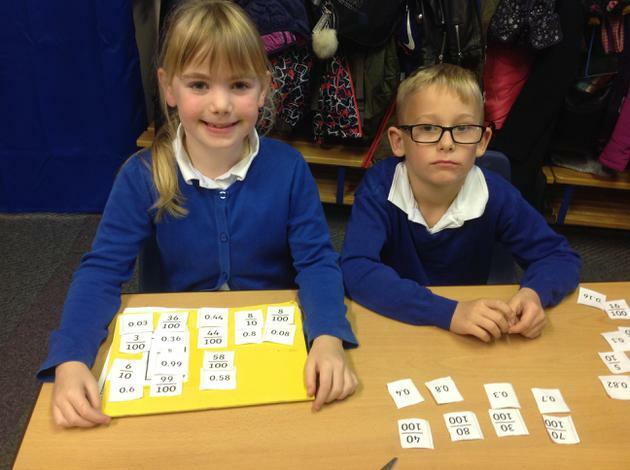 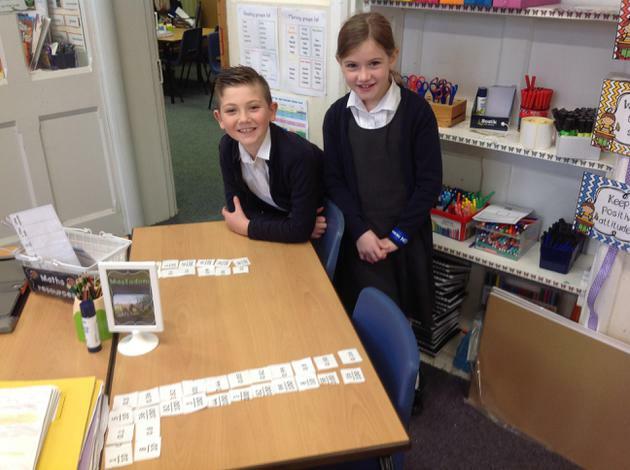 In Maths, we have been securing our understanding of place value and learnt to partition numbers in different ways. 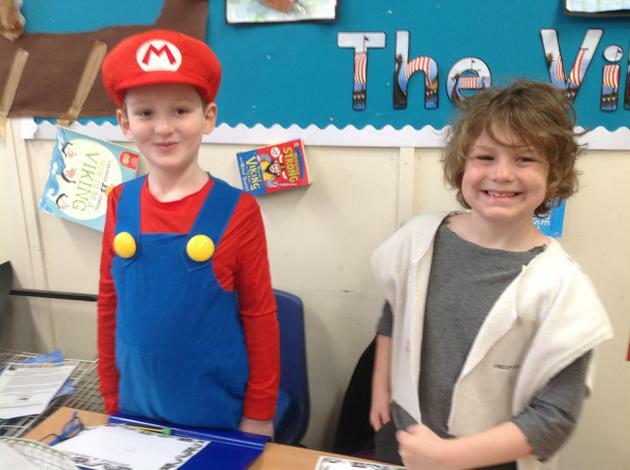 We were also introduced to the website Timetables Rock Stars. 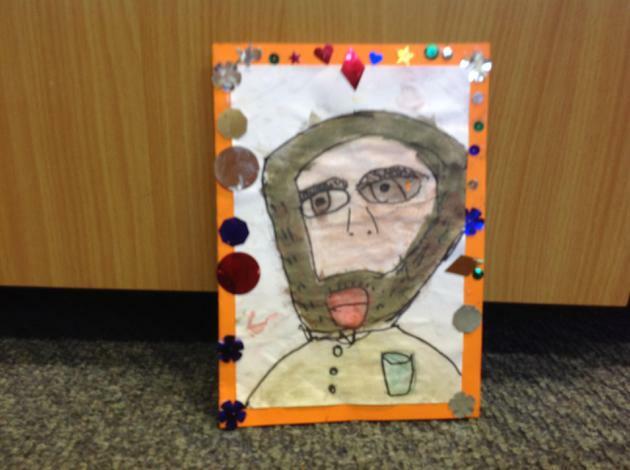 The children loved creating their own rock star avatars and competed against one another to earn coins. 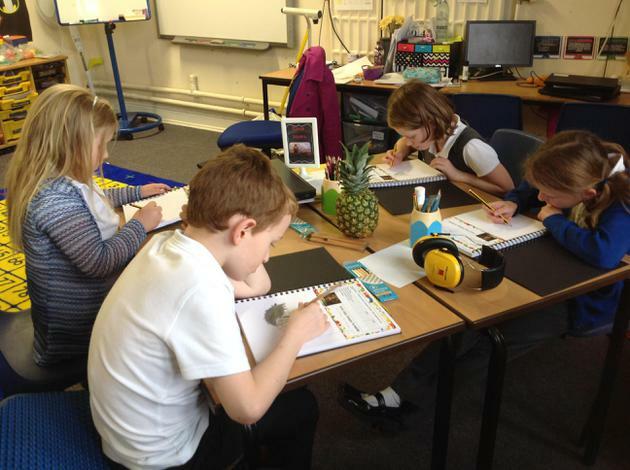 This website can also be used at home and it will help the children to practise their times tables whilst improving their recall and fluency. 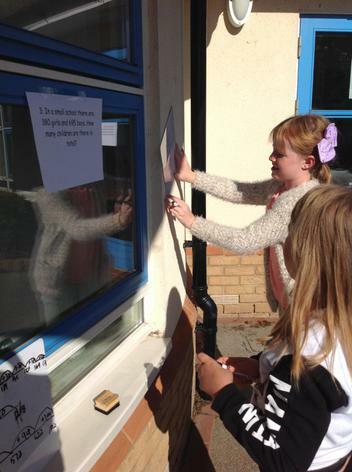 All of the children should have brought home their usernames and passwords on Friday. 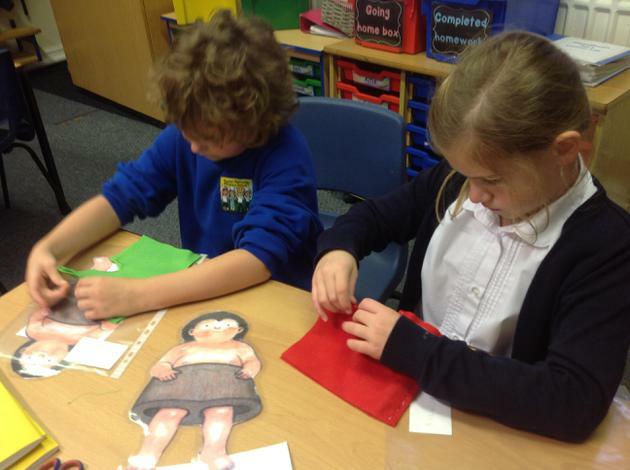 This week we have been busy preparing lots of Christmas crafts to bring home! 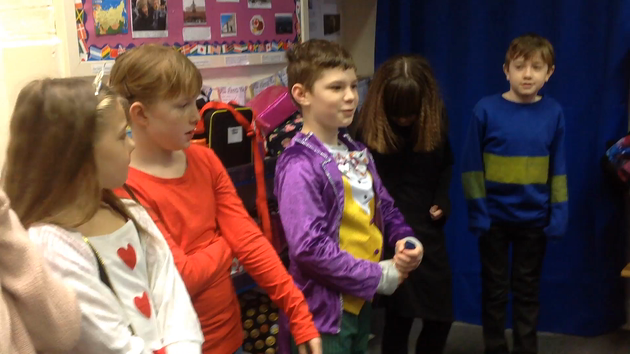 We have certainly had fun covering ourselves (and our classroom) in glitter and sequins. 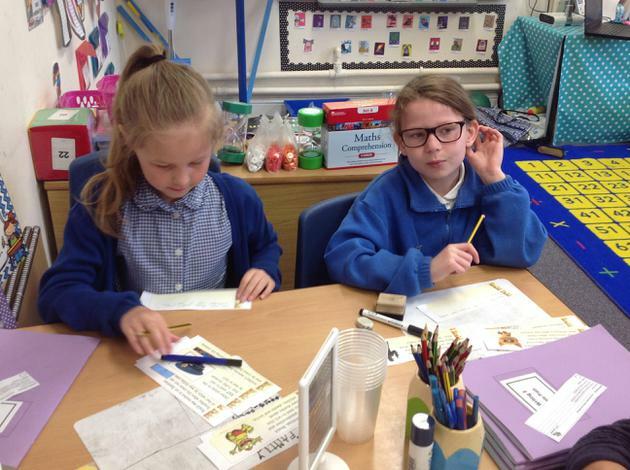 Next we made our calendars and our cards. 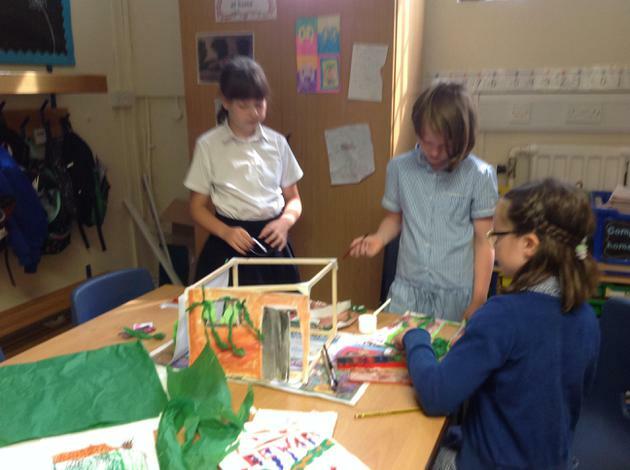 This week we also received an early gift... a building area! 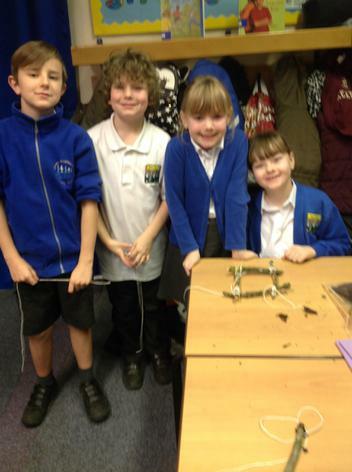 We have enjoyed exploring different structures that can be made from the bricks and even found ways to apply our Maths and History learning. 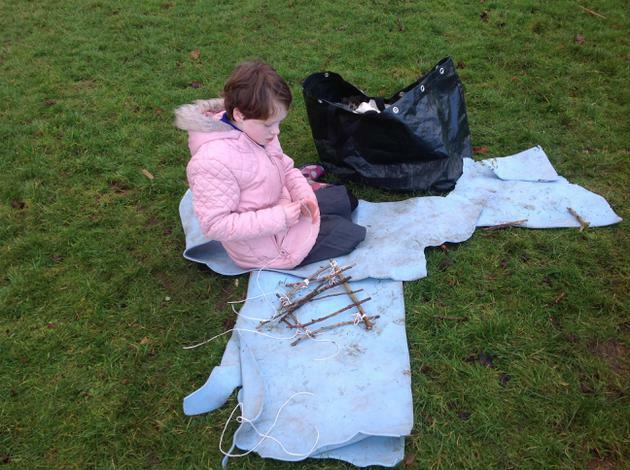 One child made her own Stone Age Skara Brae structure, she then used her addition and multiplication skills to find the area an the perimeter of her building. 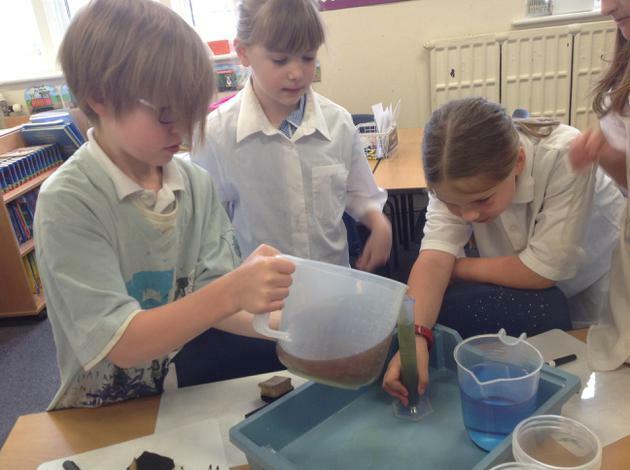 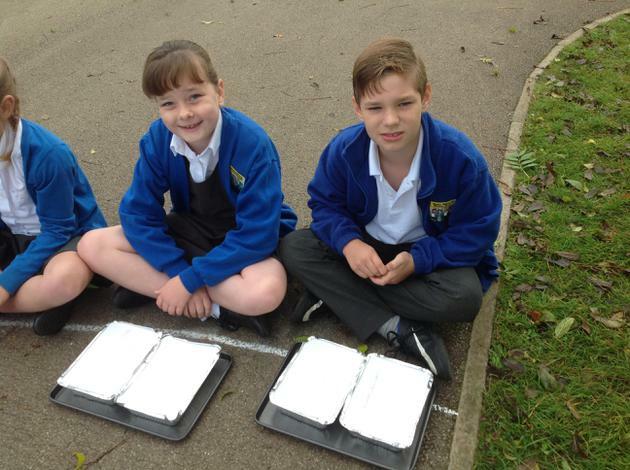 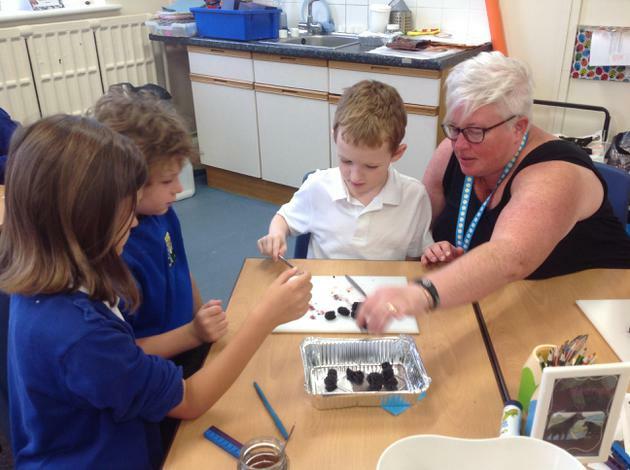 In our Science lessons this week, we have been considering how rocks change over time. 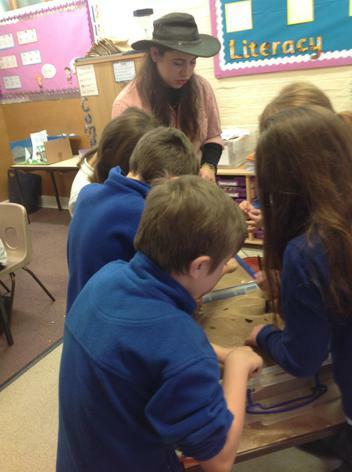 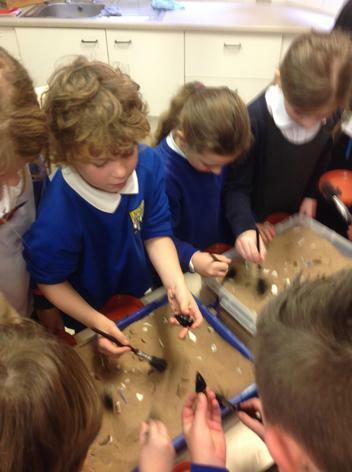 We learnt about both erosion and weathering and discussed their affects on different types of rocks. 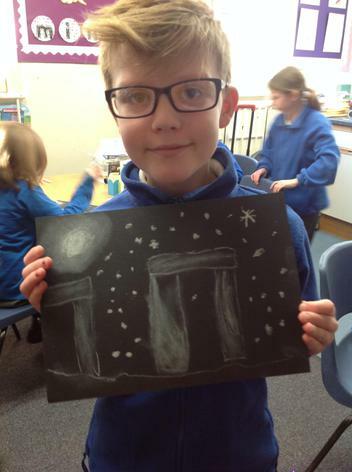 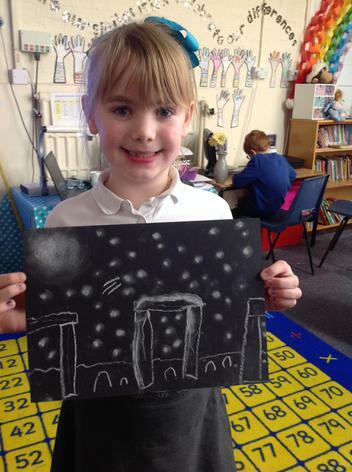 In History, we learnt about Stone Henge and it's many mysteries! 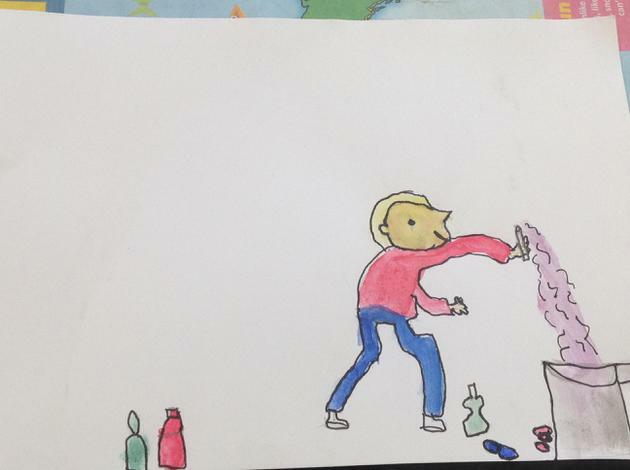 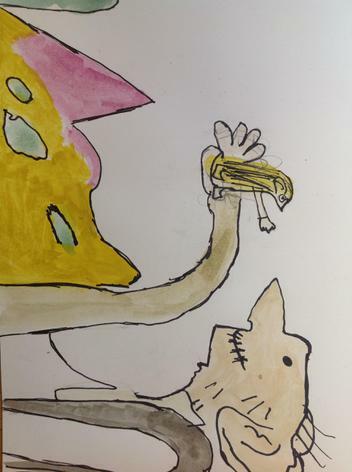 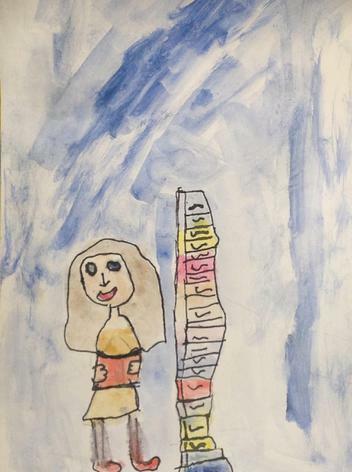 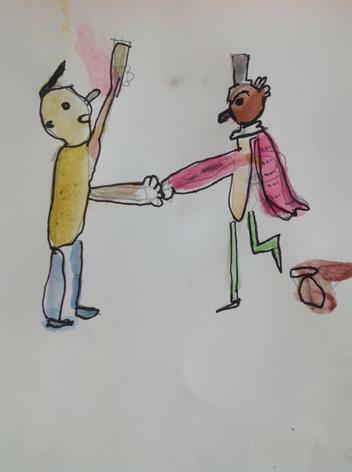 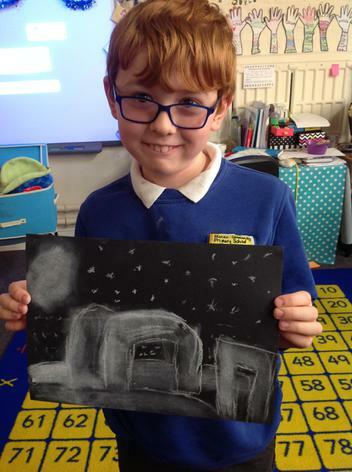 We created some lovely artwork based on this. 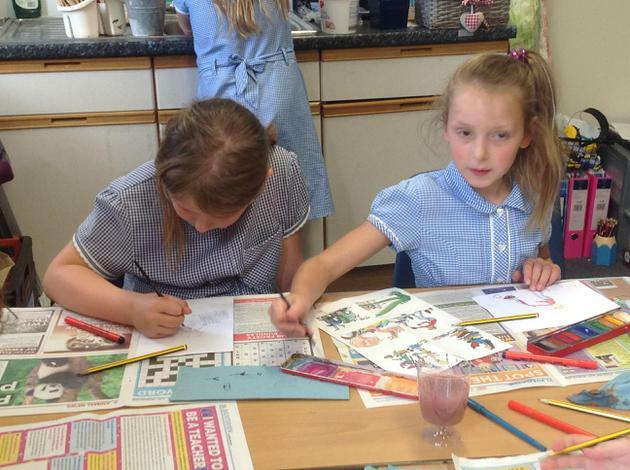 In our Art lessons, we have been looking at Pop Art. 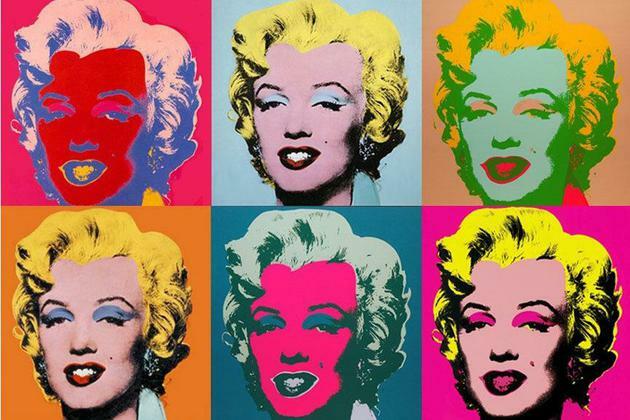 We have focused upon the artwork of Andy Warhol. 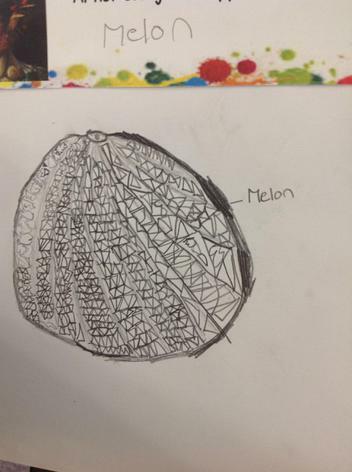 We discussed our opinions of his artwork and thought about why he choose to use the techniques that he did. 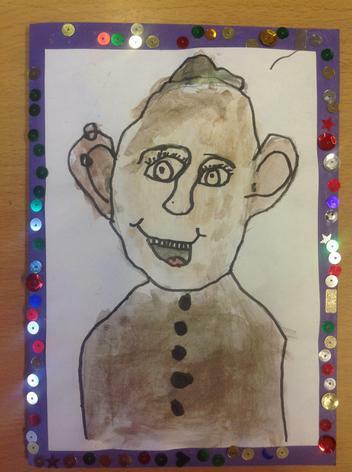 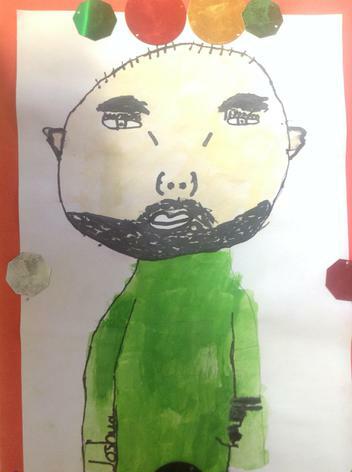 We then created some of our own versions using paint, pastels and felt tip pens. 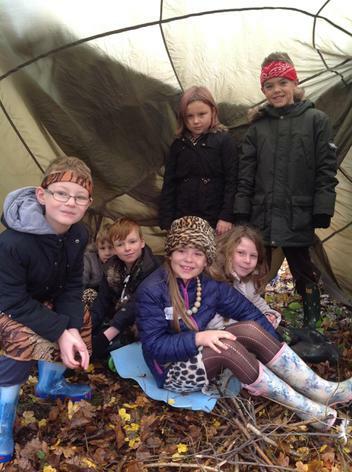 On Monday 20th November, the children in Year 3 and 4 arrived at school dressed like stone age boys and girls. 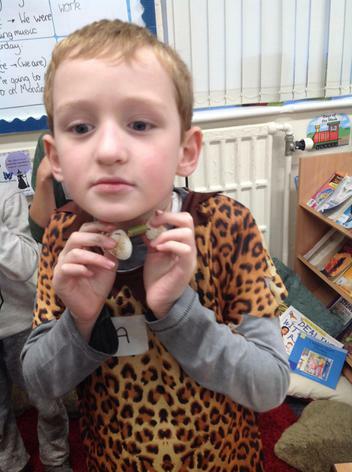 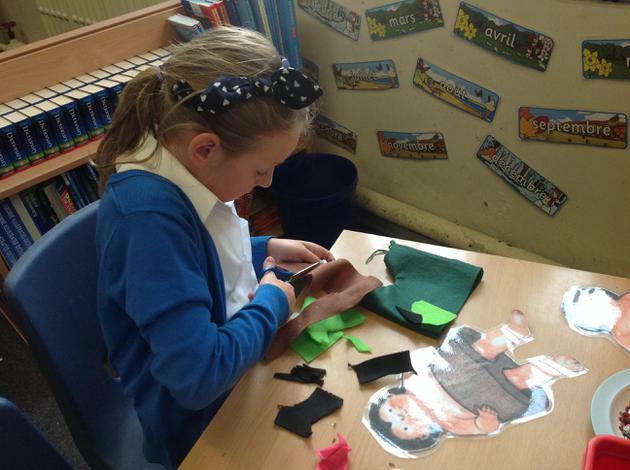 We all chose our own stone age names and used our imaginations to create our own character profiles. 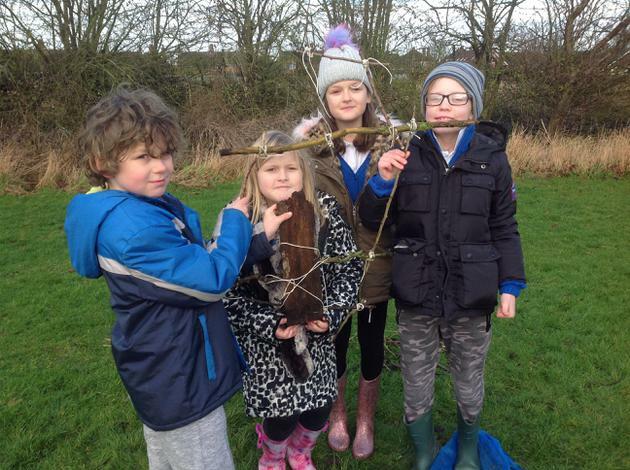 We were told that we had moved to Manea because wehad followed footprints of bison and woolly mammoths- and being hunter gatherers we move to where the food was. 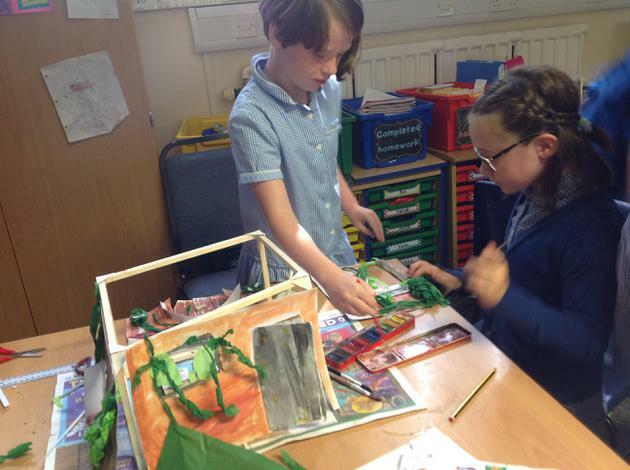 We considered why Manea would be a good place to build a settlement. 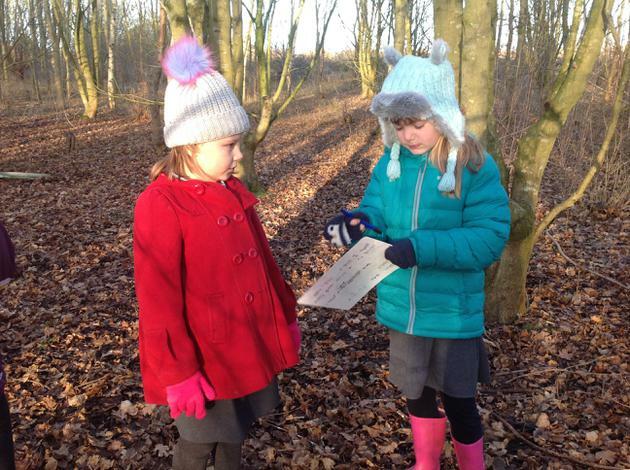 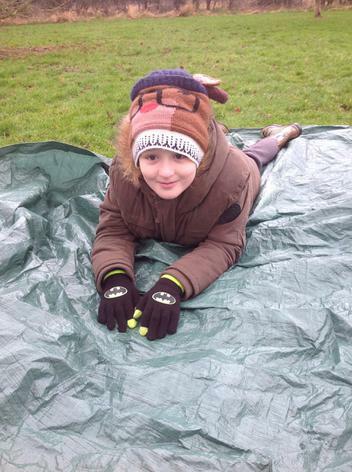 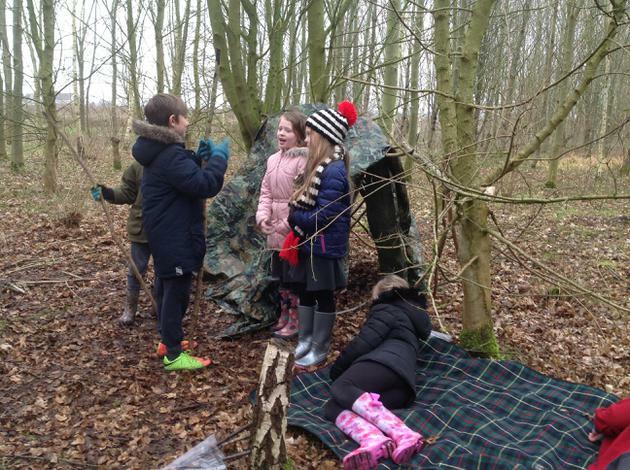 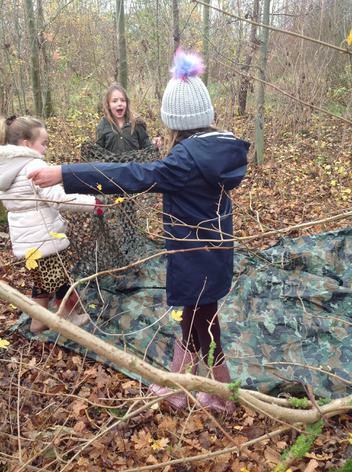 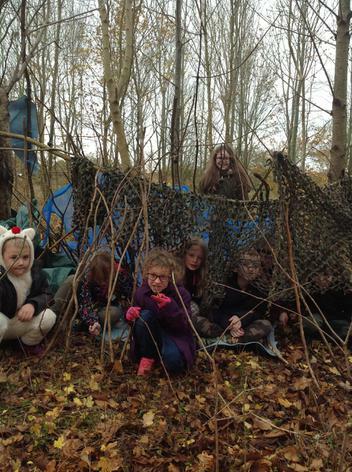 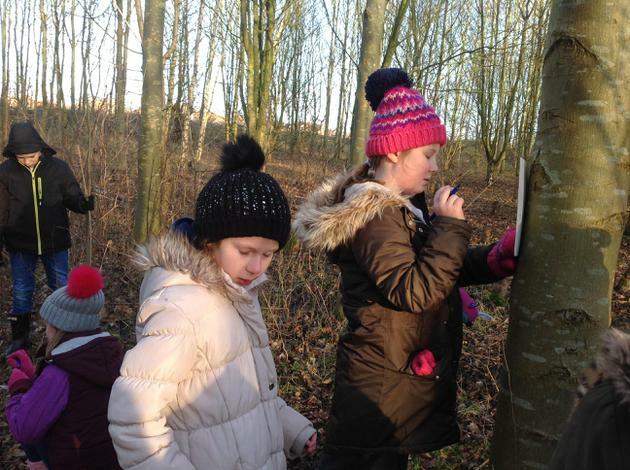 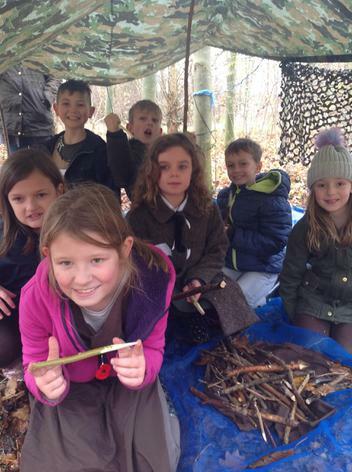 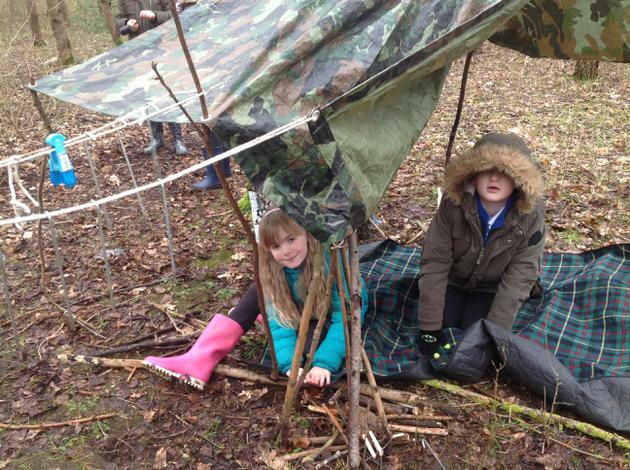 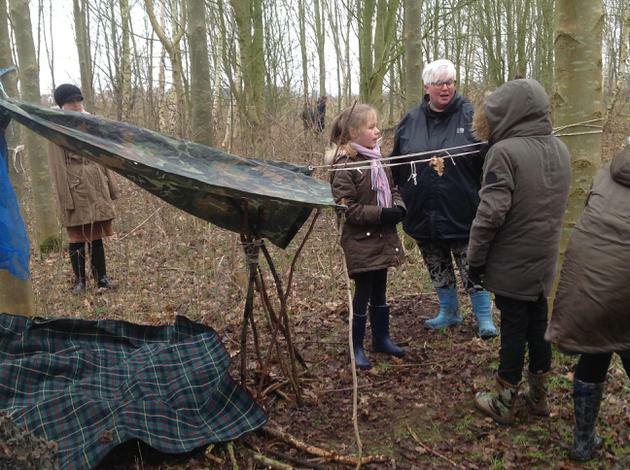 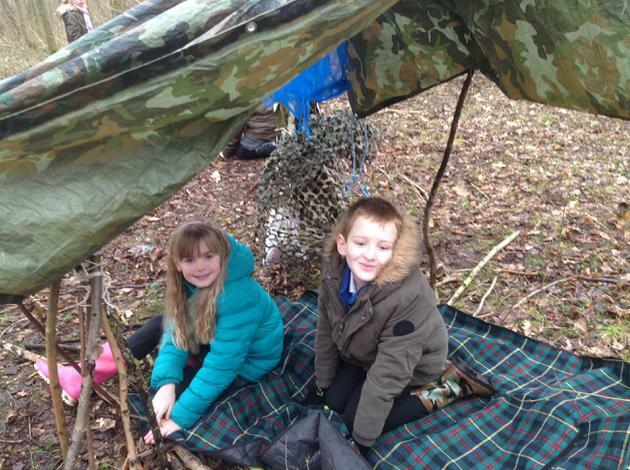 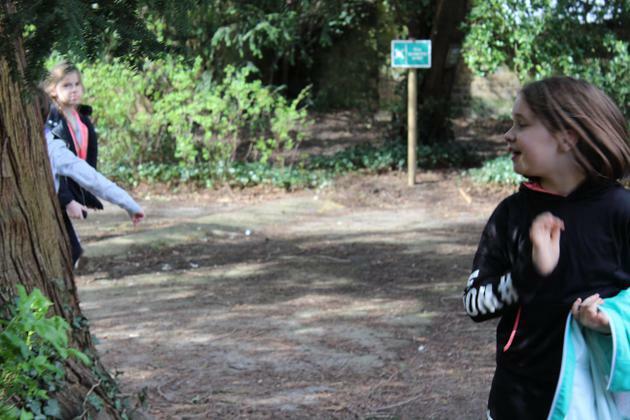 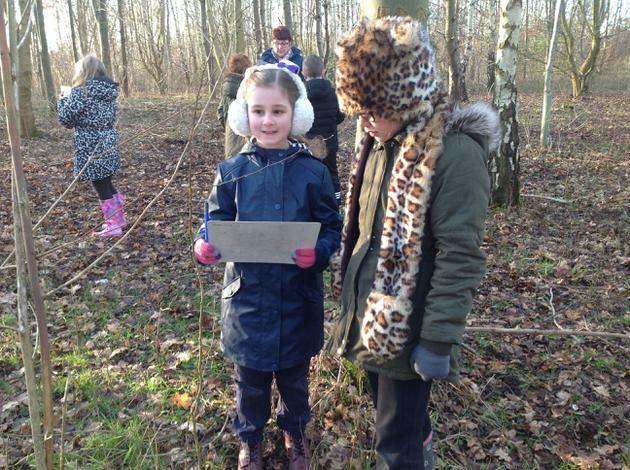 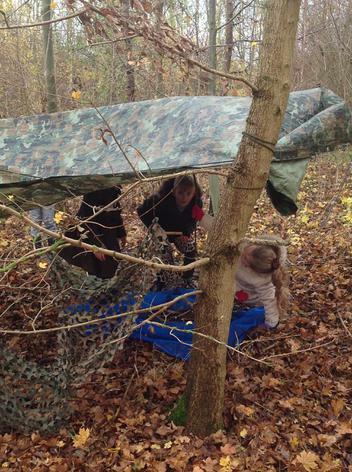 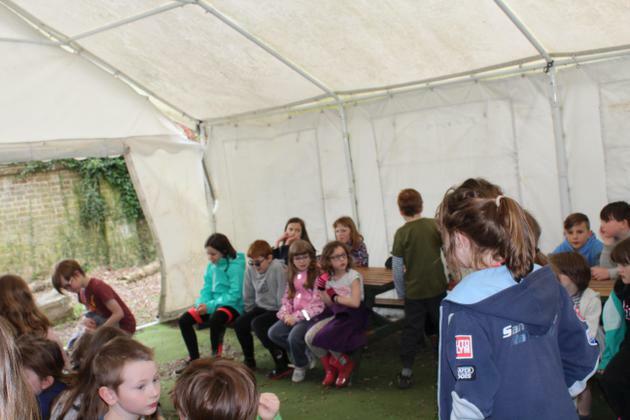 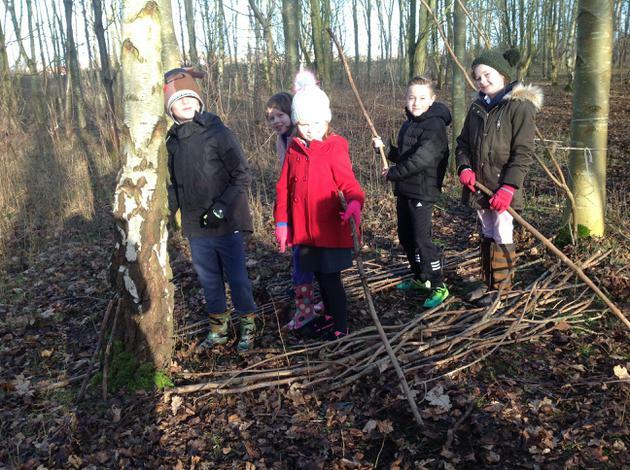 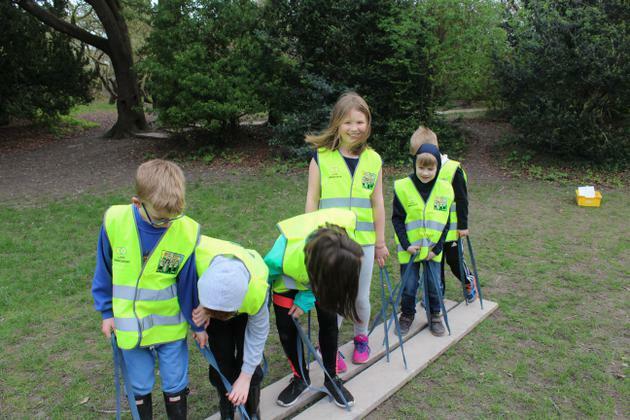 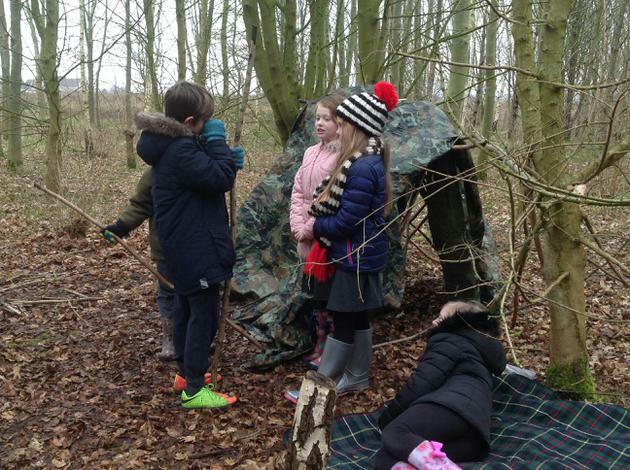 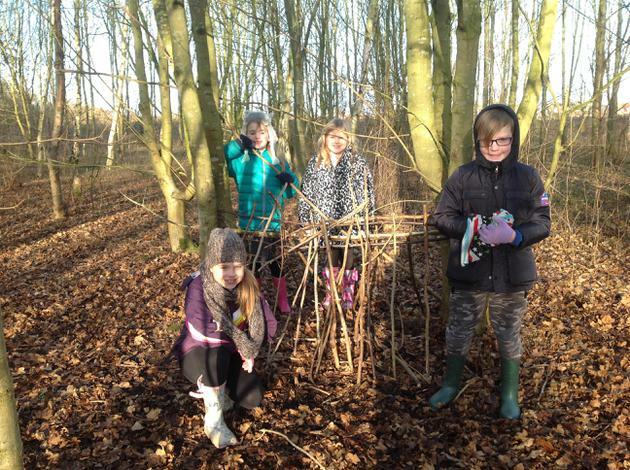 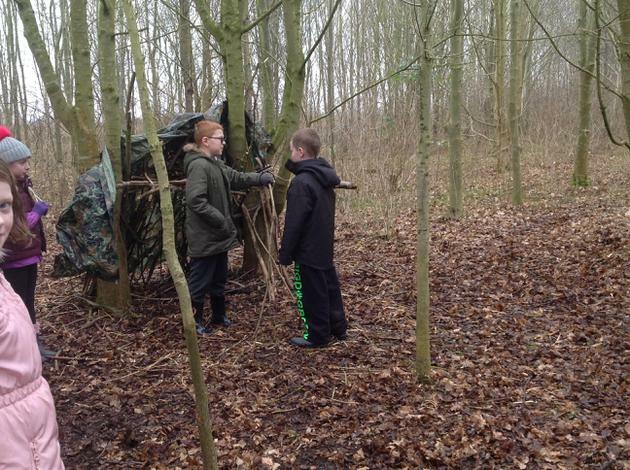 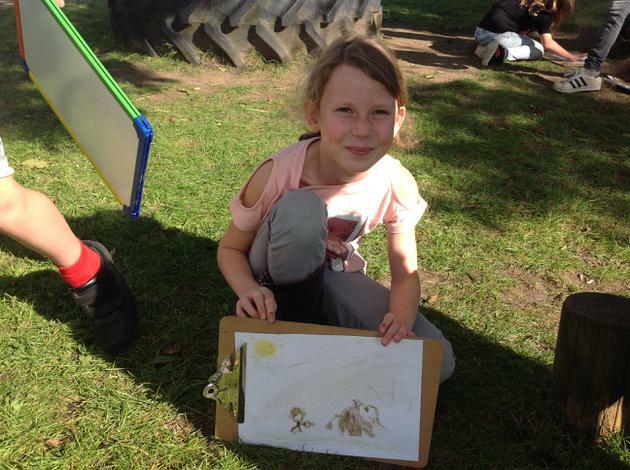 The children suggested things like lots of flat land, water and shelter in the woods. 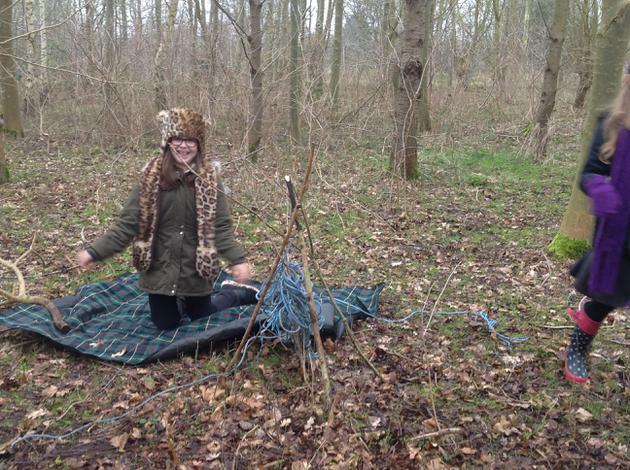 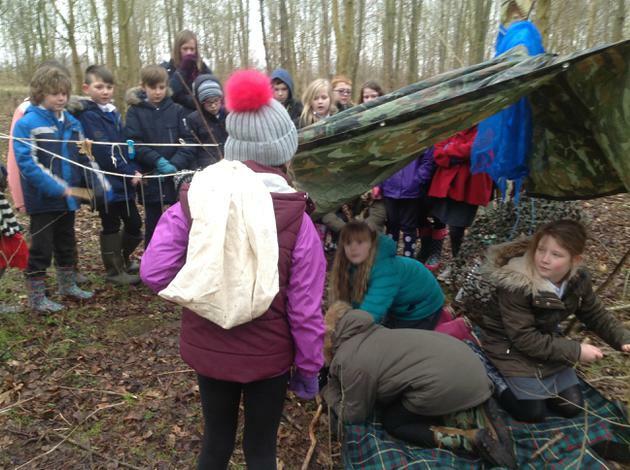 So off we set, to build our own shelters in the woods (we had to pretend the materials used were actually animal skins!). 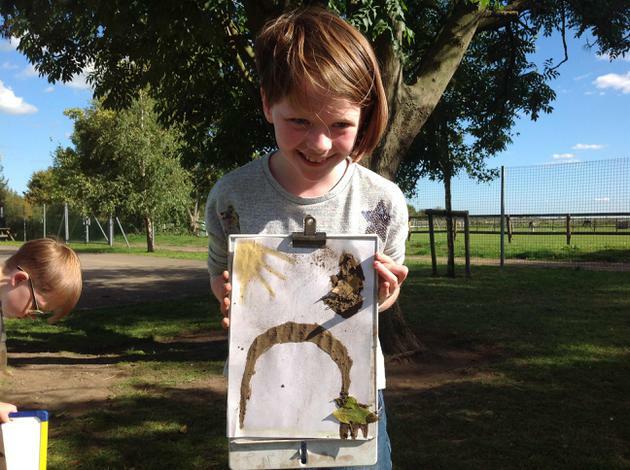 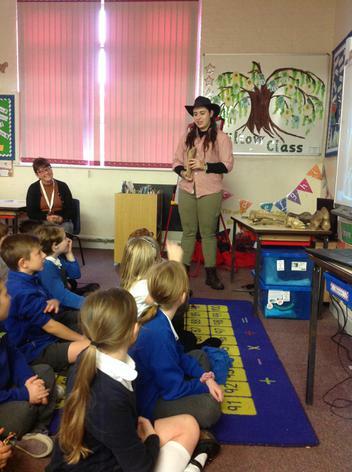 Whilst we were there, we also spoke about Stone Age weapons and thought about how we would hunt these animals. 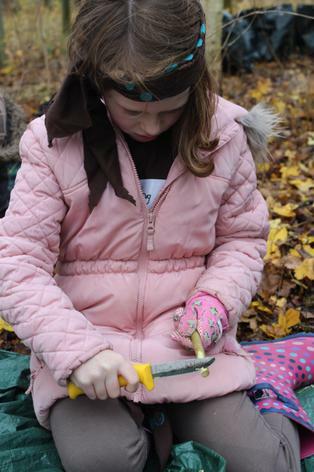 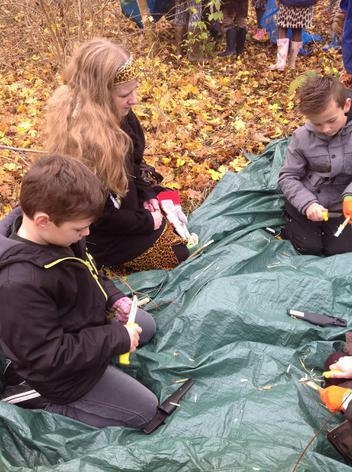 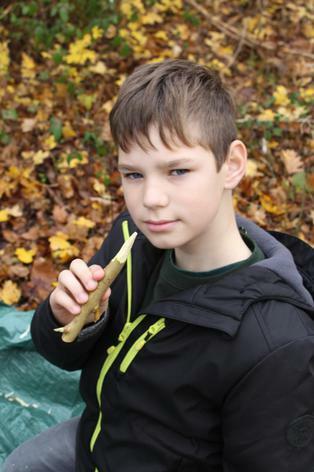 We found out that people on the Stone Age would use sharpened flint to make tools- we used the knives to create the same effect when making our very own spears. 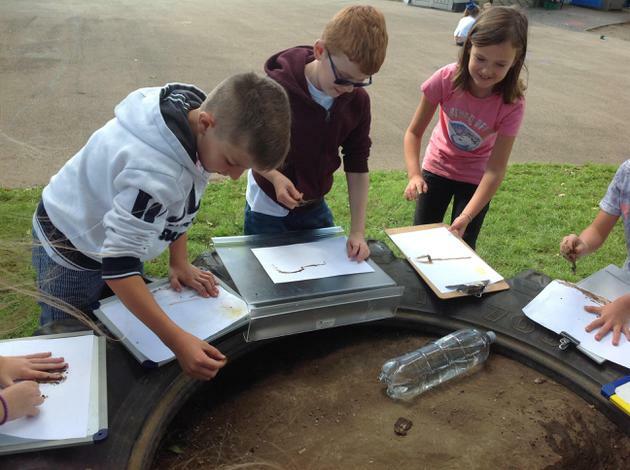 Back at school, we went hunting! 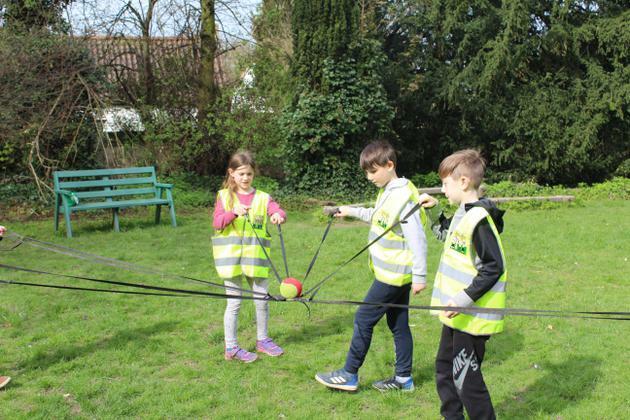 In the afternoon, there were two activities for us to complete. 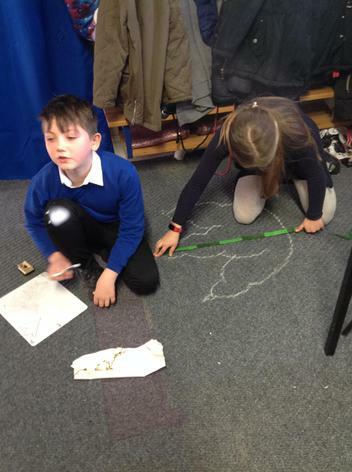 The first required us to write a diary entry using simple pictures and symbols with charcoal- but we had to lay under the tables to do this! 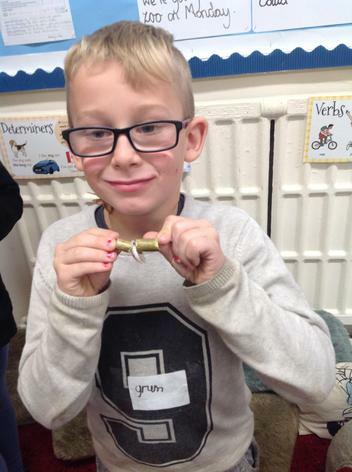 The second, was to make Stone Age jewellery. 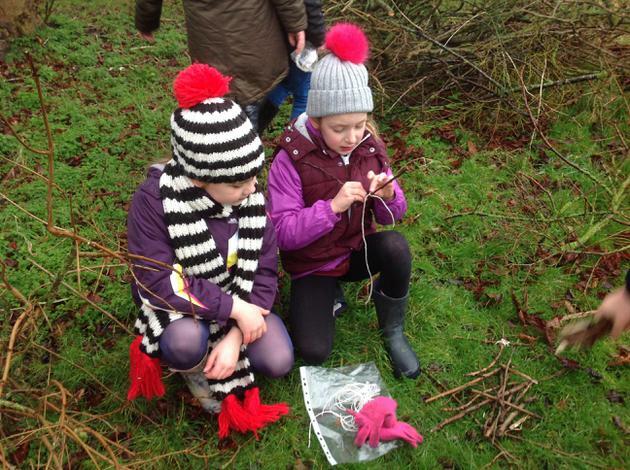 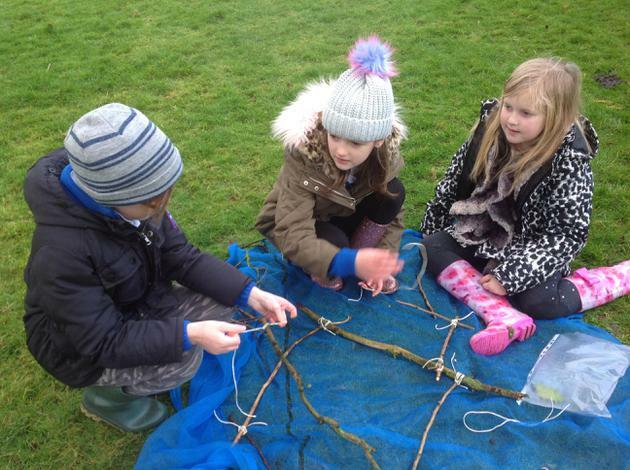 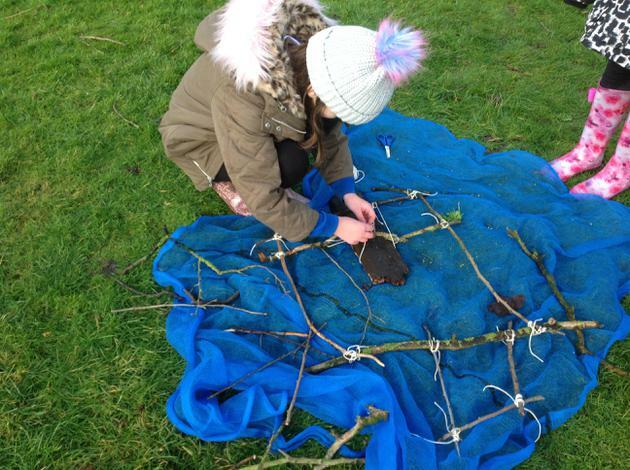 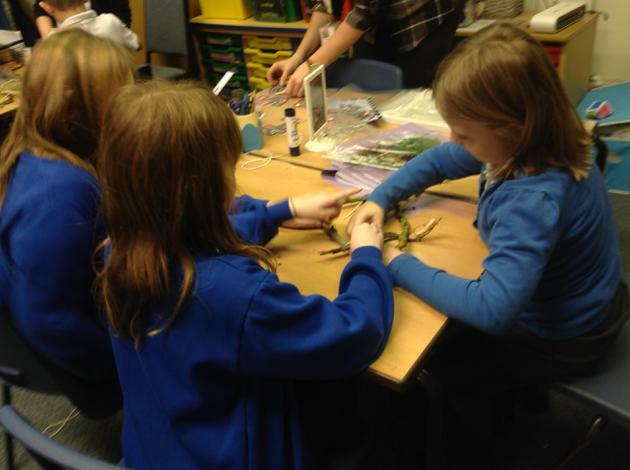 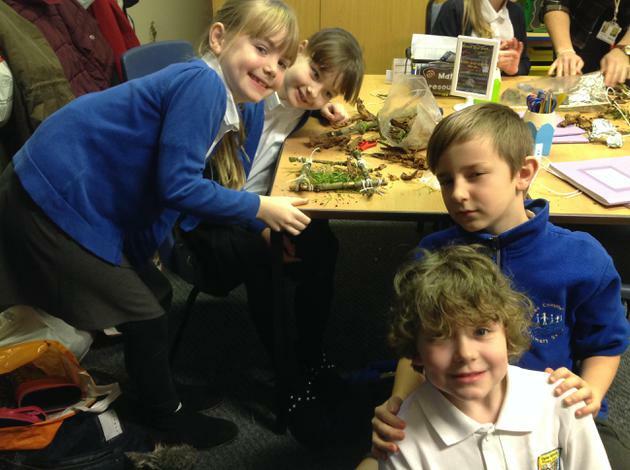 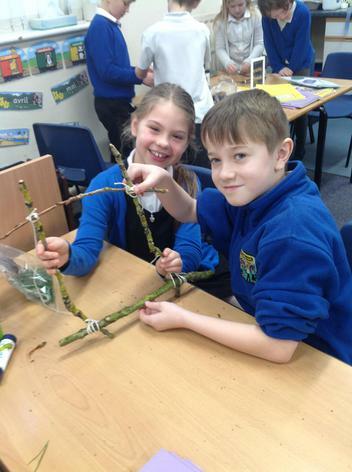 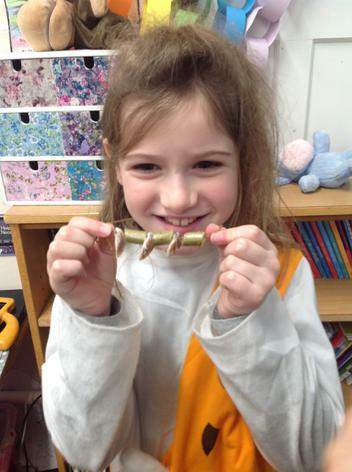 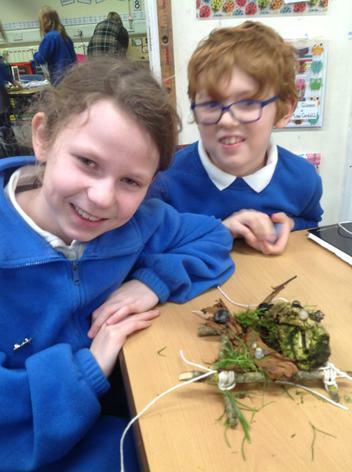 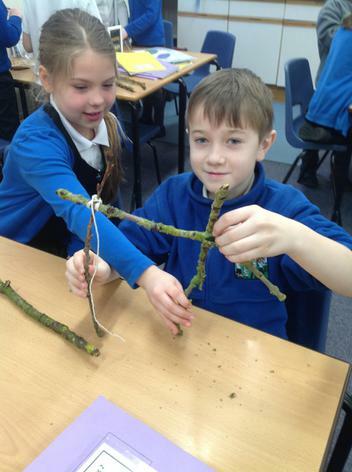 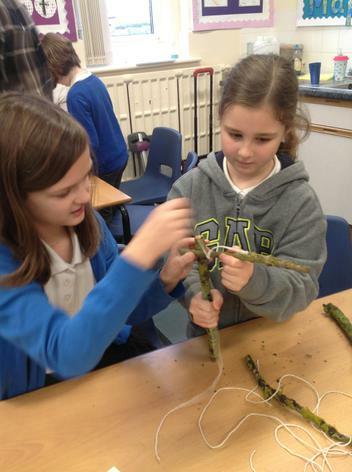 We hollowed out willow to create beads and threaded shells onto string. 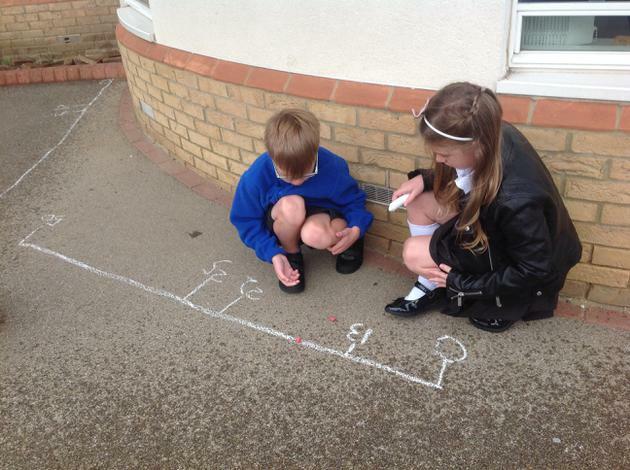 We also used the shells to do some Maths. 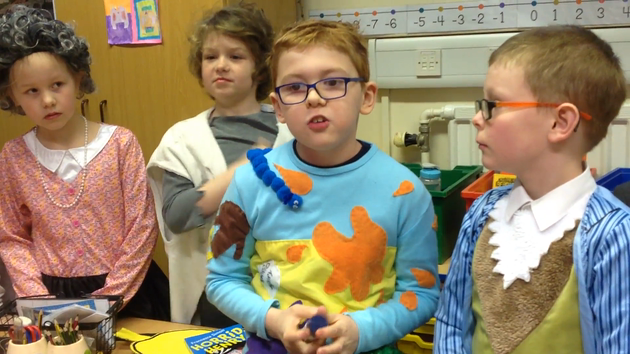 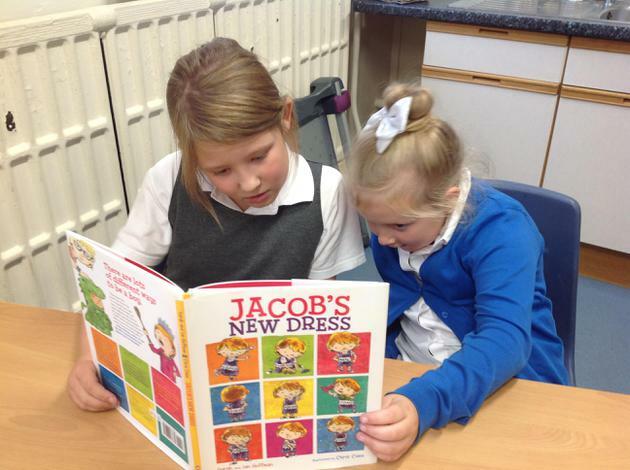 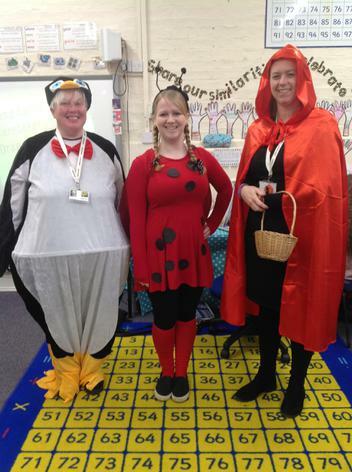 This week, we have been celebrating differences! 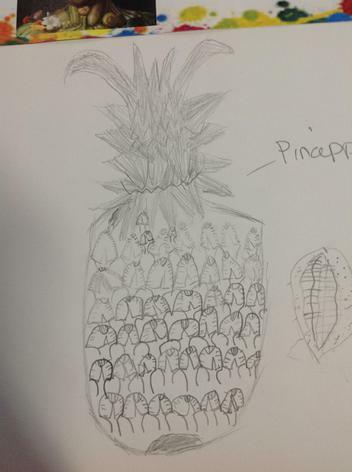 We have thought about what makes us special and unique. 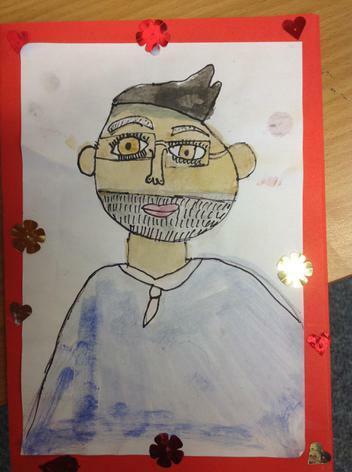 We also looked at different types of families and realised it doesn't matter what our family looks like as long as it's filled with love and happiness! 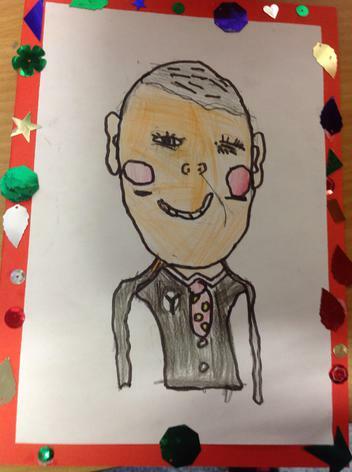 We thought of what family meant to us, some children said "They look after me when I'm ill" and "They make hot chocolates!". 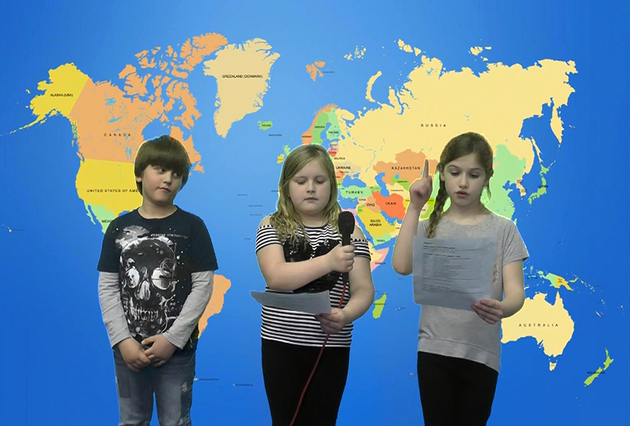 In addition to this, we watched a range of videos that showed some people being pushed away because of their differences- this led to a lot of interesting discussions and two new displays for our classroom. 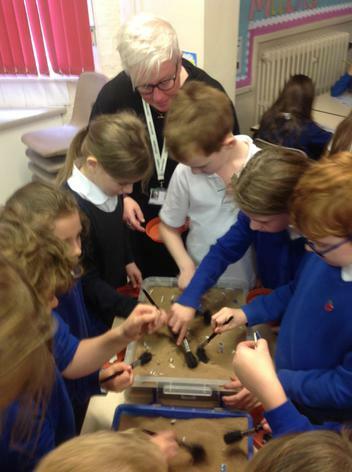 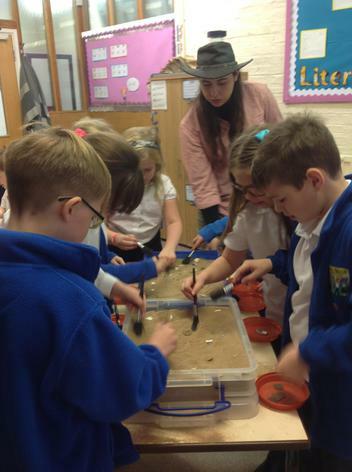 After counting down the days for weeks, Thursday was the day that we finally had a visit from Fossils Galore. 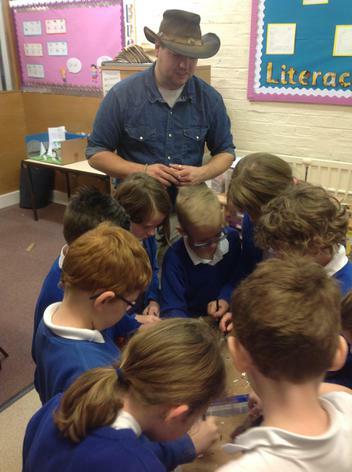 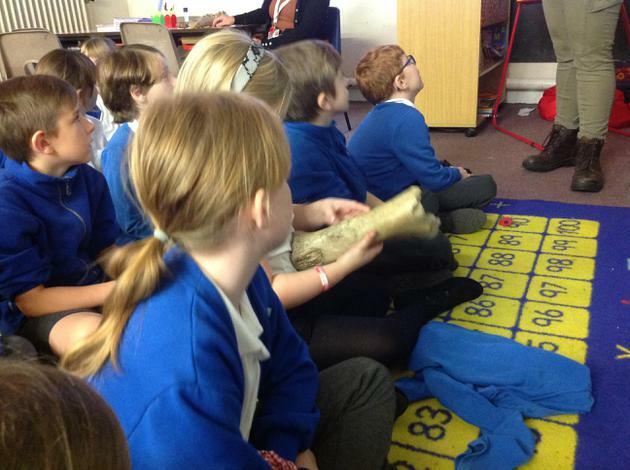 We met Jamie and Sarah, who showed us a range of fossils and giant bones. 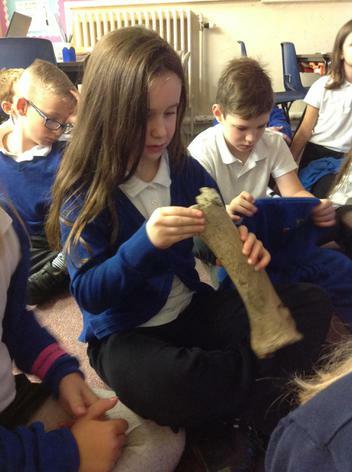 They also told us lots of new facts about how humans developed during the stone age, we were surprised to find out that the tallest man would have only been around 4 ft and that they used shells and bones as money! 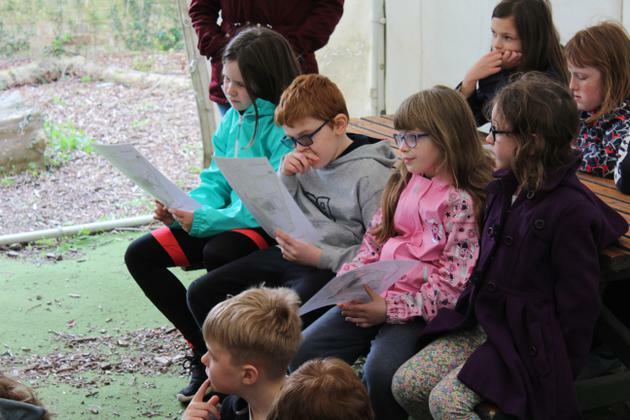 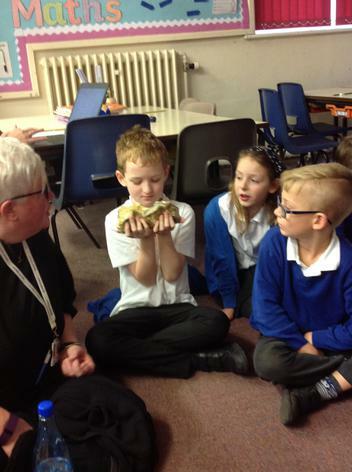 We also learnt lots of interesting facts about stone age animals and had the opportunity to ask some of the questions that we had e.g. 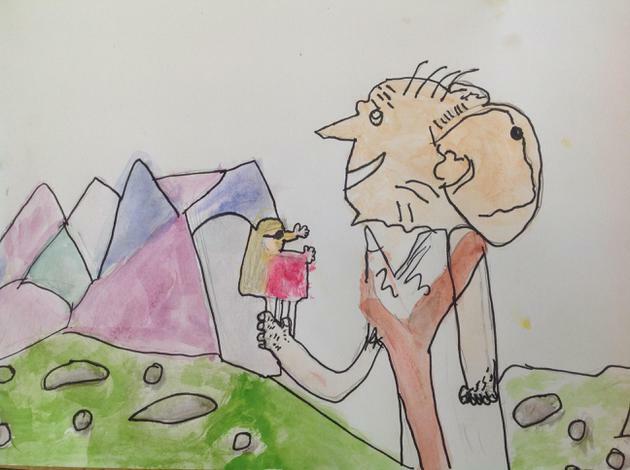 'In a fight, who would win: a modern day lion or a cave lion?'. 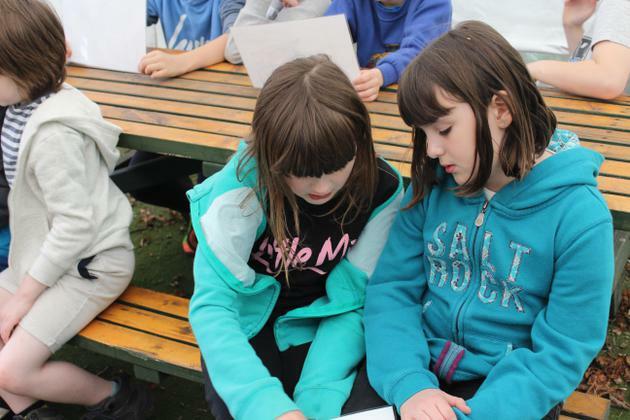 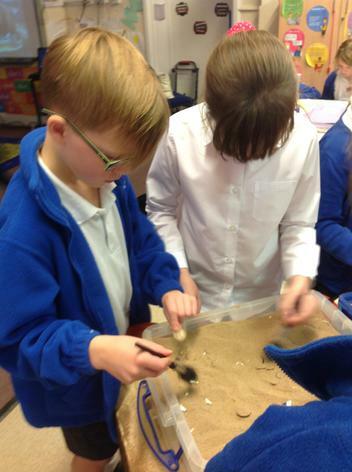 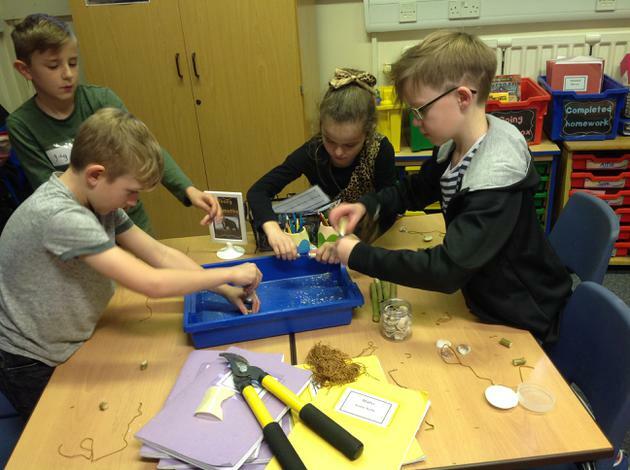 Sarah and Jamie also helped to understand how fossils are discovered and we got to search for different artefacts in sand. 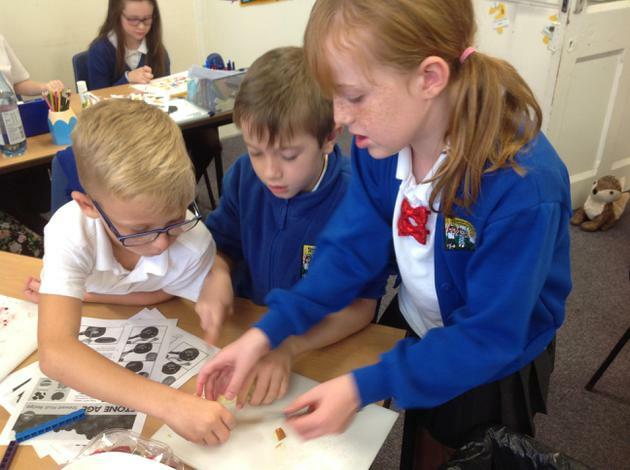 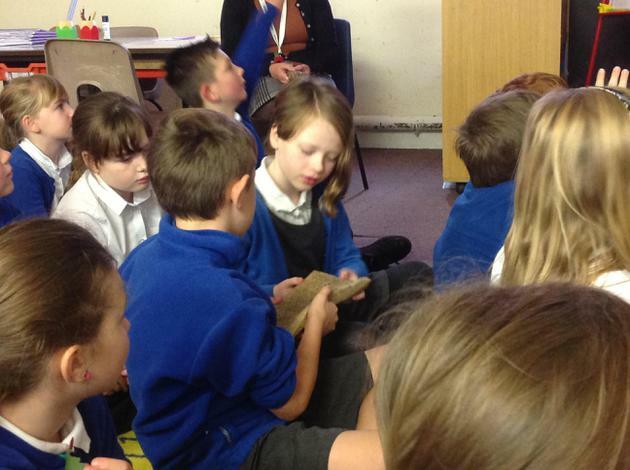 On Friday, we discussed what we had learnt about fossils and how they are formed. 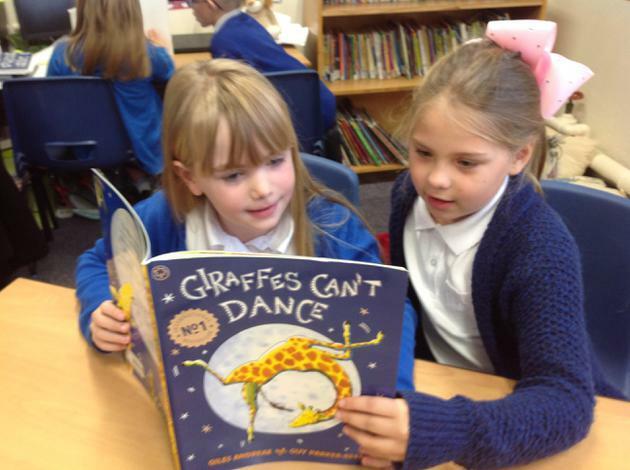 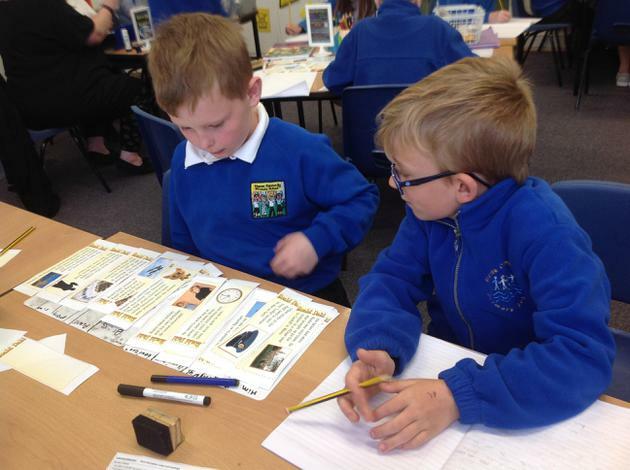 We also thought about all of the facts which we had discovered about Stone Age animals. 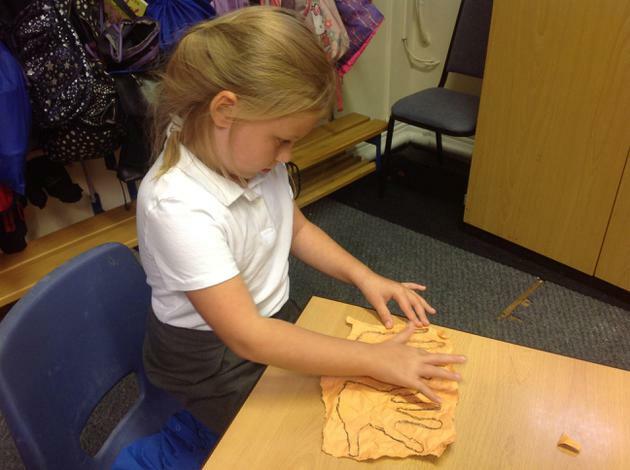 We put all of this information together and created our own Stone Age fossilised footprints out of clay! 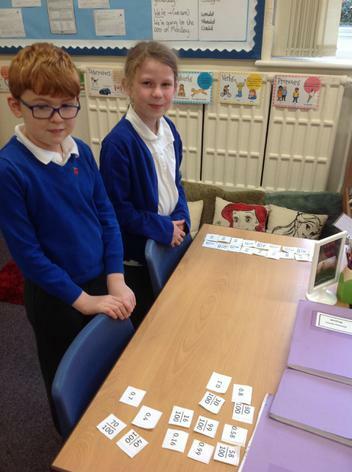 This week, we have been discussing place value. 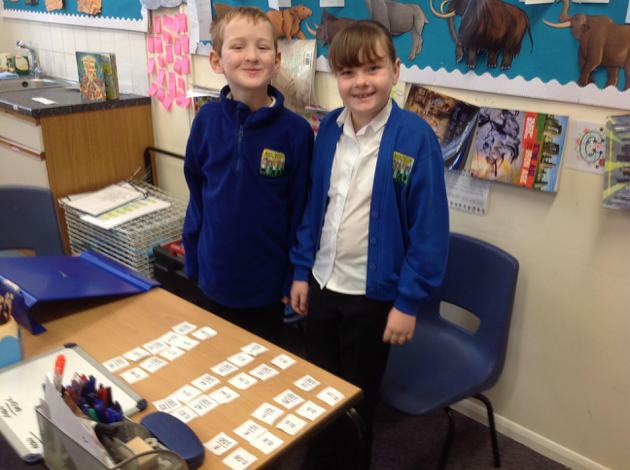 We learnt about decimals and identified tenths and hundredths as pictures, fractions and decimals. 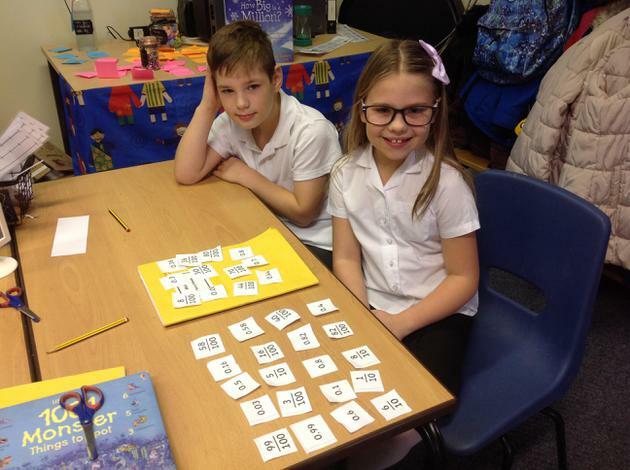 On Thursday, we played a game of pairs where we had to match the fractions to the decimals (some of us got very competitive). 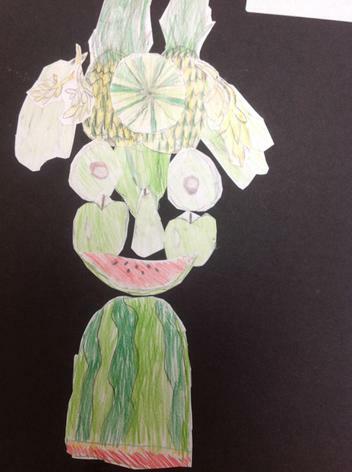 As we are in the season of harvest, we have been studying the artist Giuseppe Acrimboldo, who created portraits out of fruits and vegetables. 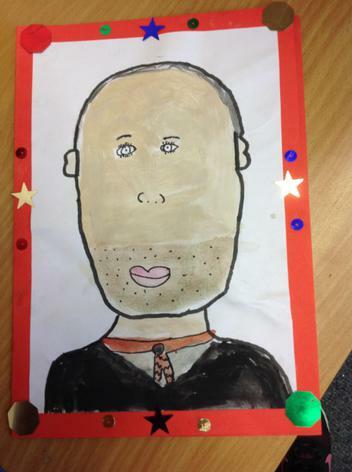 Some of us thought this were very clever- but also quite funny. 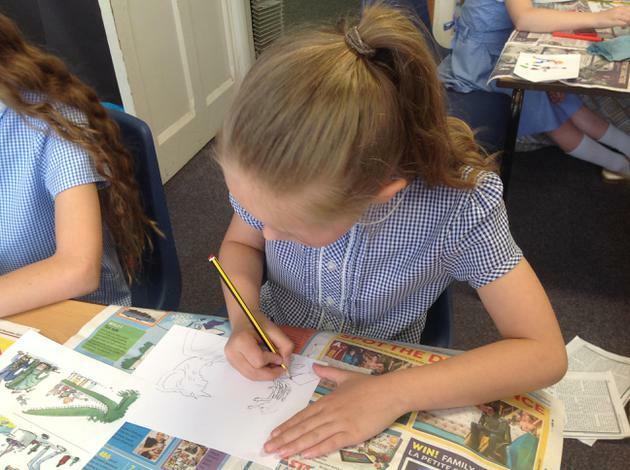 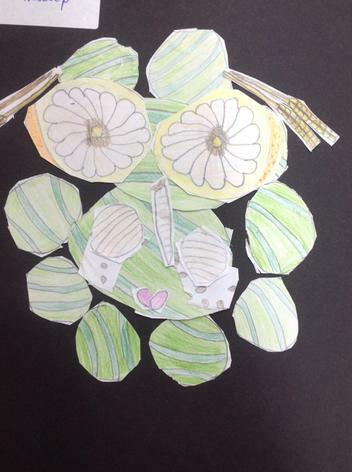 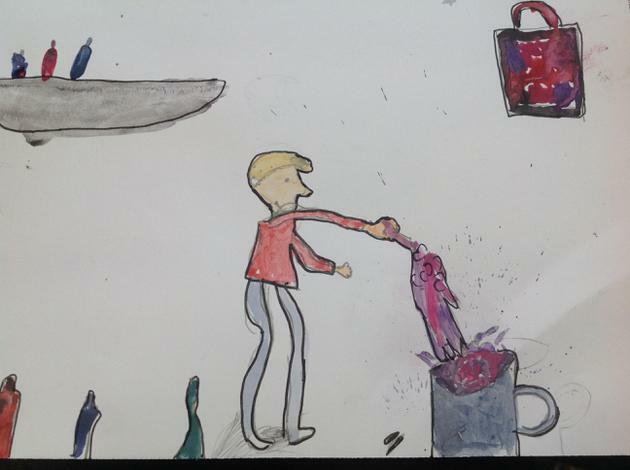 We have been creating some of our own versions, using everything that we have learnt about shading and colour. 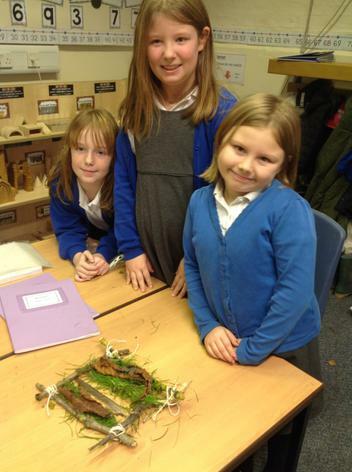 In our Music lessons, we have been thinking about how to create a Stone Age cave scene using music. 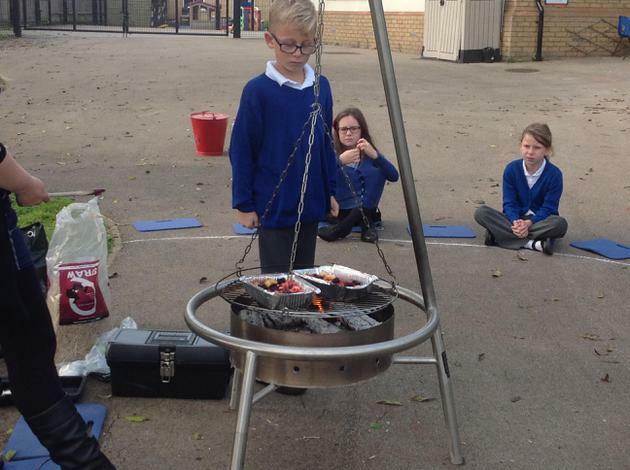 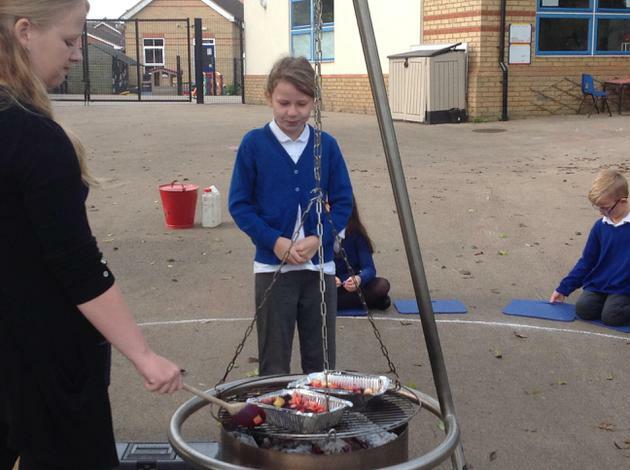 Last week, we used instruments to create sounds such as dripping water, roaring fires and animal footsteps. 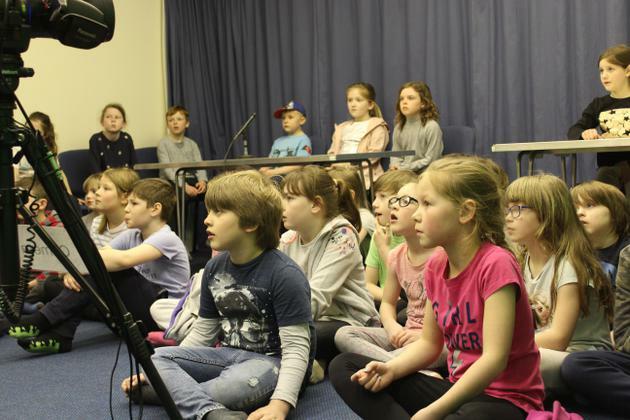 This week we used the keyboards to add a backing track. 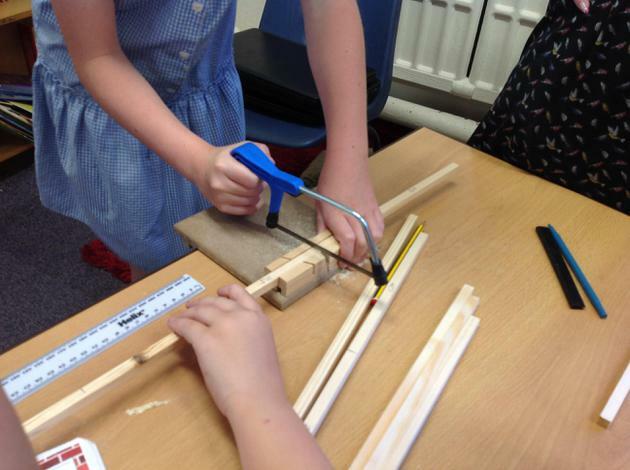 We can't wait to put it together next week. 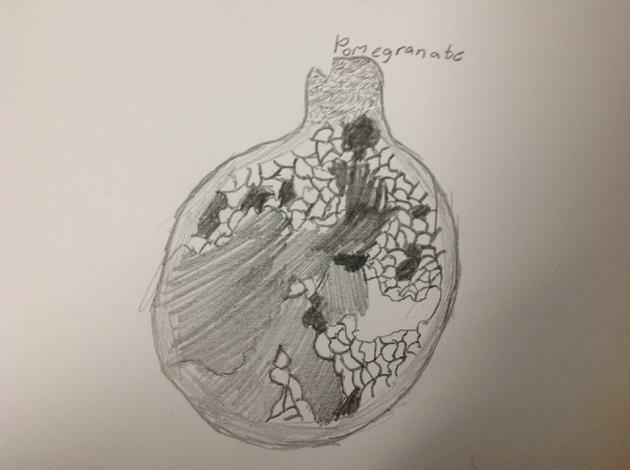 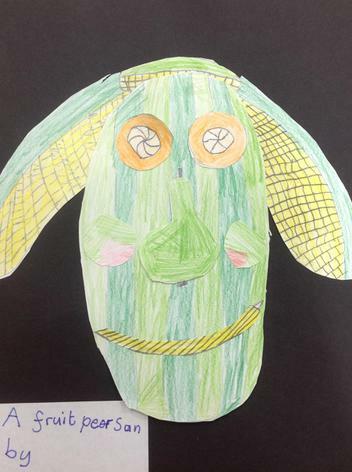 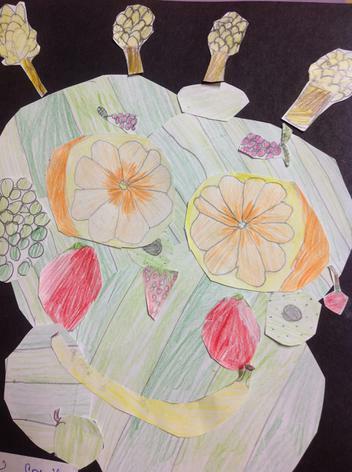 As we are in the harvest season, we have been looking at creating art with fruits and vegetables. 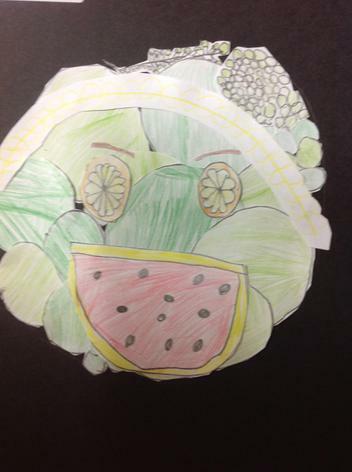 On Wednesday, we looked at the work of Giuseppe Arcimboldo. 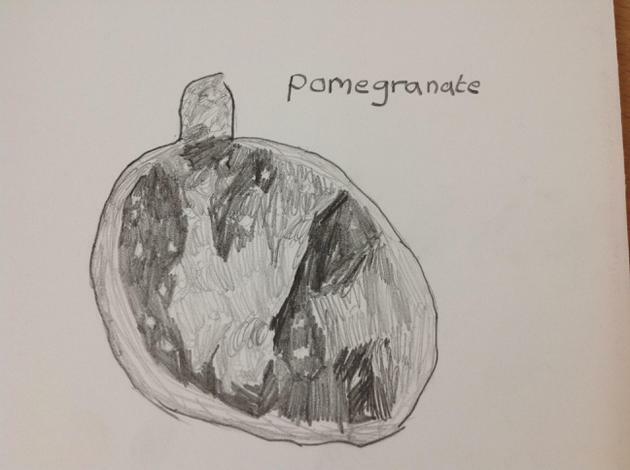 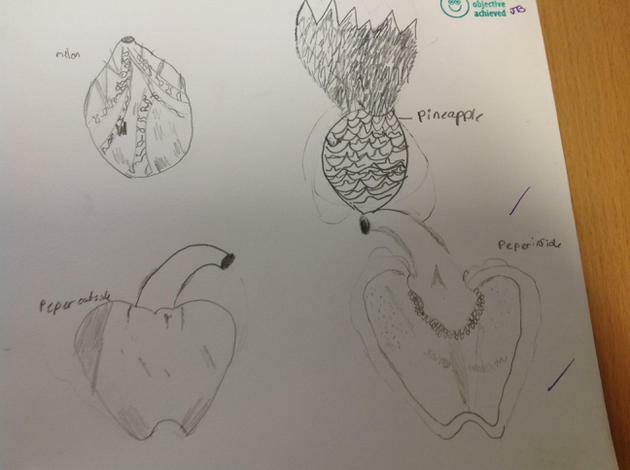 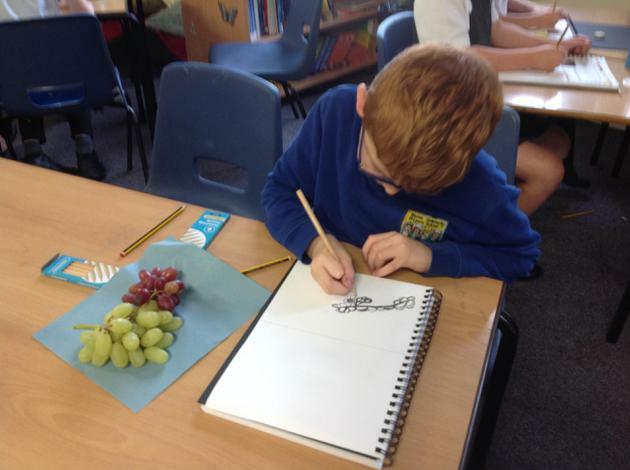 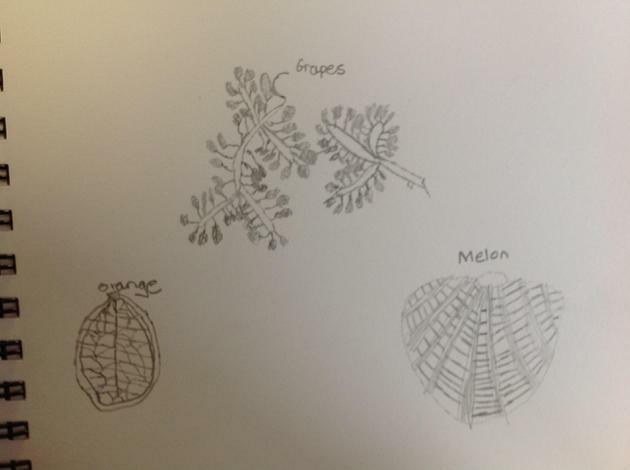 We then practised sketching different fruits using a range of pencils. 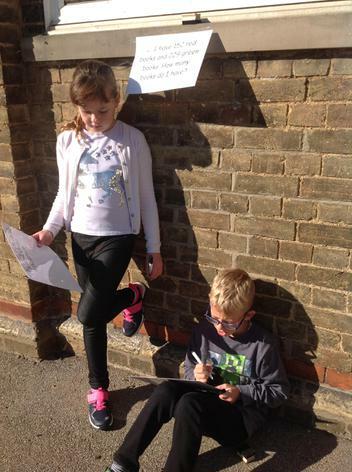 We think our work is really effective. 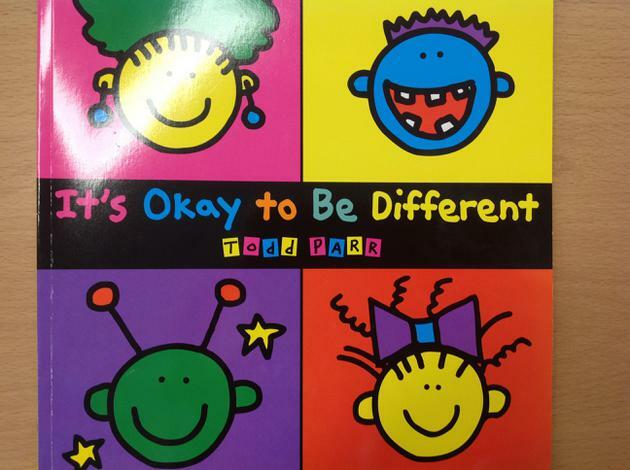 This week we have thought about how everybody is different and we decided it was a great thing! 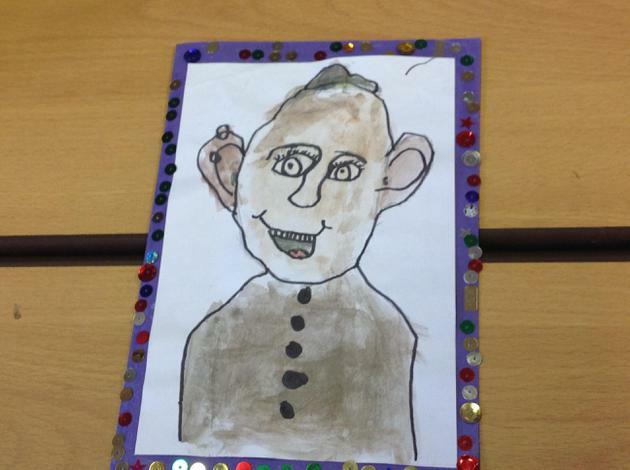 We spoke about different stereotypes and how they didn't apply to our class e.g. 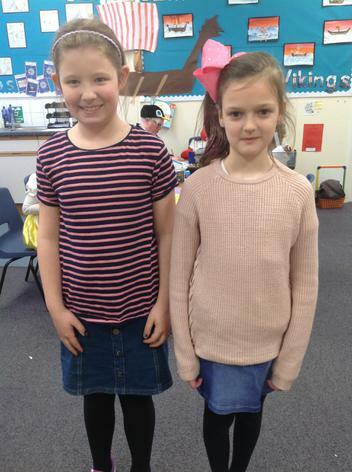 boys always love football and girls always like the colour pink. 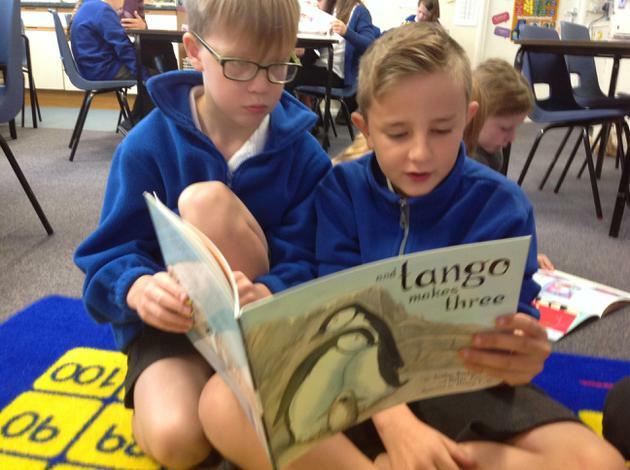 We also discussed different families and relationships and read stories such as "Worm loves worm" and "Tango makes three". 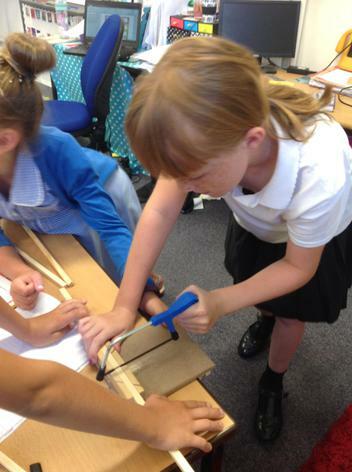 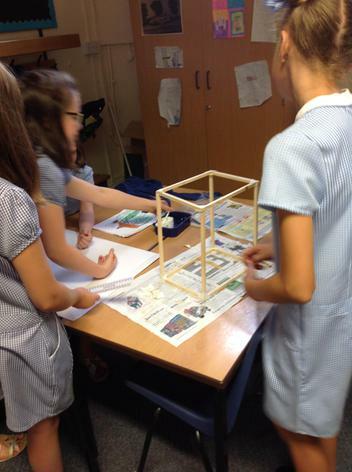 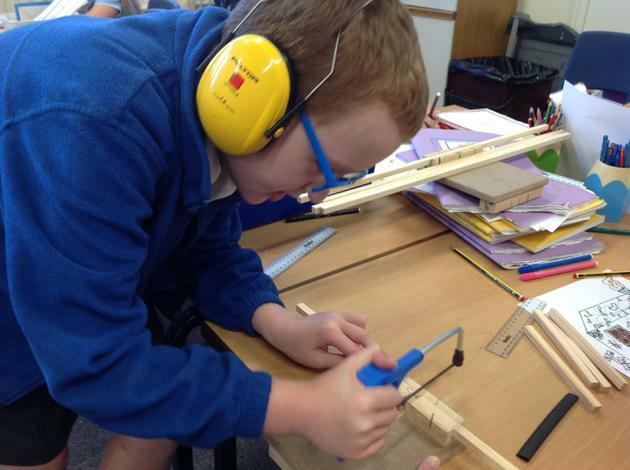 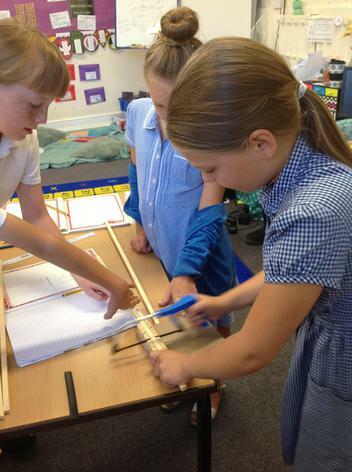 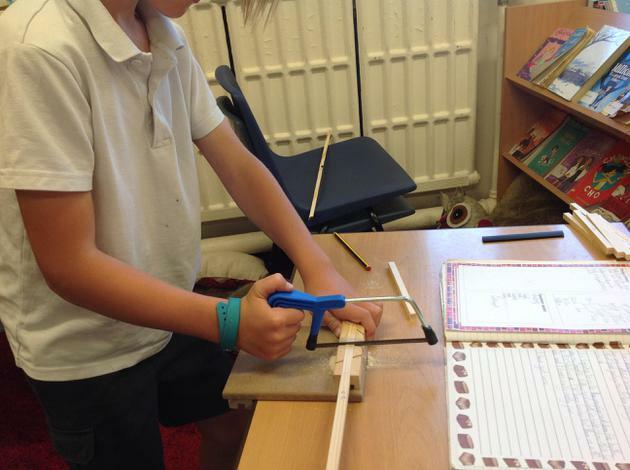 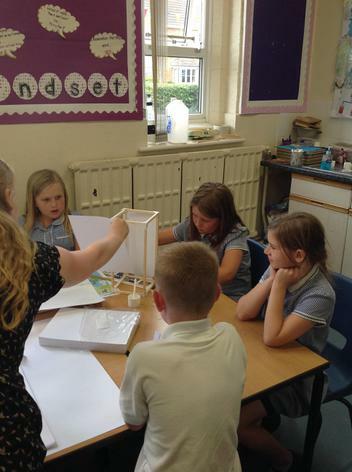 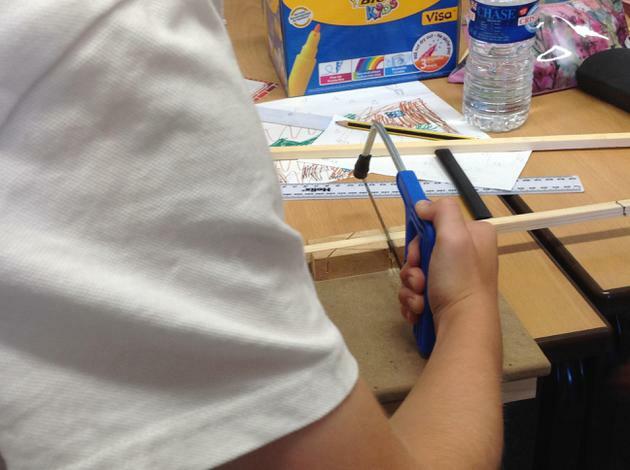 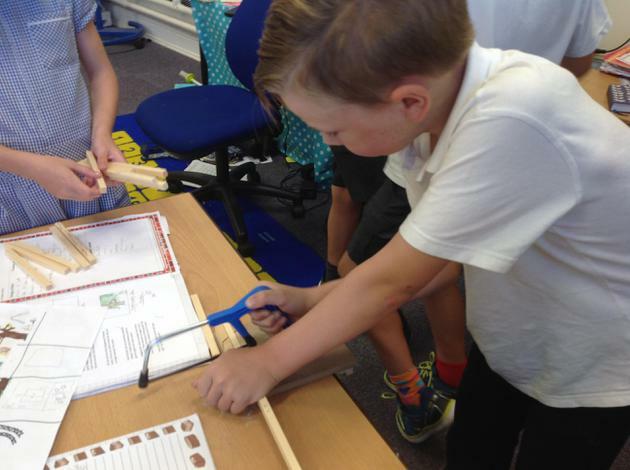 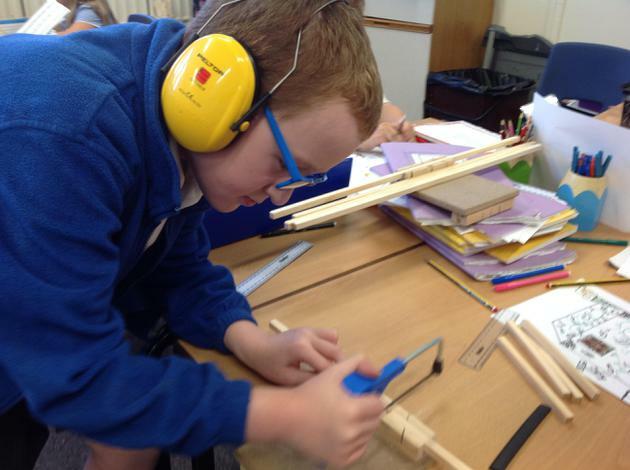 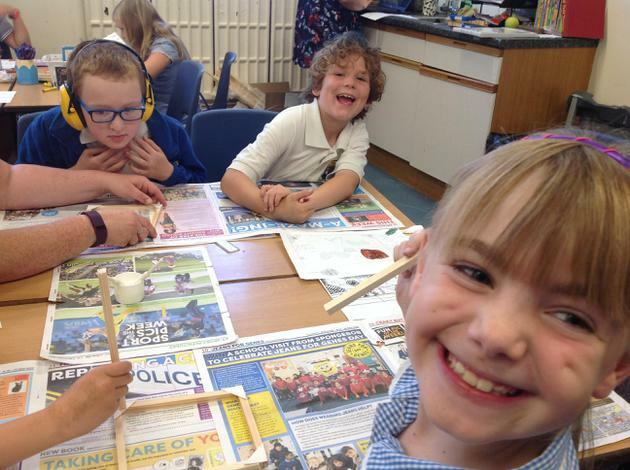 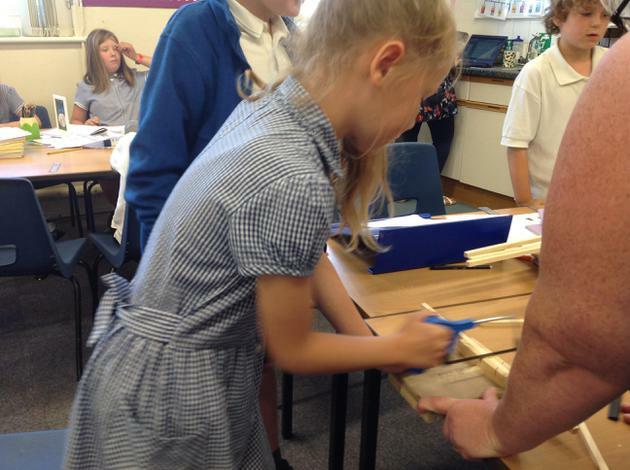 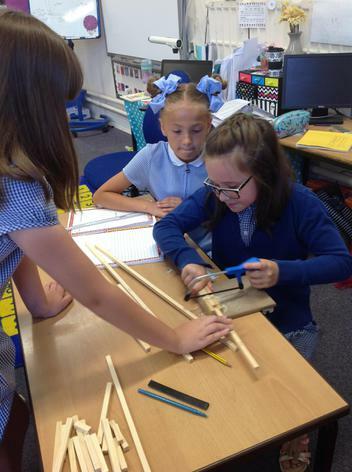 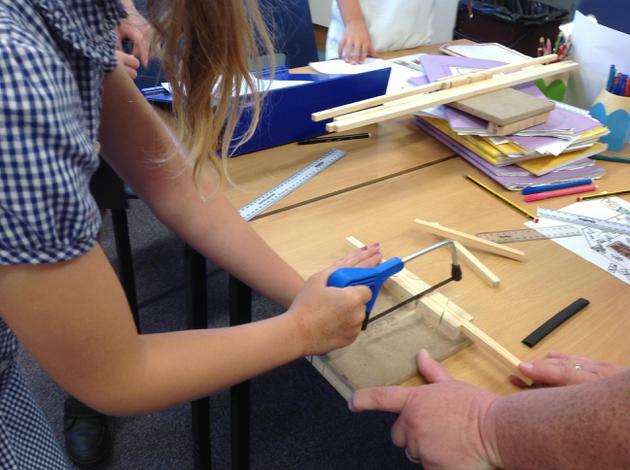 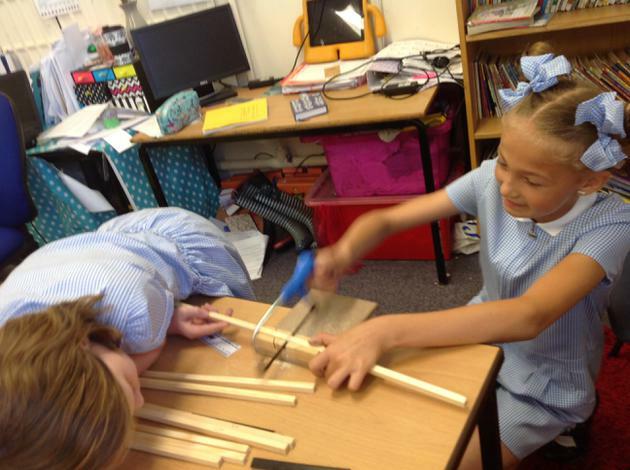 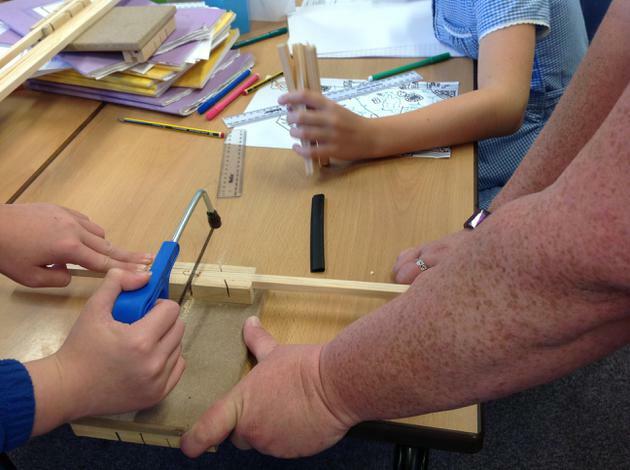 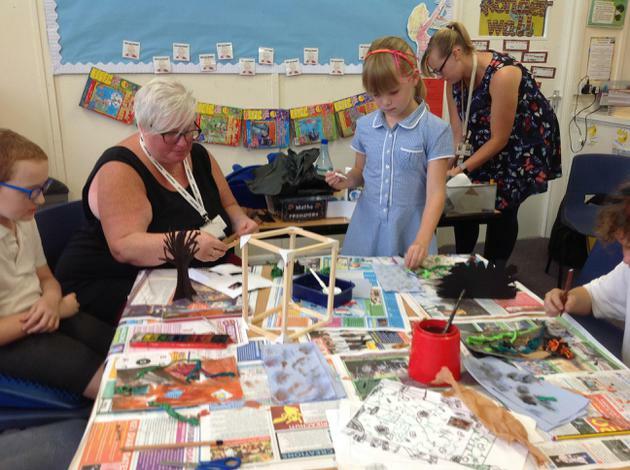 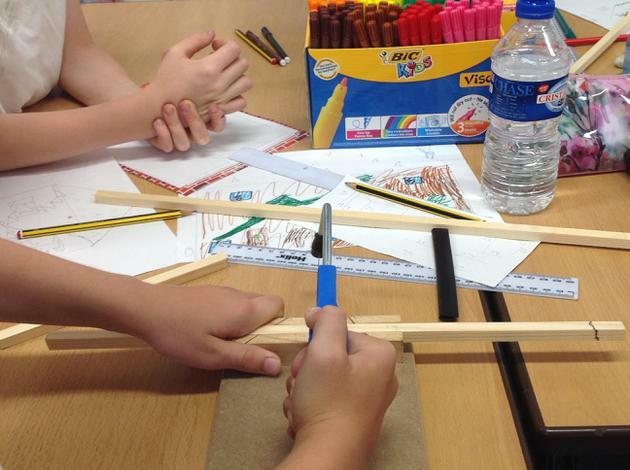 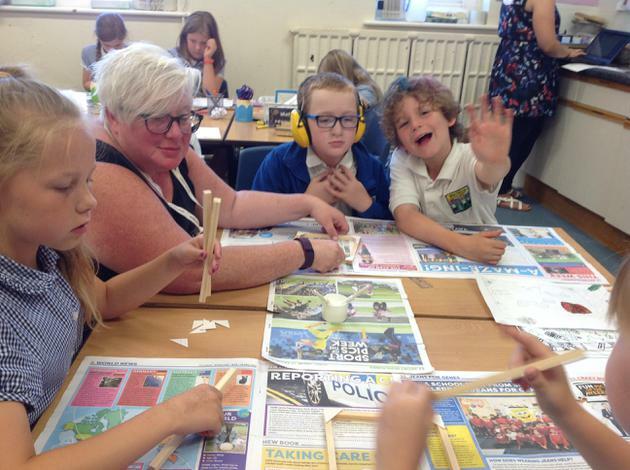 We have had a fabulous week this week completing challenges to develop our skills of designing, making and evaluating. 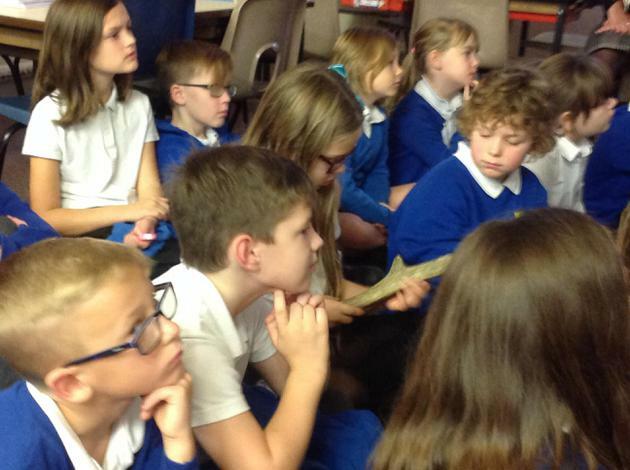 All of our challenges were based around the book 'Ug' by Raymond Briggs. 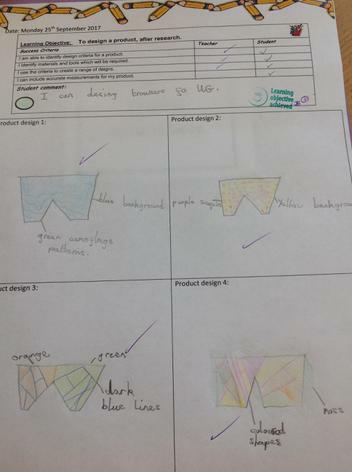 We started this challenge by completing market research to help develop our design criteria for our products. 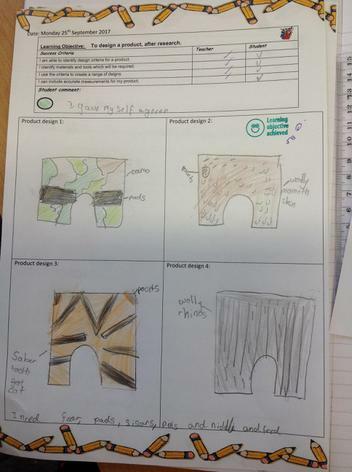 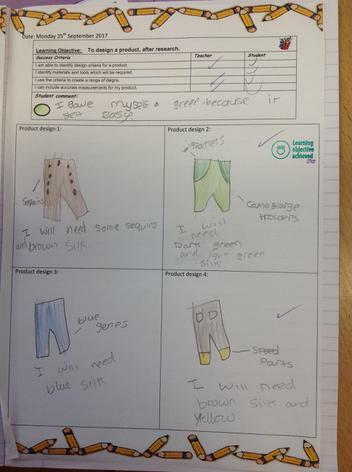 We then designed four new pairs of trousers and asked our classmates to vote for their favourite. 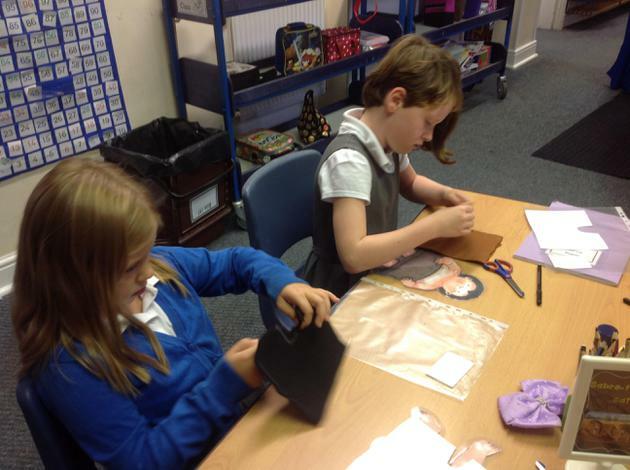 Next we faced the task of making the trousers using new sewing skills. 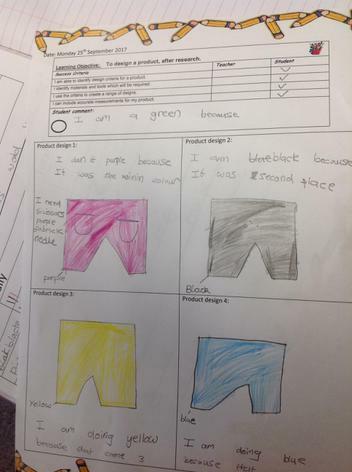 Come and see some of our trousers on display at the market place on Monday! 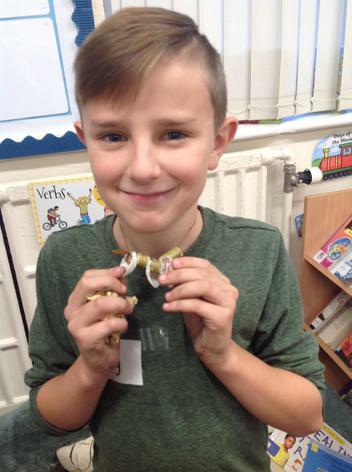 In the story, Ug only ate meat- we discussed healthy eating and the food groups and realised he was missing some things to ensure he had a balanced diet. 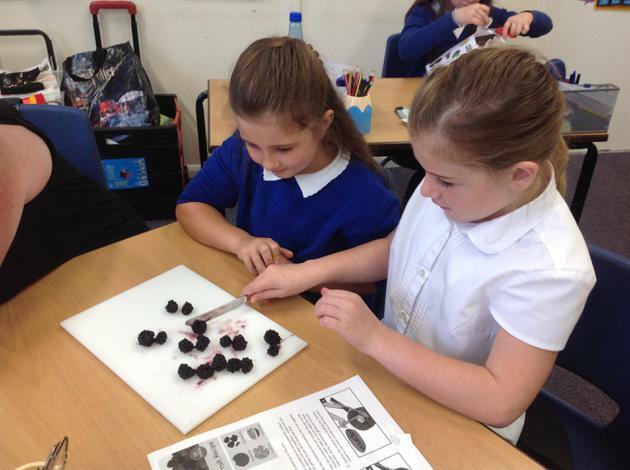 We decided to create a fruit stew, we weighed out our ingredients (and even had to divide the measurements in the recipe by four!) 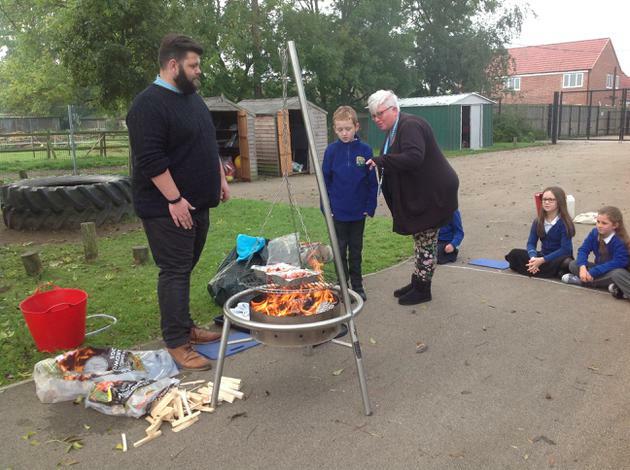 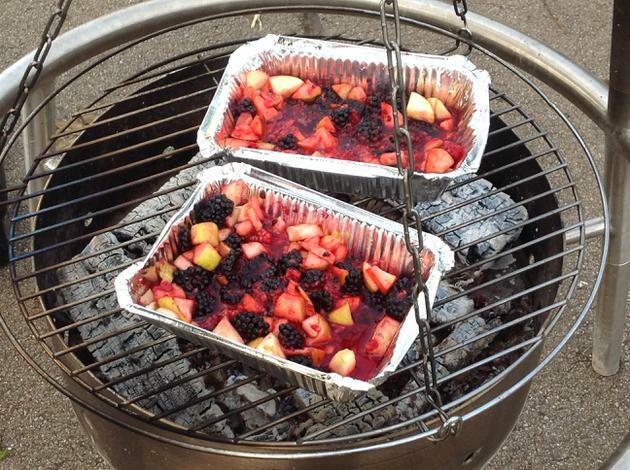 and then cooked it on the fire. 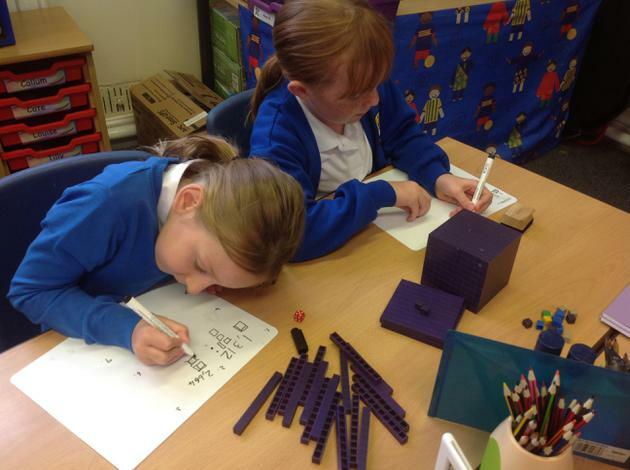 In Maths this week, we have been working hard to solve a range of addition sums. 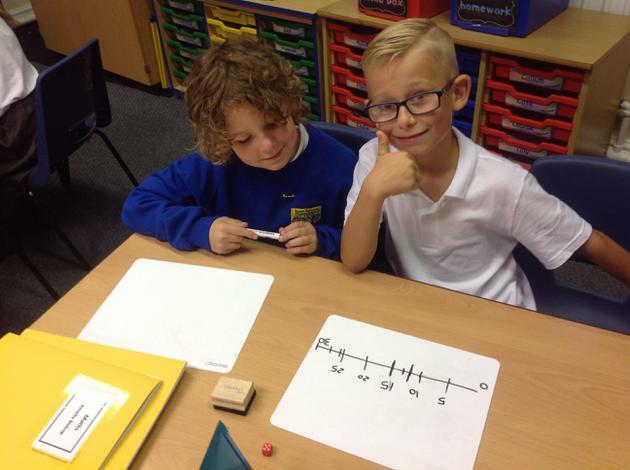 We started by using practical resources to add and progressed to partitioning on a number line. 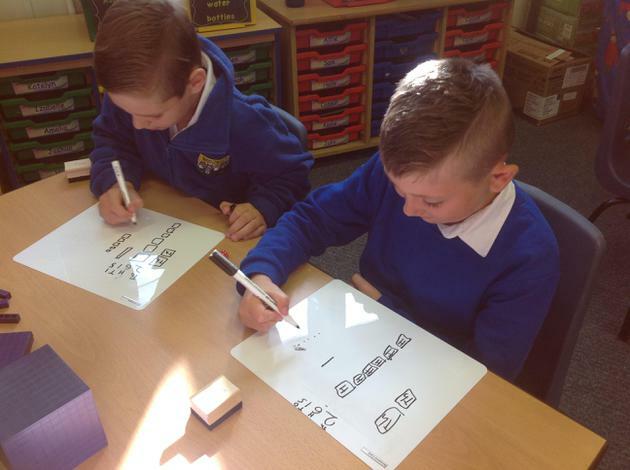 We also learnt about the equals side and began to balance equations- we found it quite tricky but persevered until we found success. 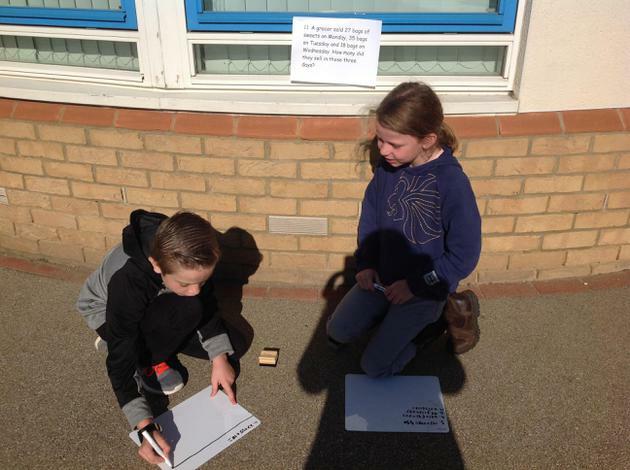 On Friday we applied all of this to solving word problems, which were in our outdoor environment. 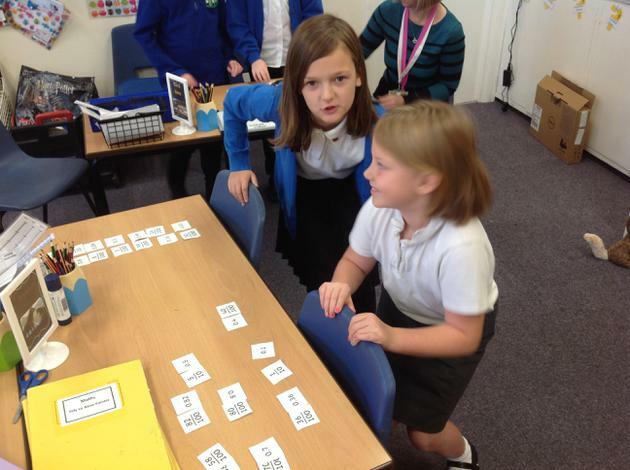 It was great to hear lots of mathematical vocabulary being used. 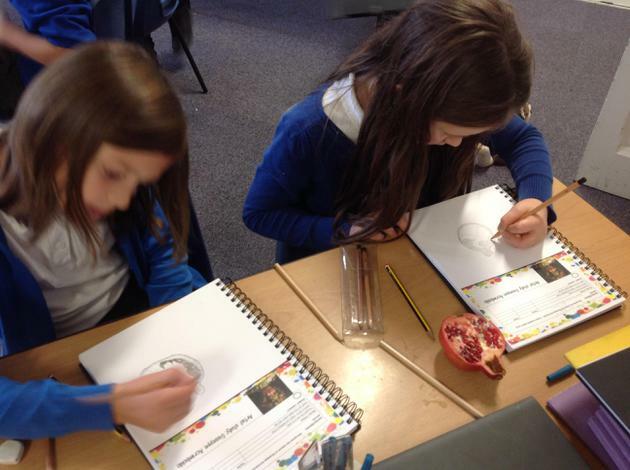 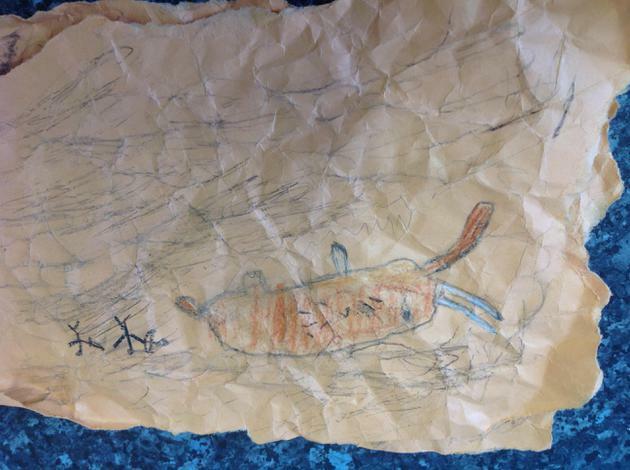 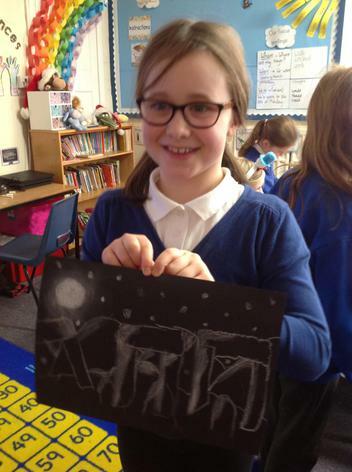 We have been learning about Stone age cave art. 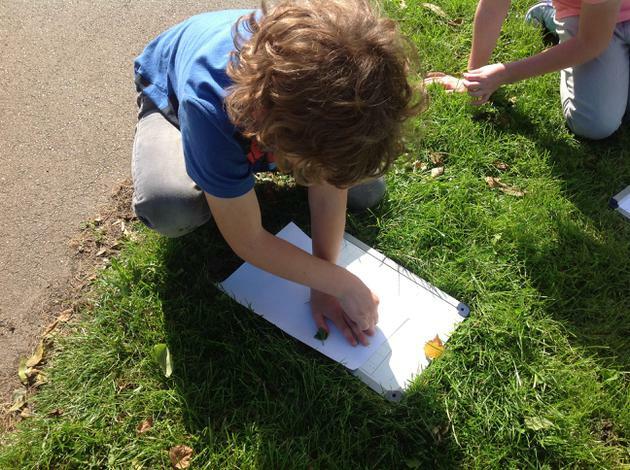 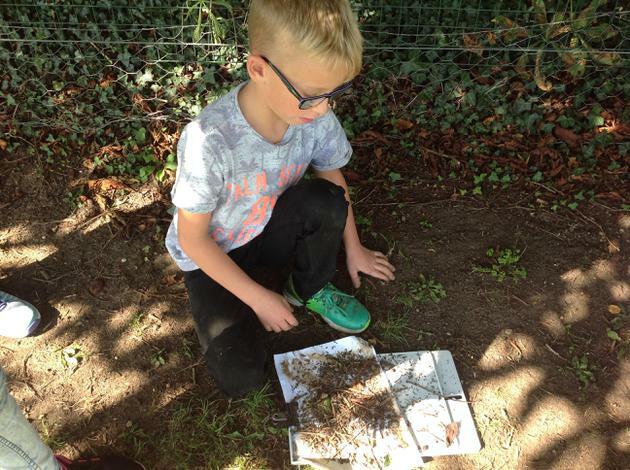 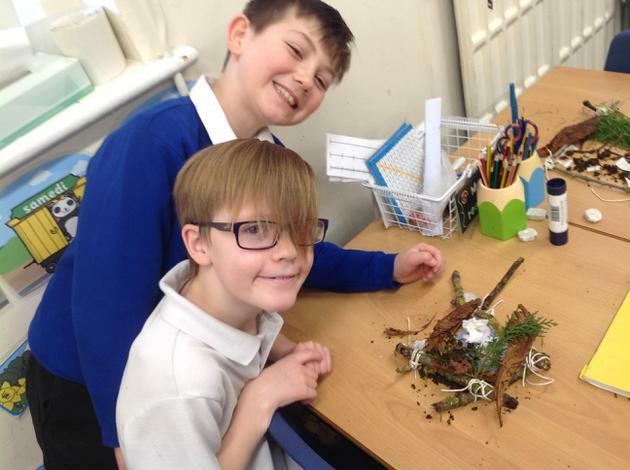 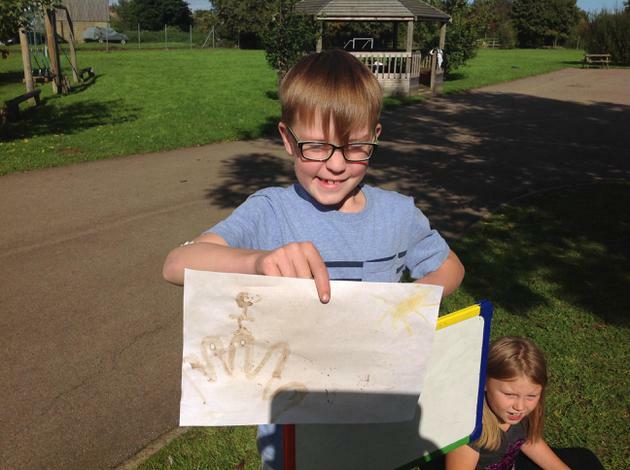 We thought about the materials which would have been used and considered how we could make our own art using the resources in our local environment. 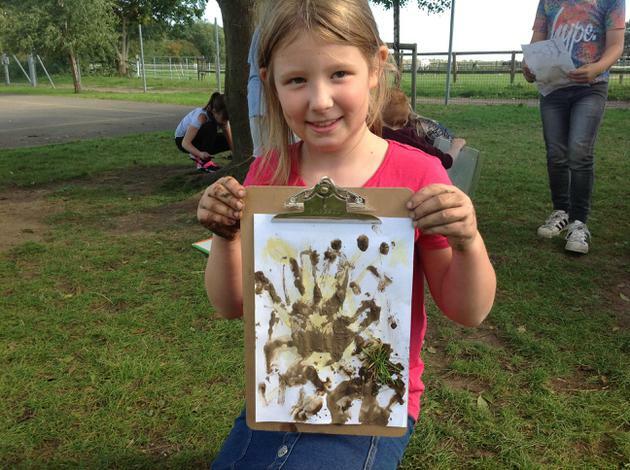 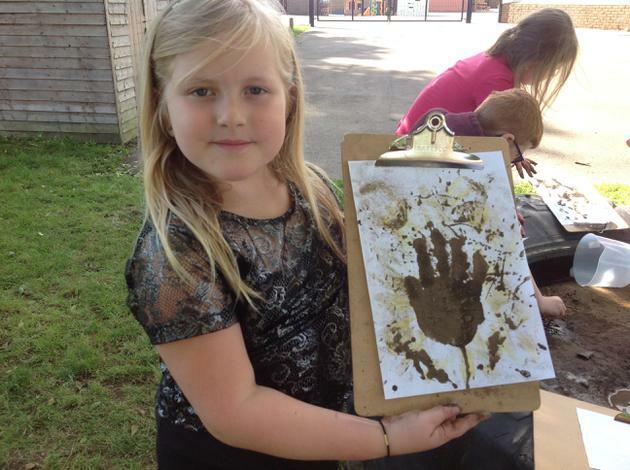 We managed to get some really vivid colours using dandelions and grass and quite enjoyed getting our hands muddy! 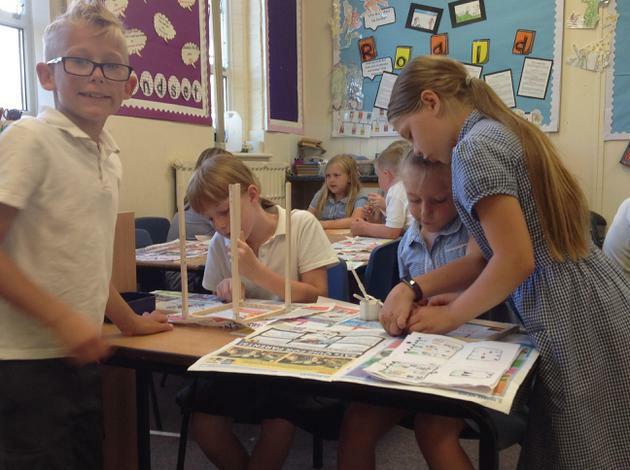 Our first full week in year four has been a real success! 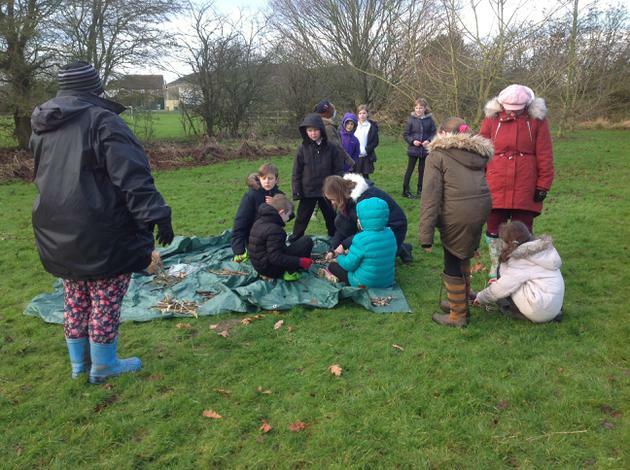 Have a look at what we have been doing below- don't forget our welcome meeting is on Monday straight after school in the hall. 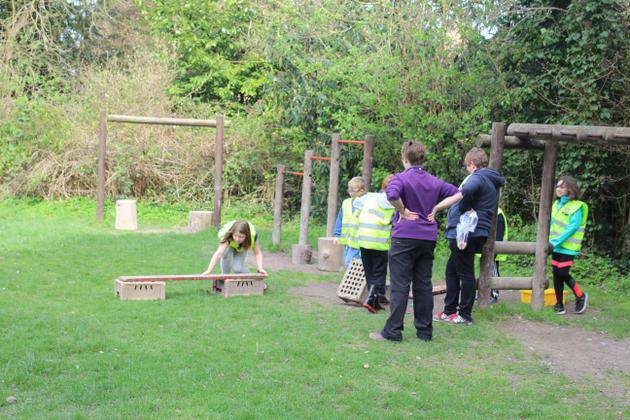 We'd love to see as many parents there as possible. 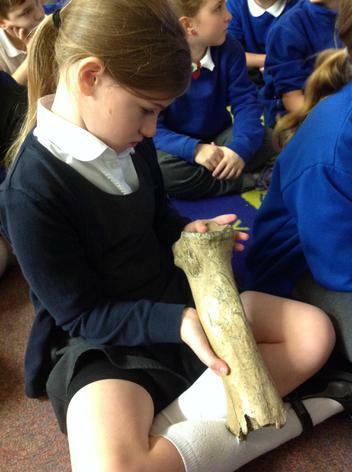 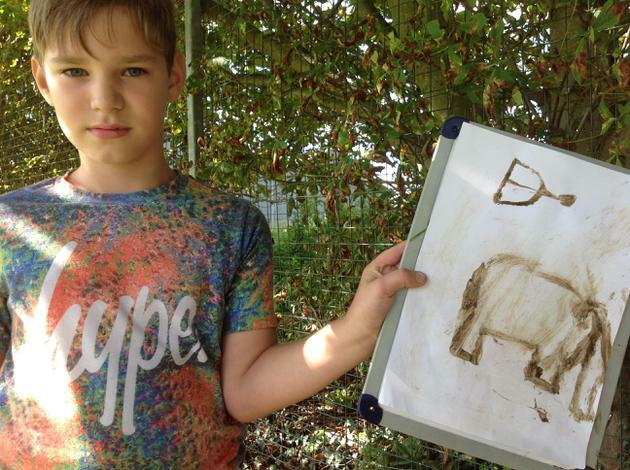 This story really sparked our interest in the Stone Age. 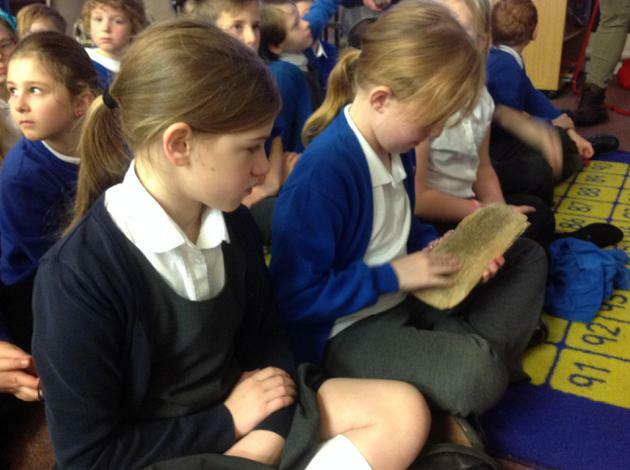 One child was really intrigued by how Ug would have got his food and decided to use the class laptop to research Stone Age weapons. 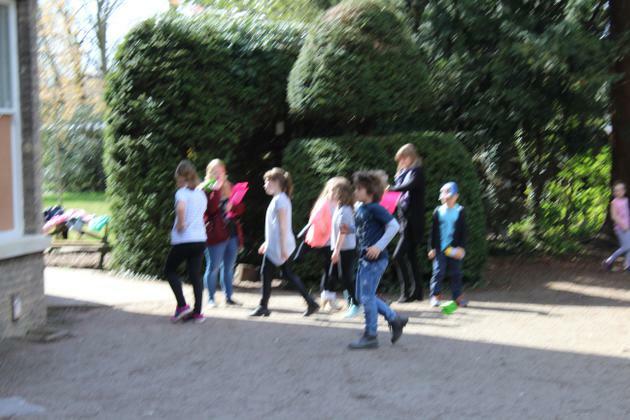 He was soon joined by others who were also interested. 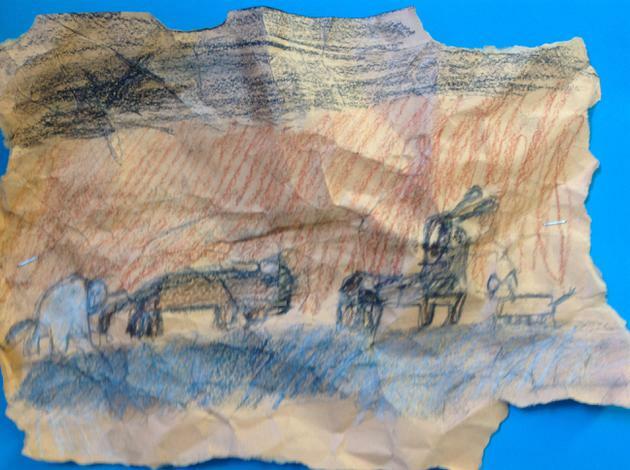 We also noticed that Ug painted on the wall in the story. 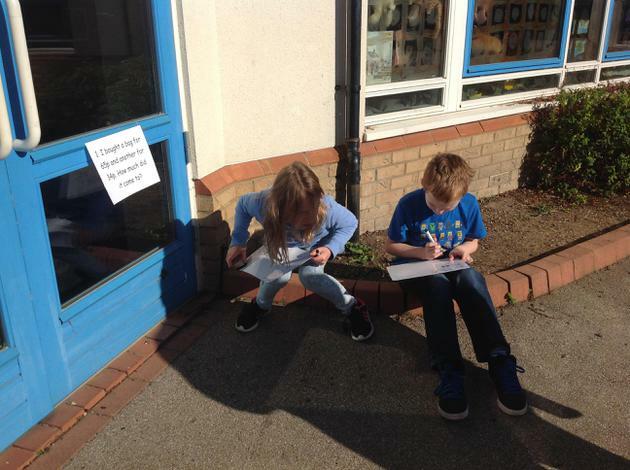 We came up with lots of questions about this including 'What did they paint?' 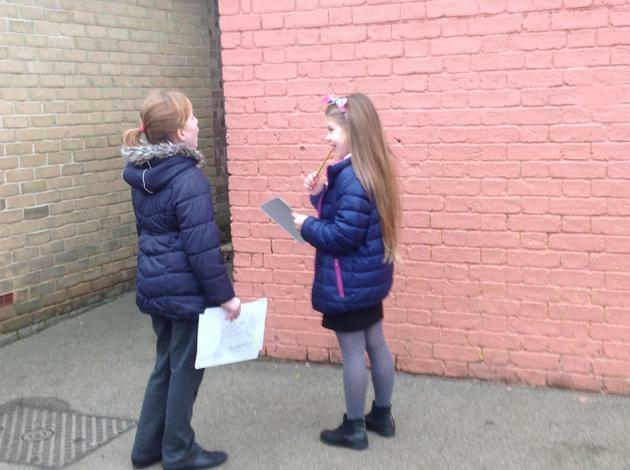 and 'How did they paint on the walls?'. 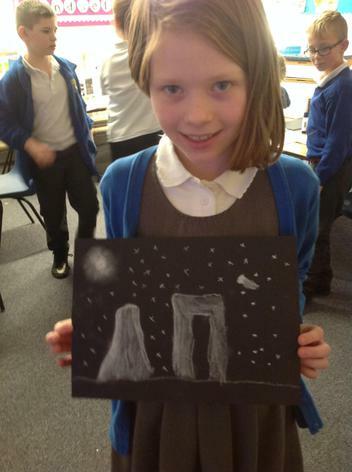 We found some of our answers by looking at photos of cave paintings and decided to have a go at creating our own using charcoal and paper. 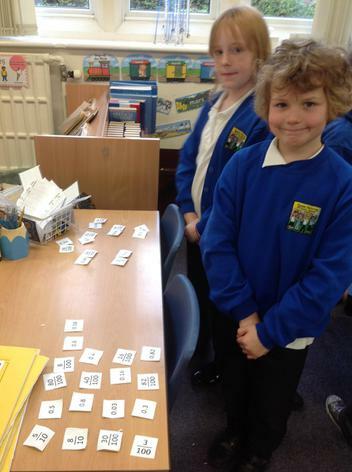 In Maths this week, we have been working hard to recognise the place value of numbers with up to 4 digits. 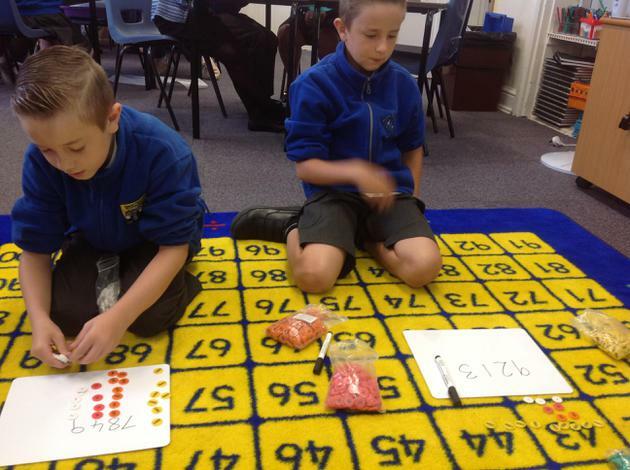 We started by building numbers using base ten, before learning how to use pictures to represent numbers. 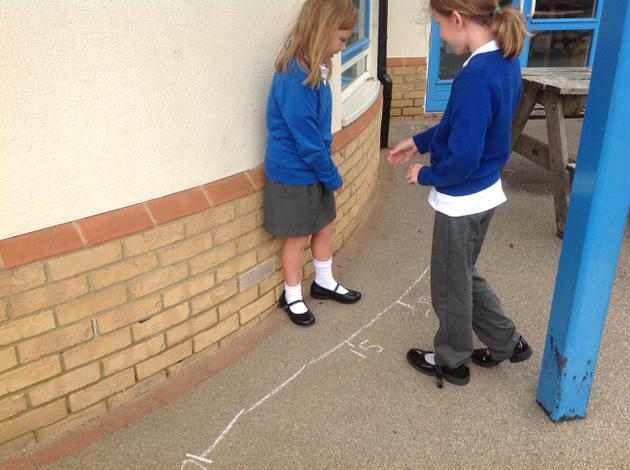 Towards the end of the week we used this to order numbers and position them on a number line. 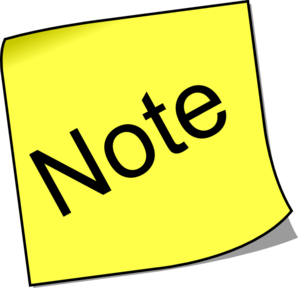 Please note: Our PE days will be on Mondays and Tuesdays. 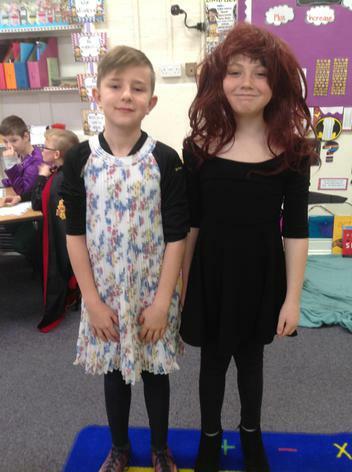 Please make sure your children have their PE kits in school on these days.